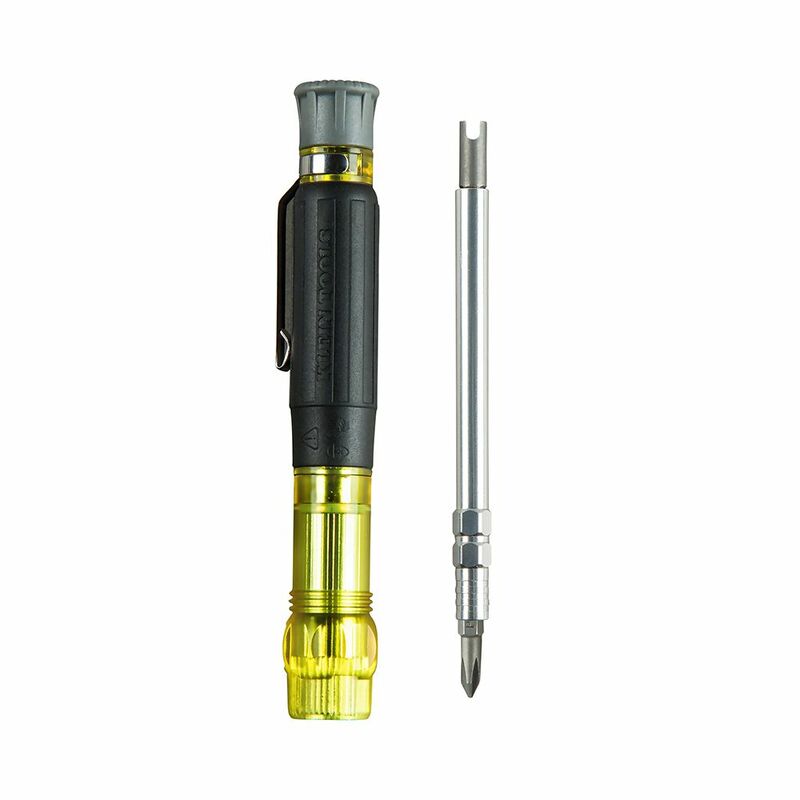 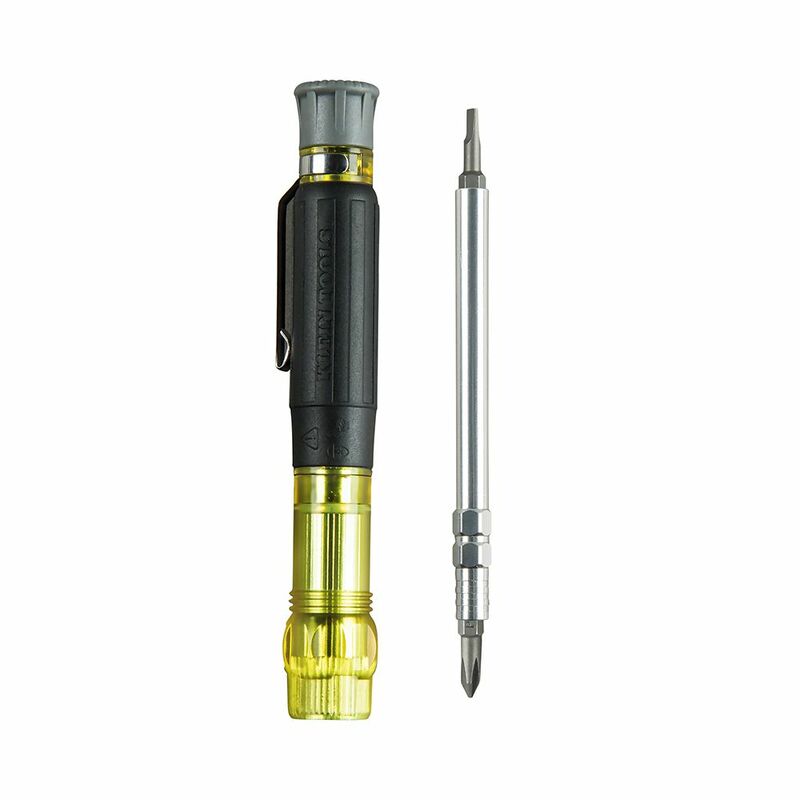 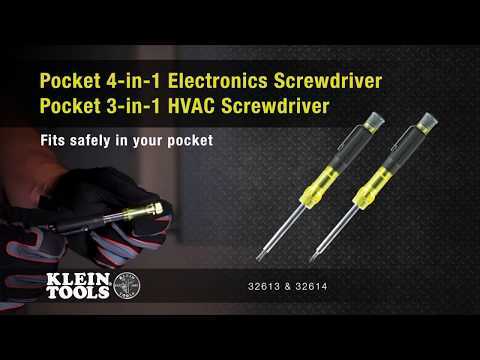 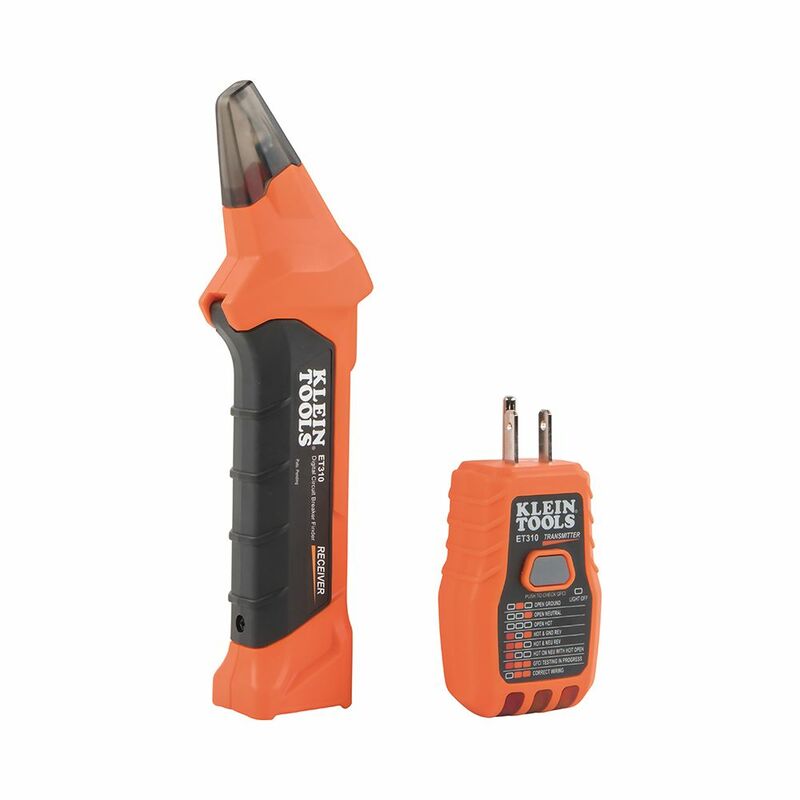 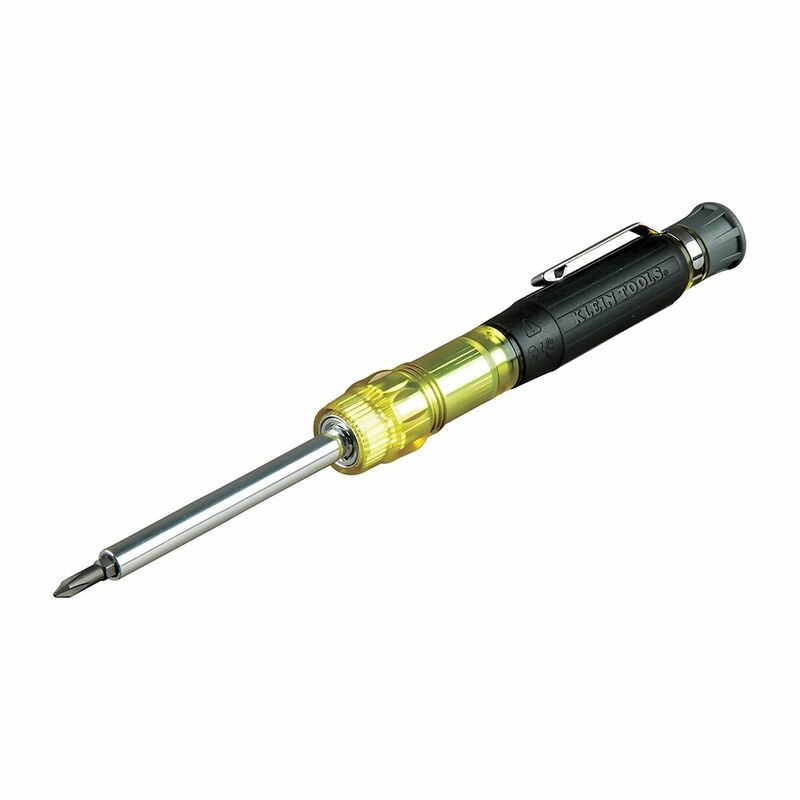 The Pocket 4-in-1 Electronics Screwdriver has a concealable tip and a pocket clip for convenient pocket storage. 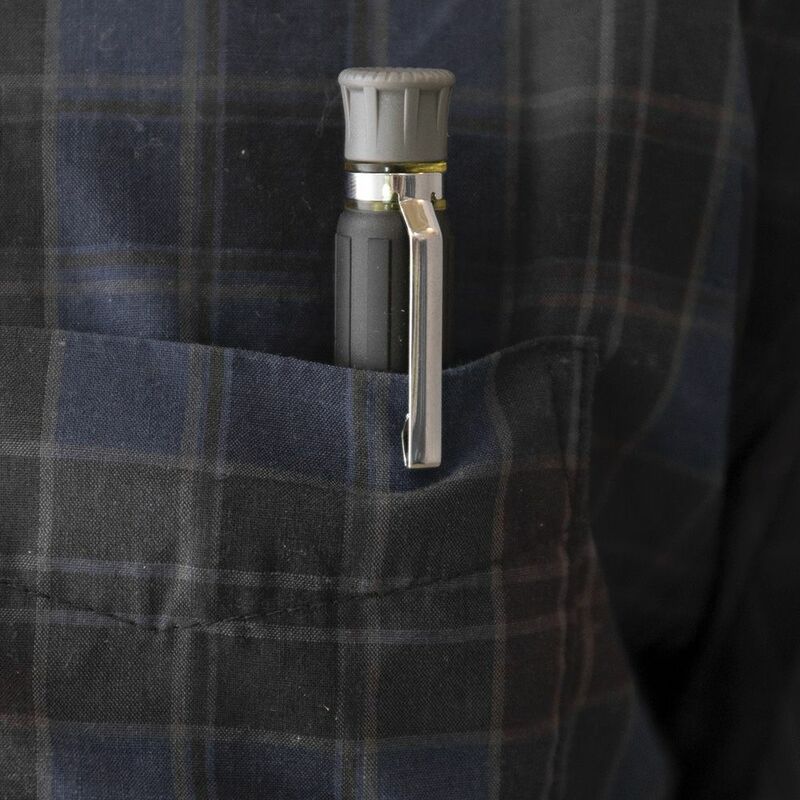 To use, simply slide the cuff back to expose the tip and shaft. 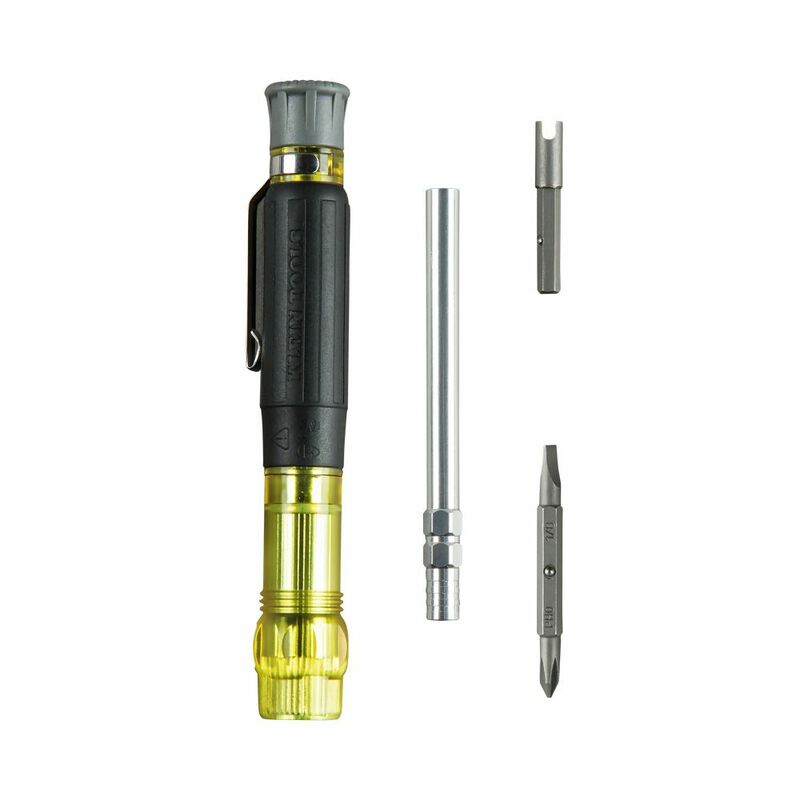 Flip the barrel to the long-side shaft to extend your reach. 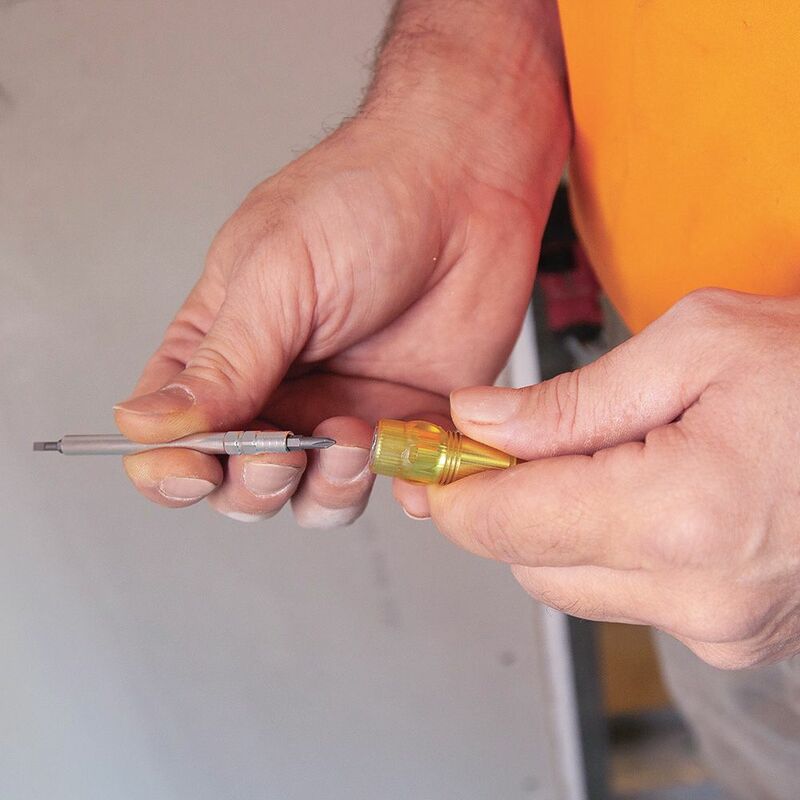 This driver is designed for precision work. 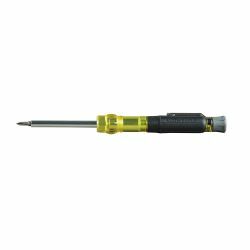 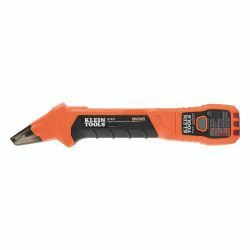 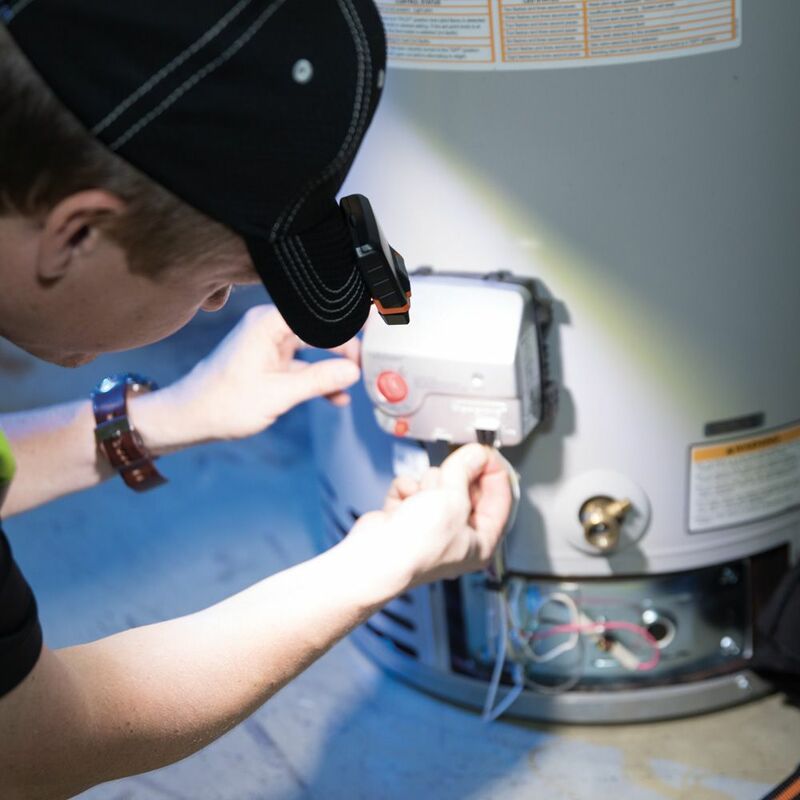 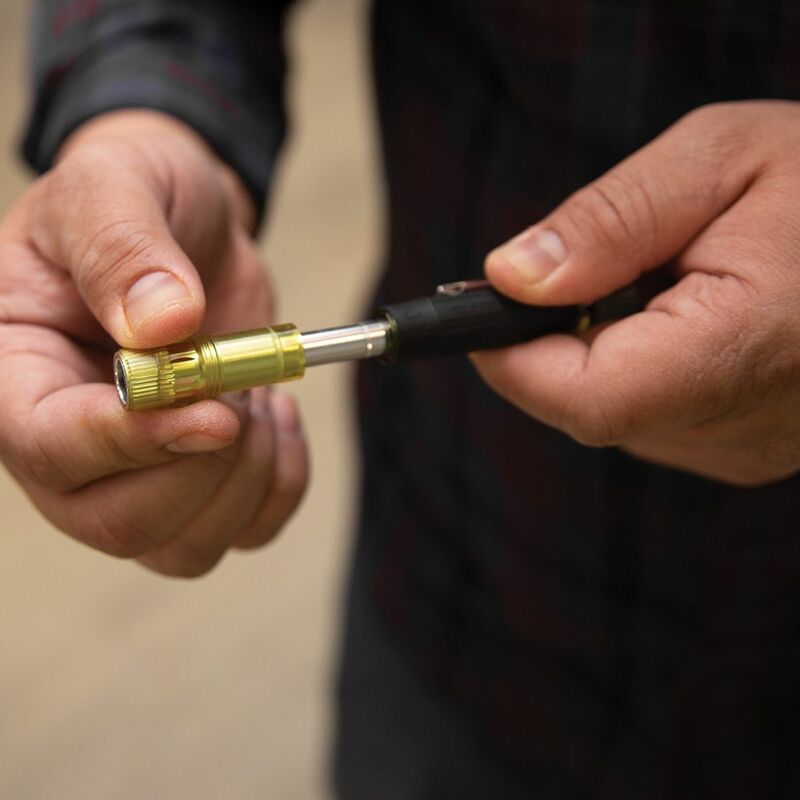 It features a swivel cap for optimum control, outstanding comfort with our exclusive cushion-grip handle, and precision milled tips to fit screw openings securely. 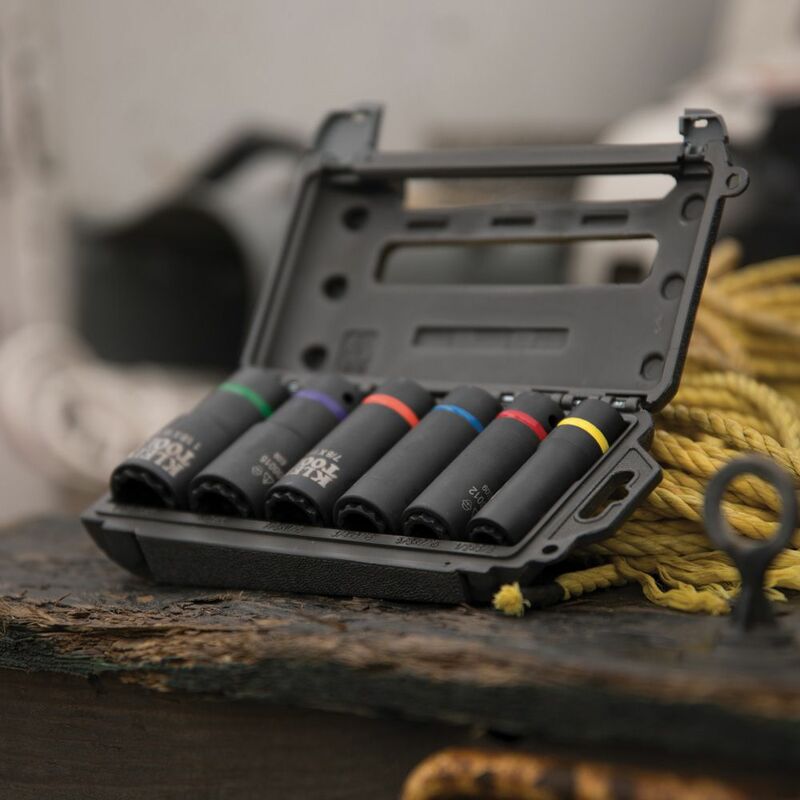 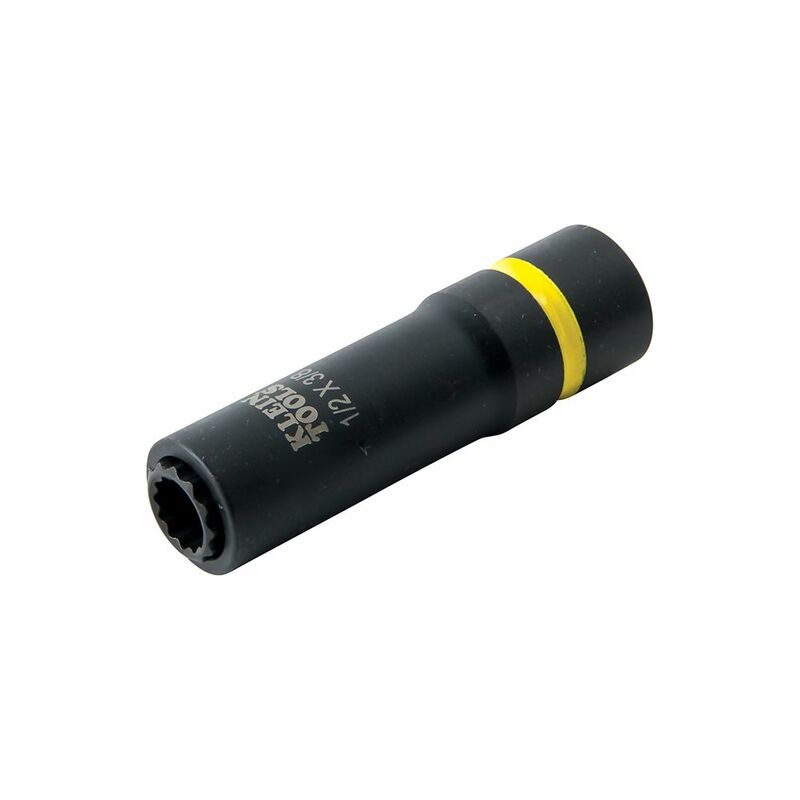 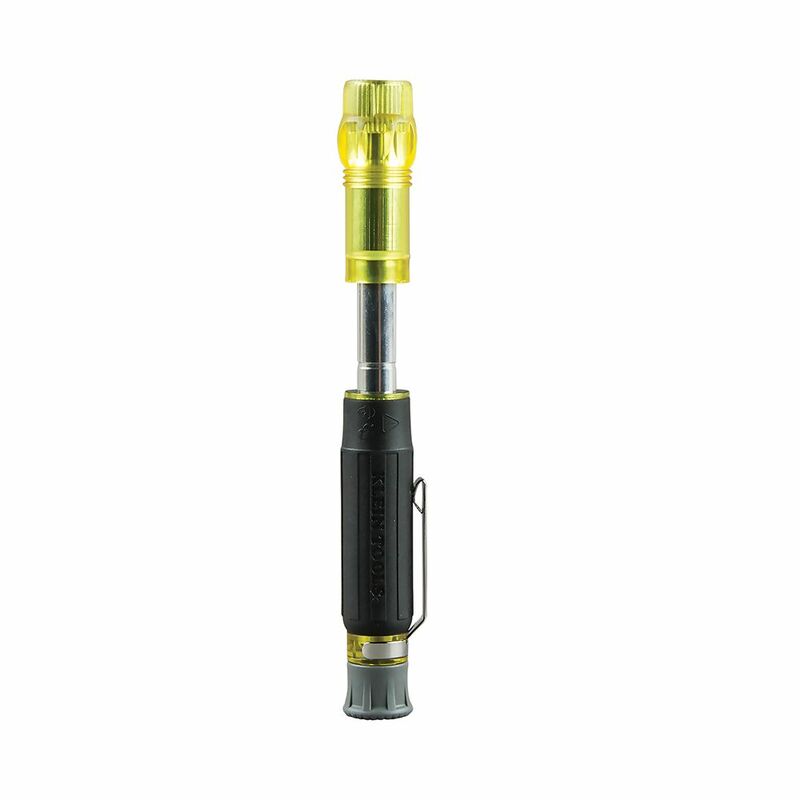 Corrosion-resistant anodized aluminum barrel that includes two double-ended bits made of the highest quality tempered steel, carefully heat-treated for maximum strength. 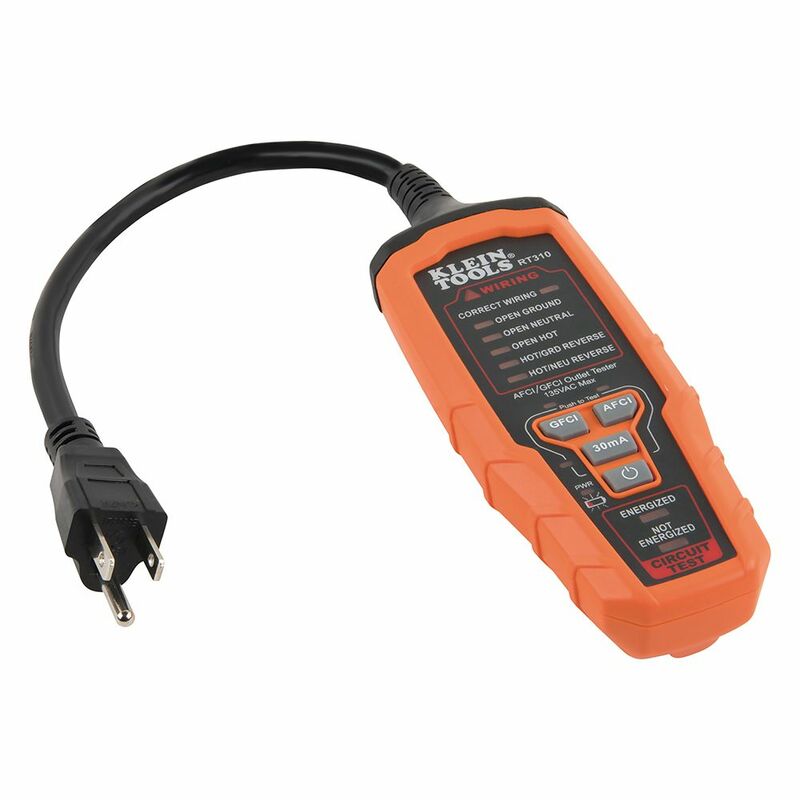 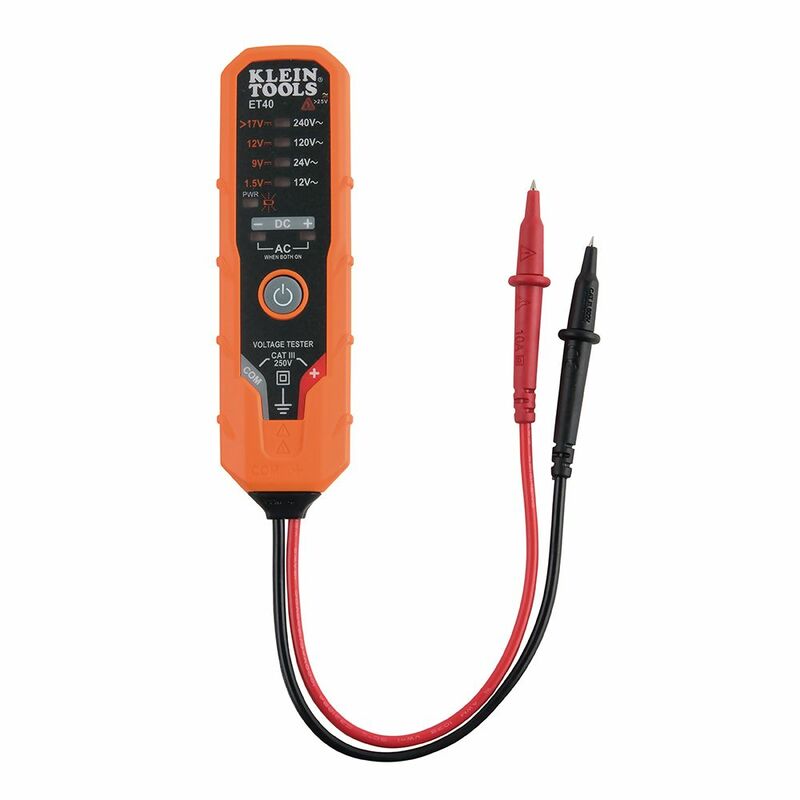 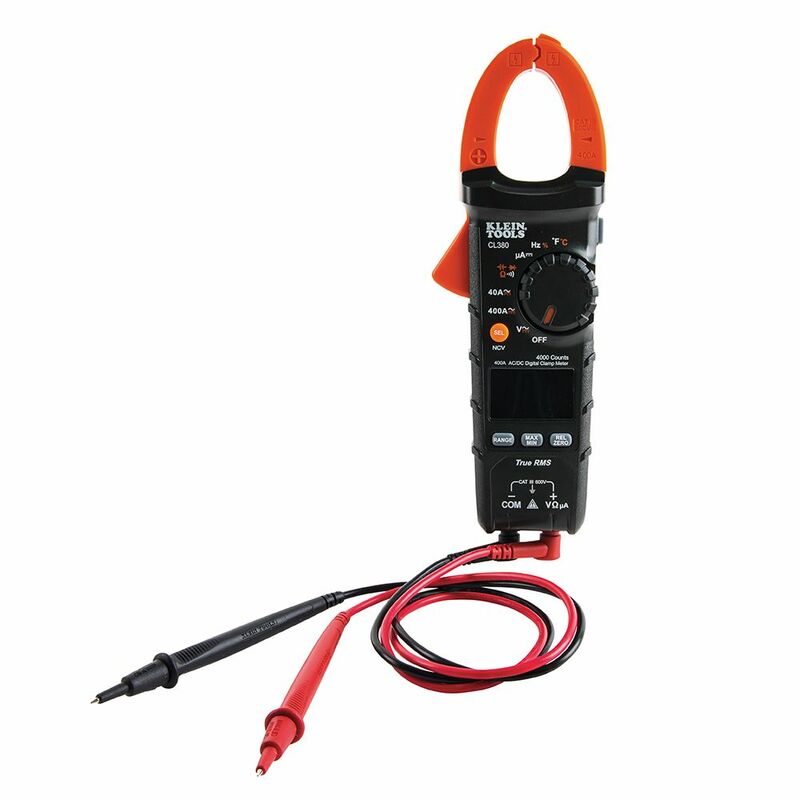 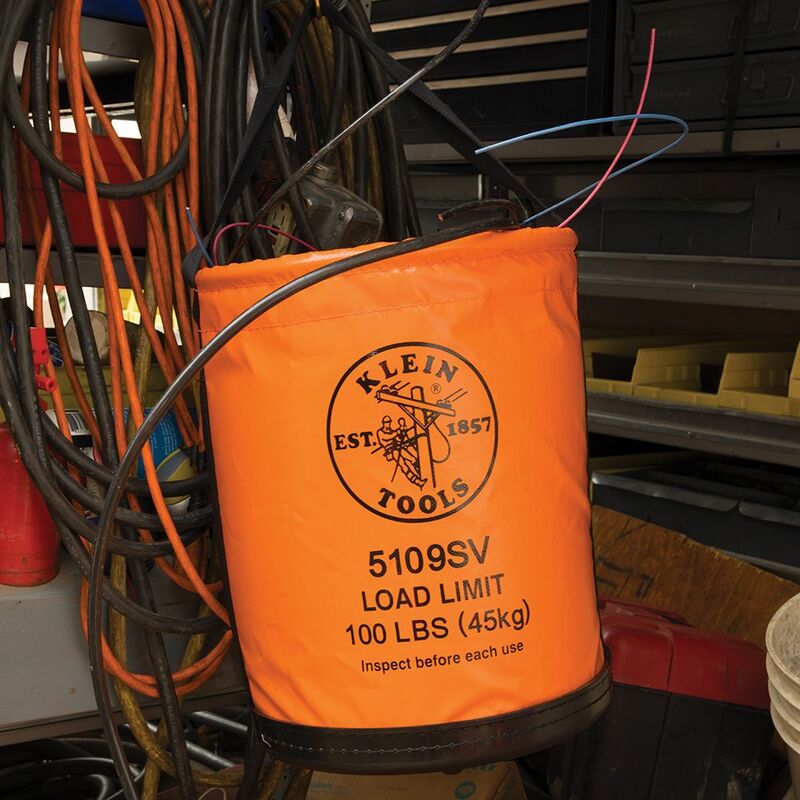 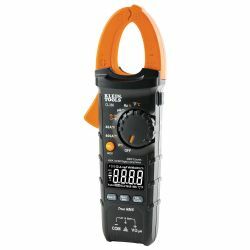 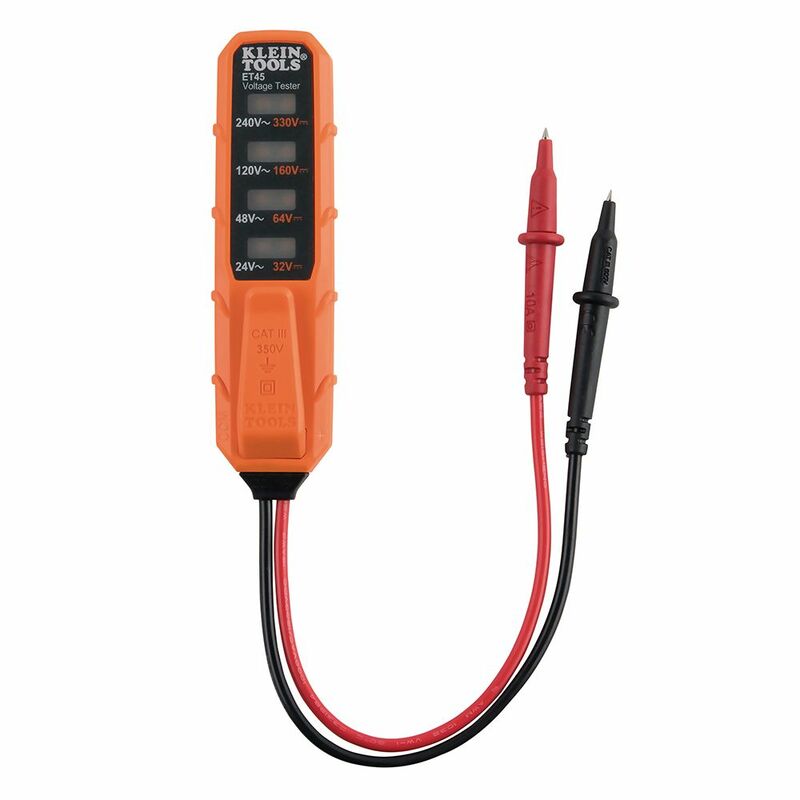 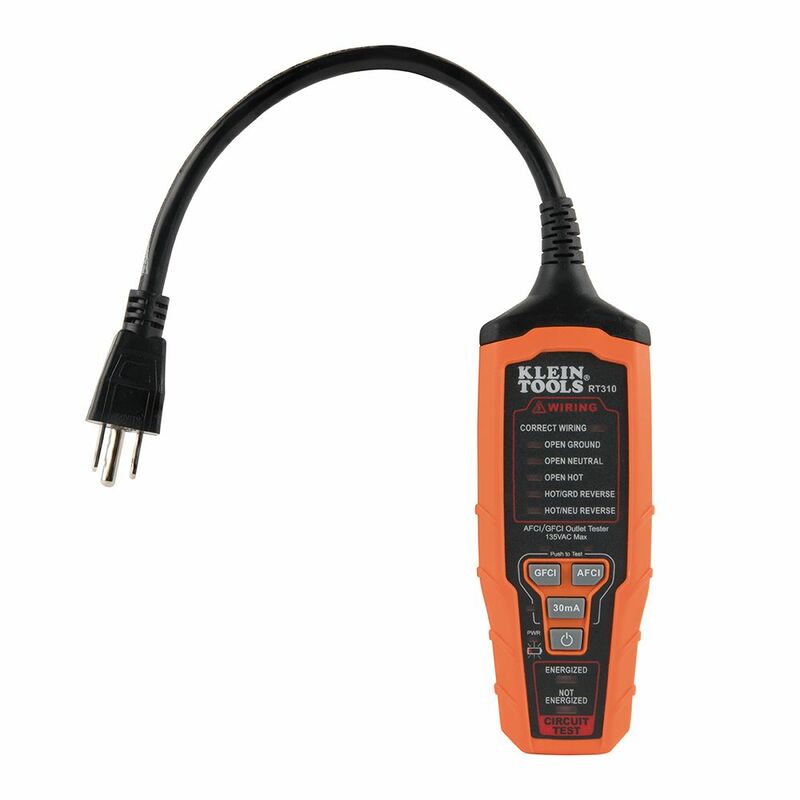 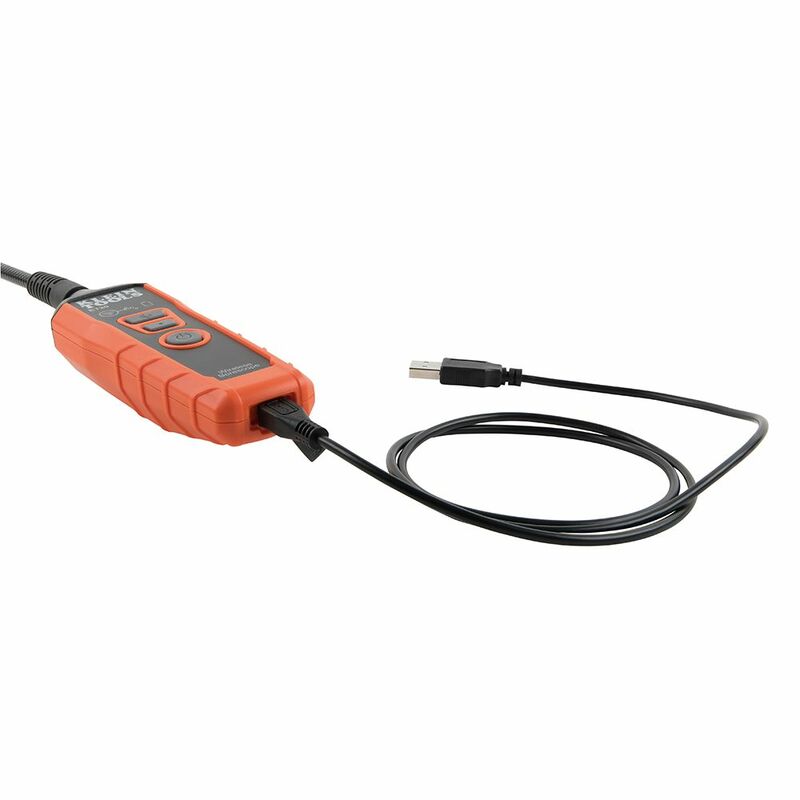 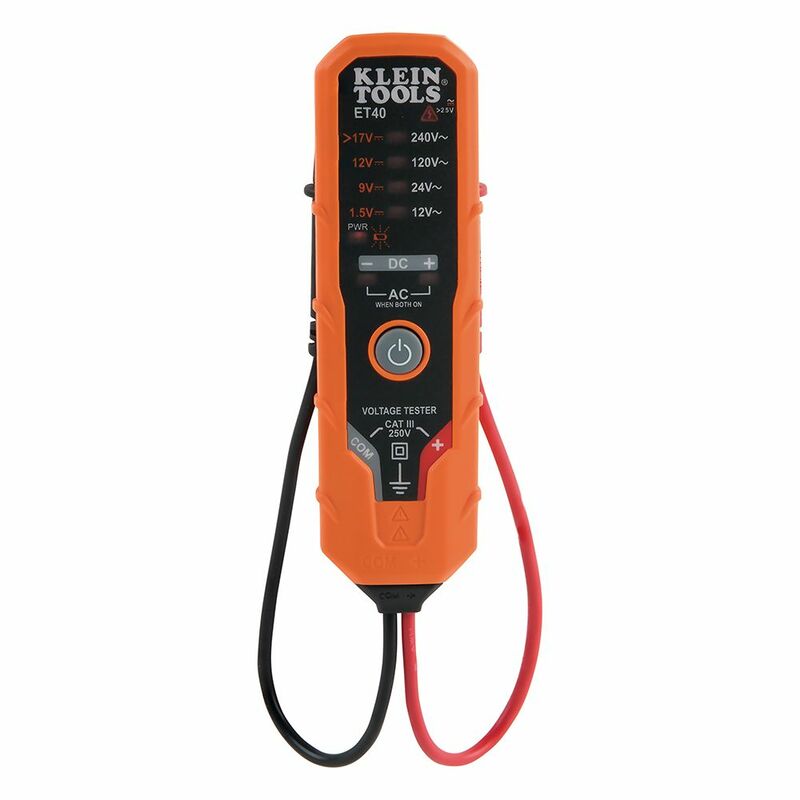 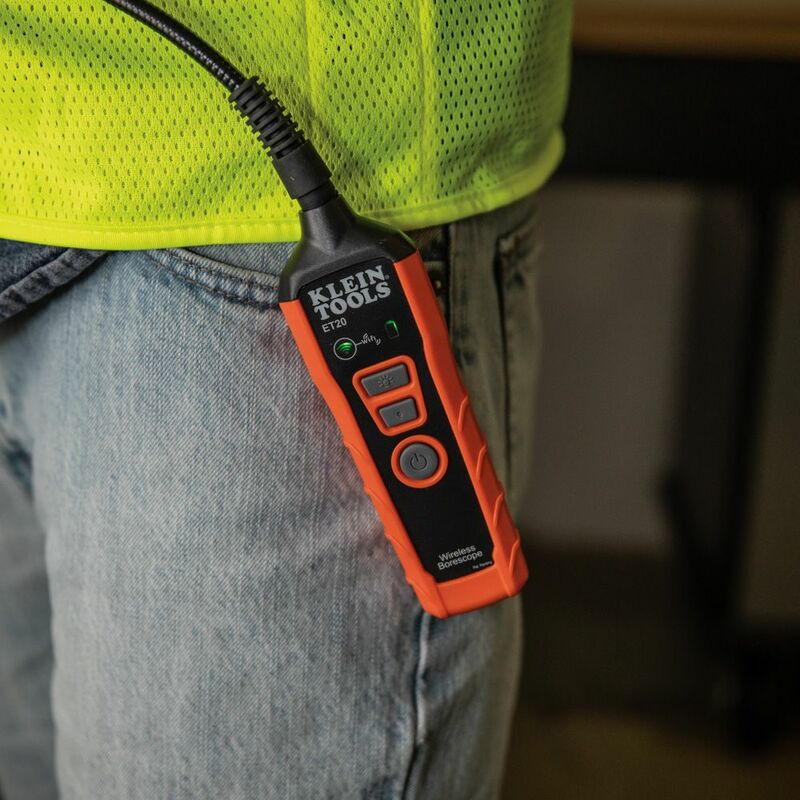 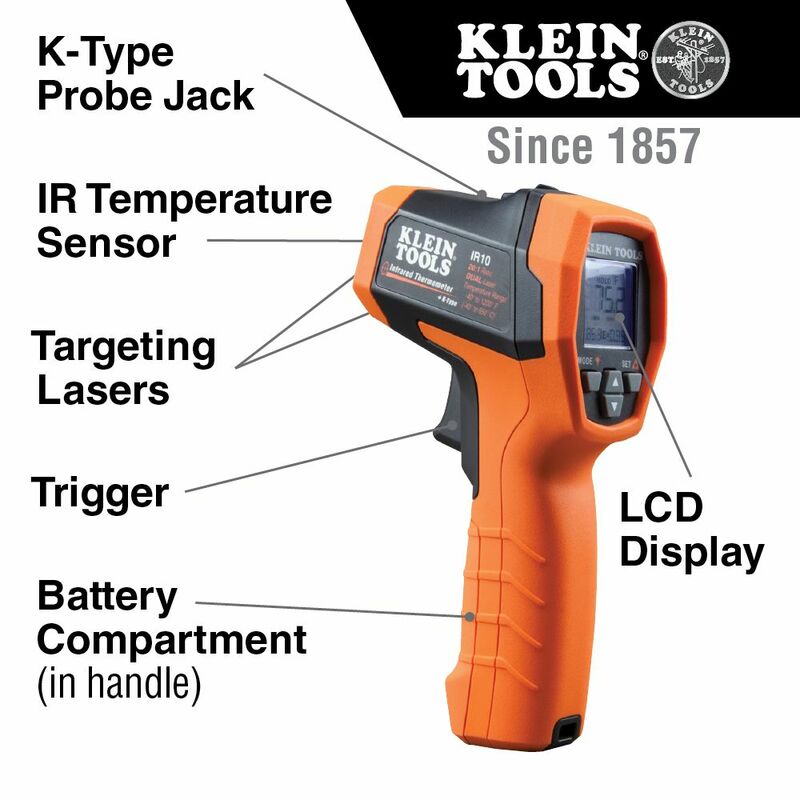 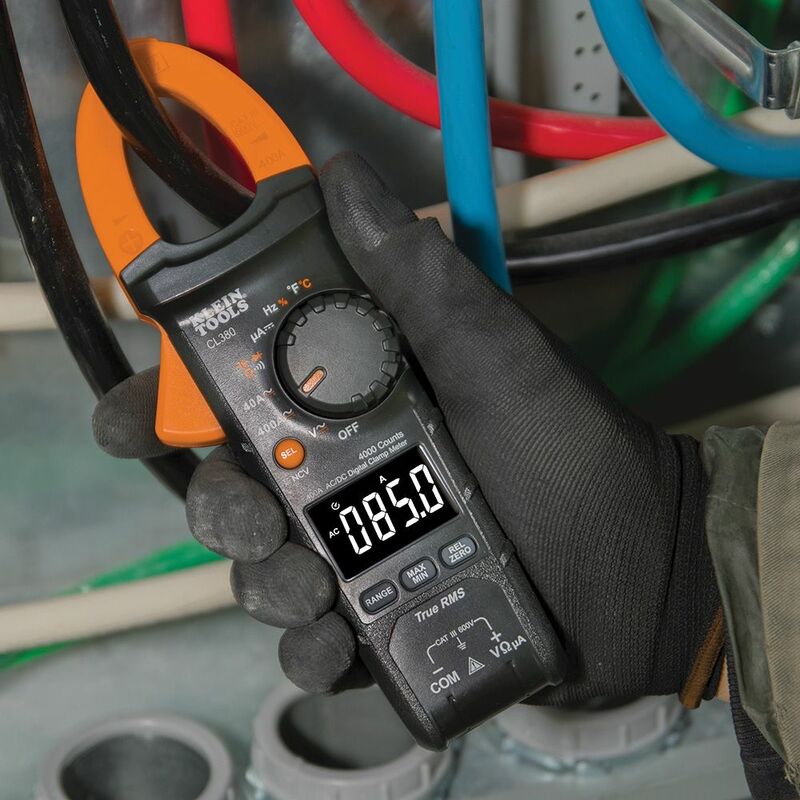 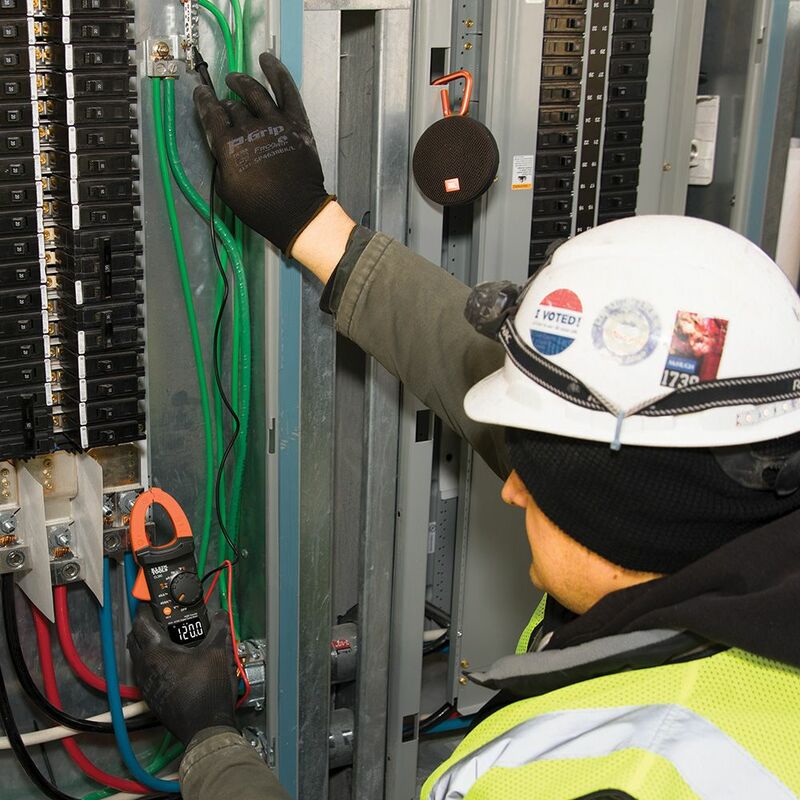 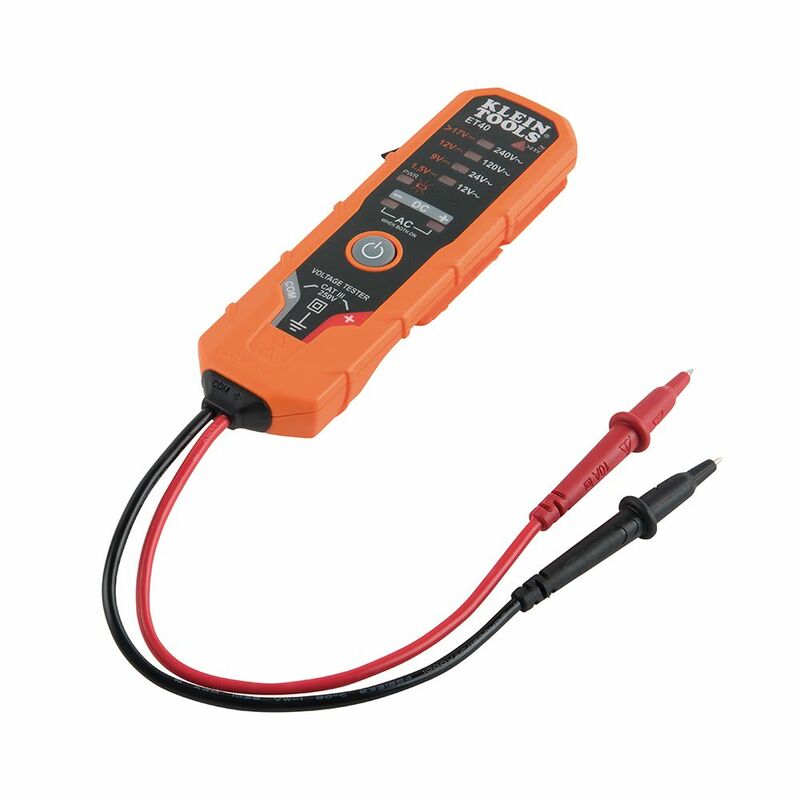 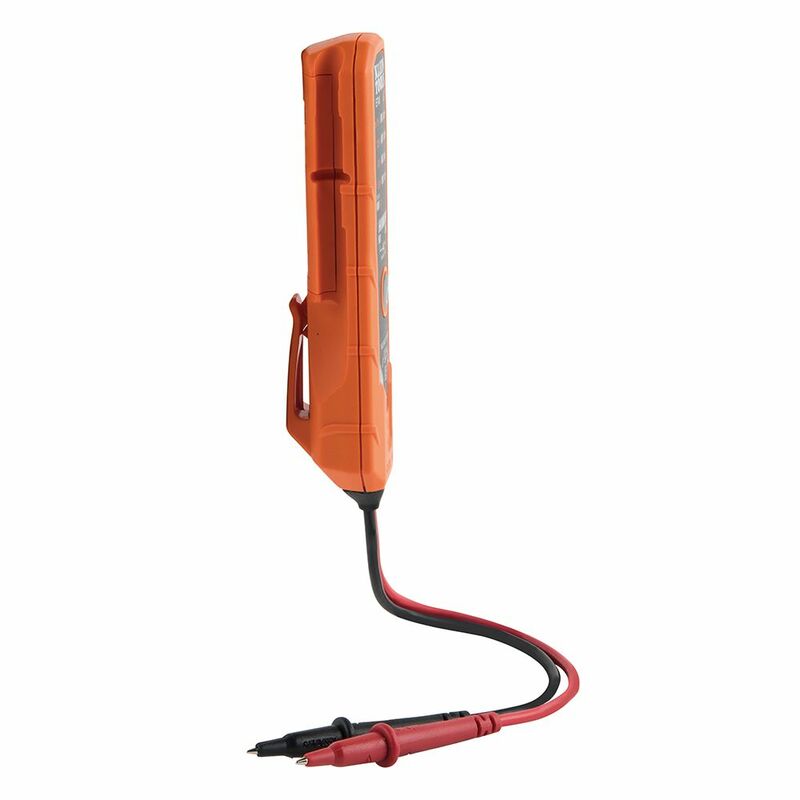 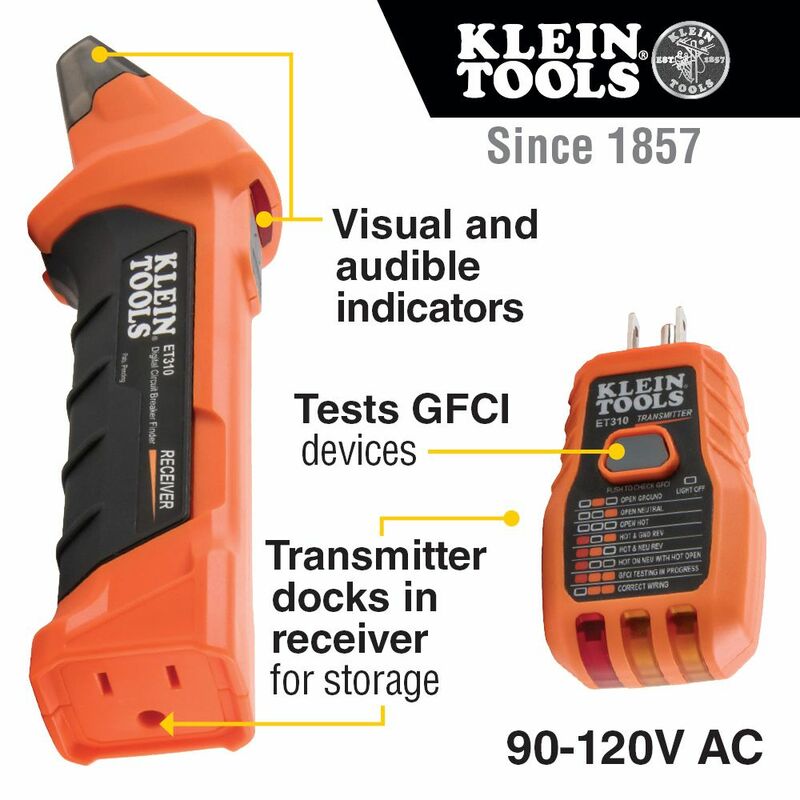 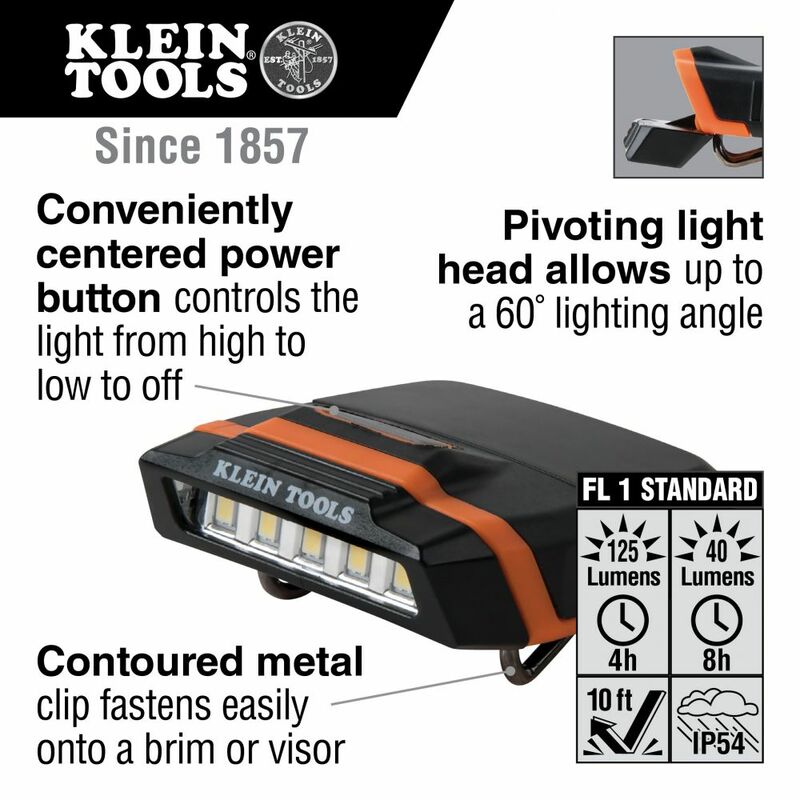 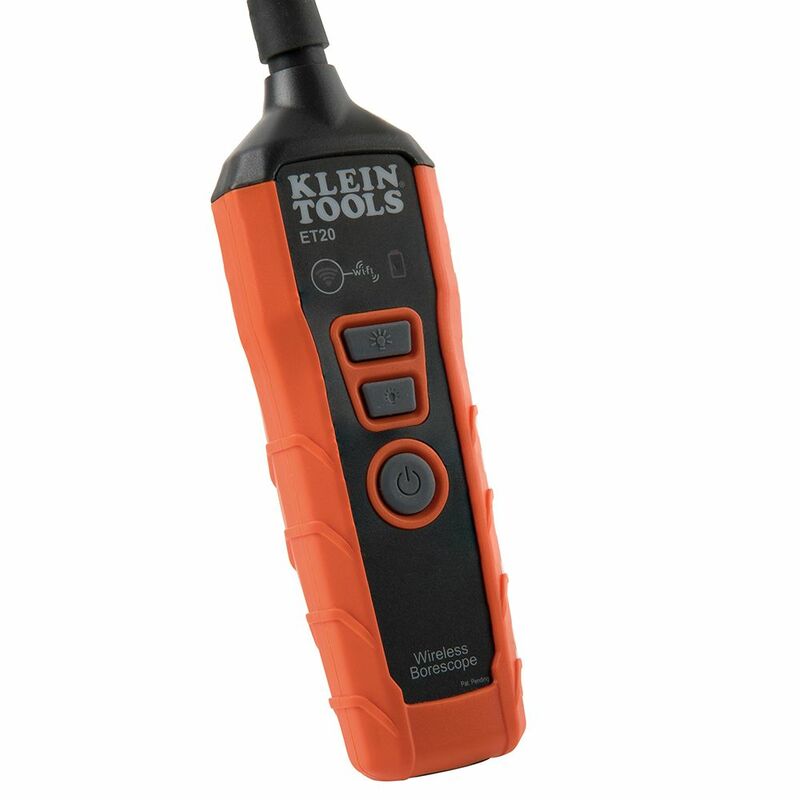 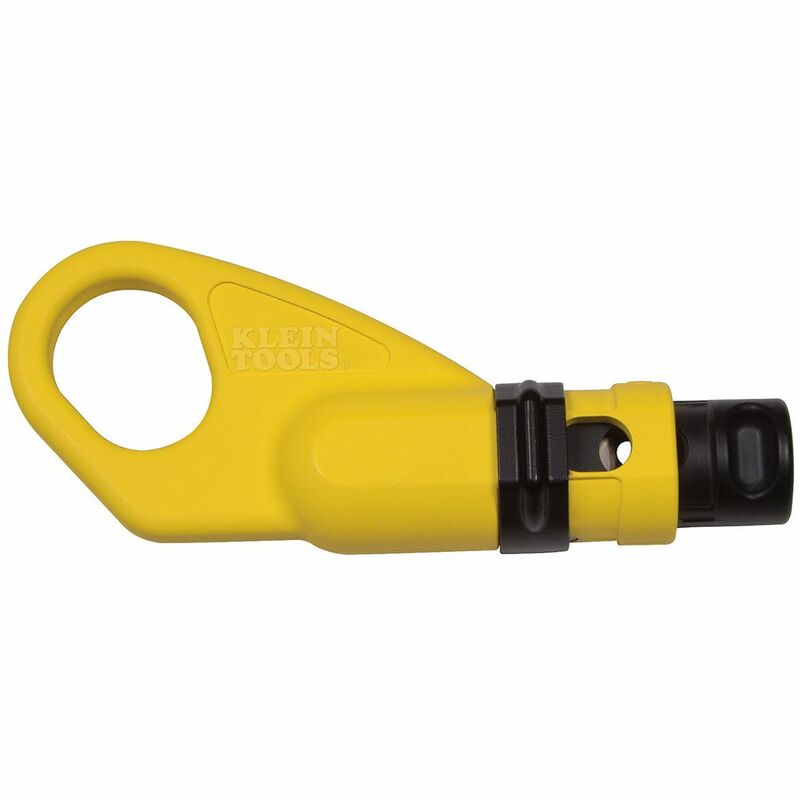 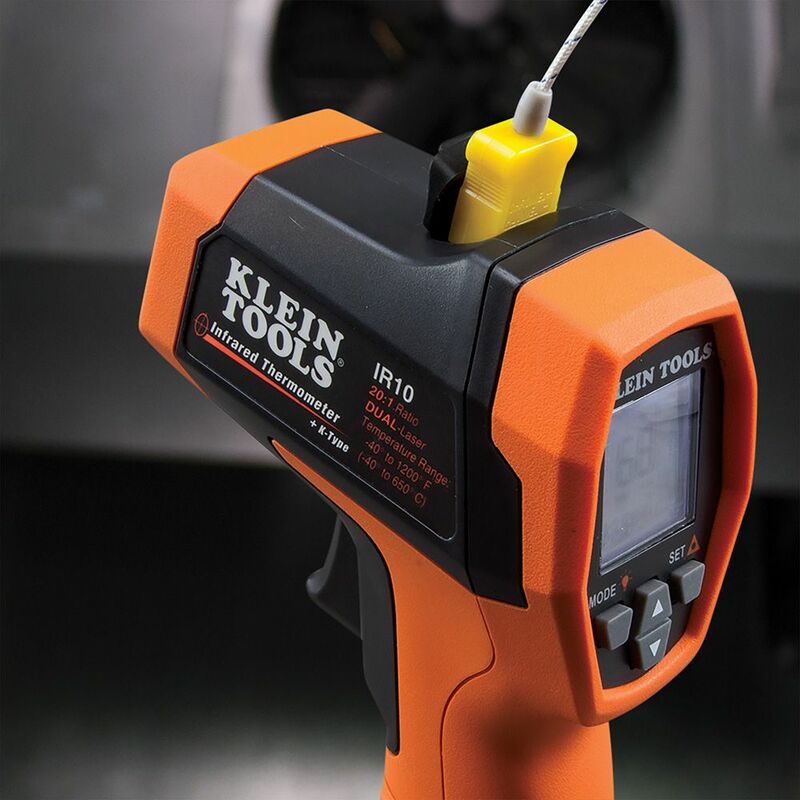 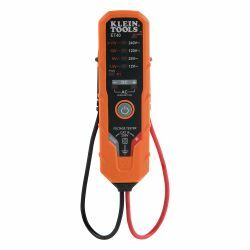 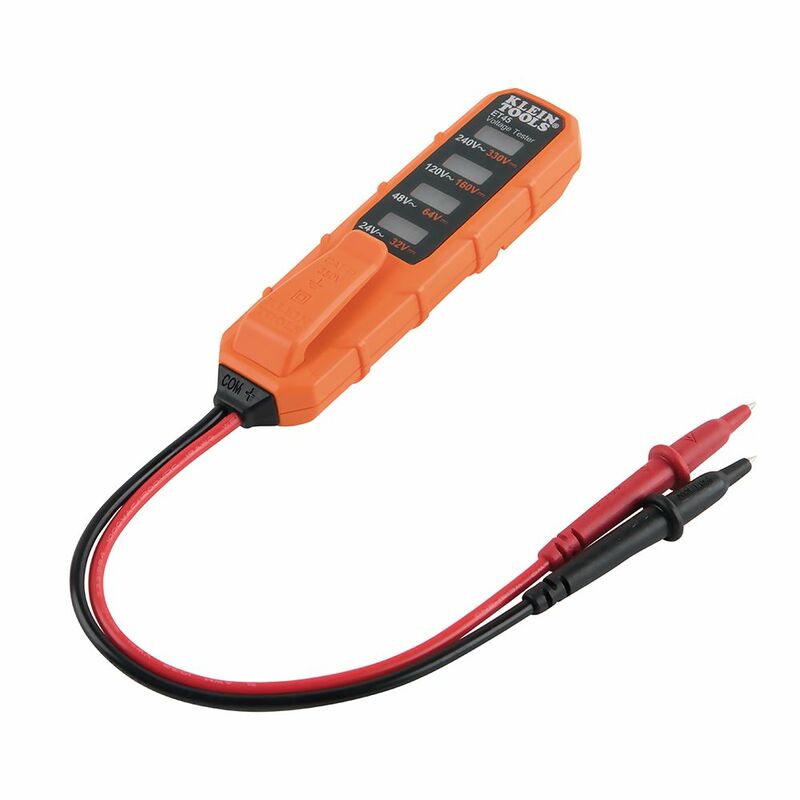 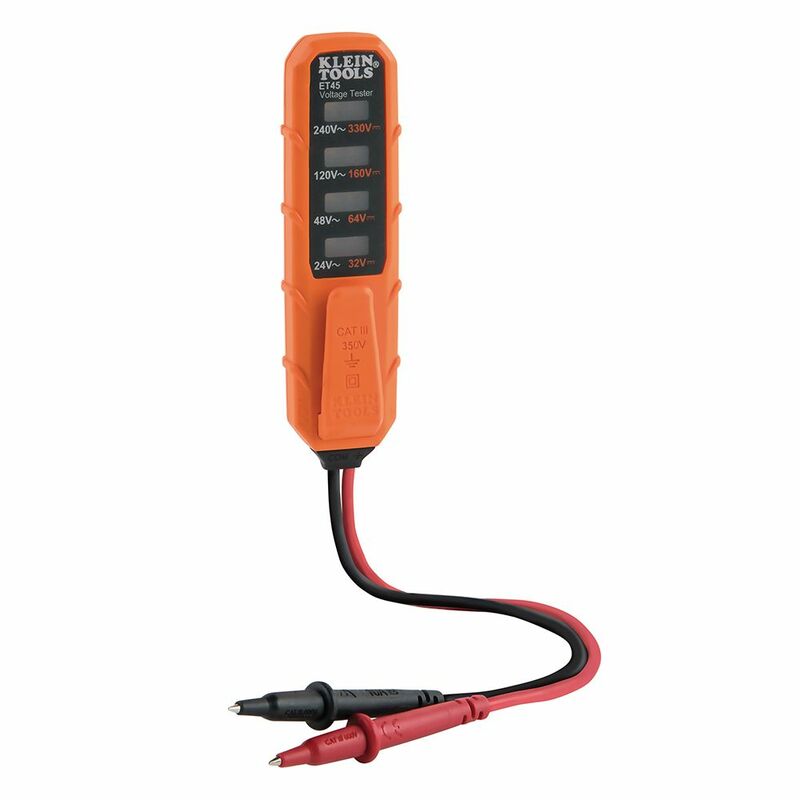 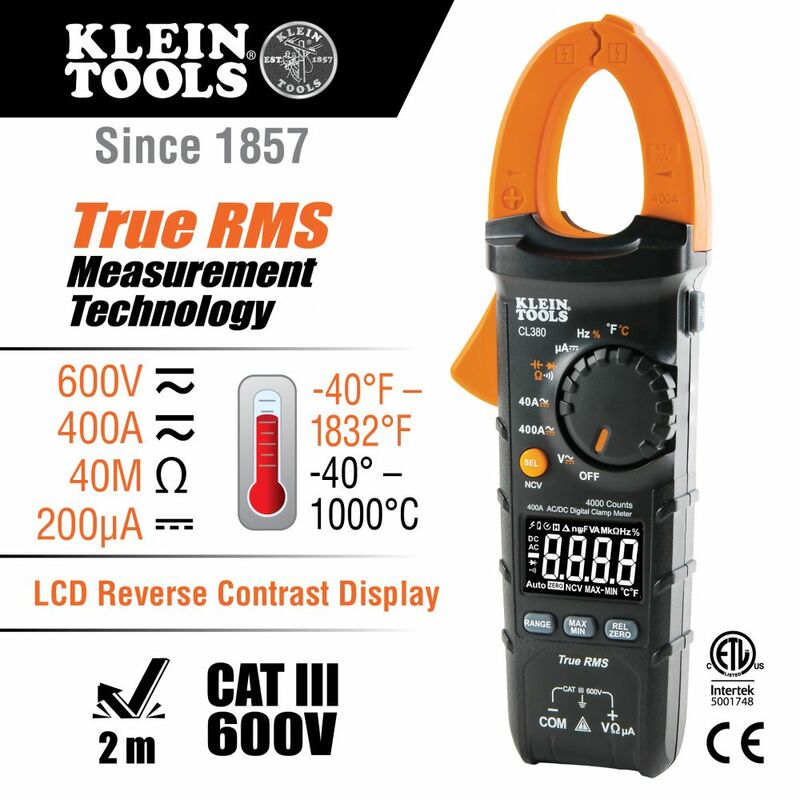 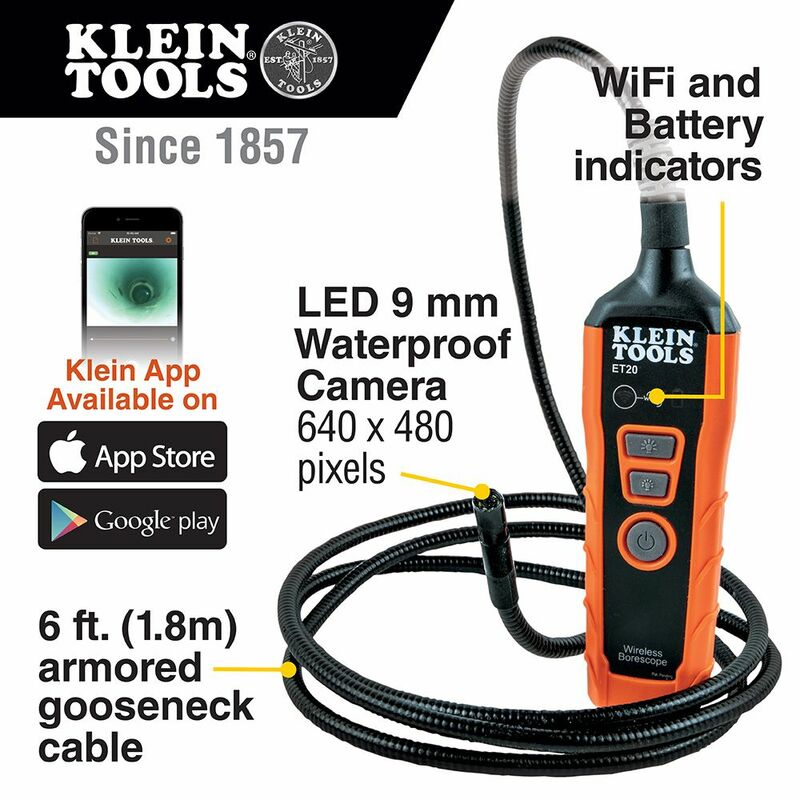 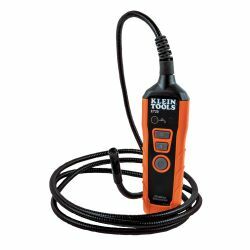 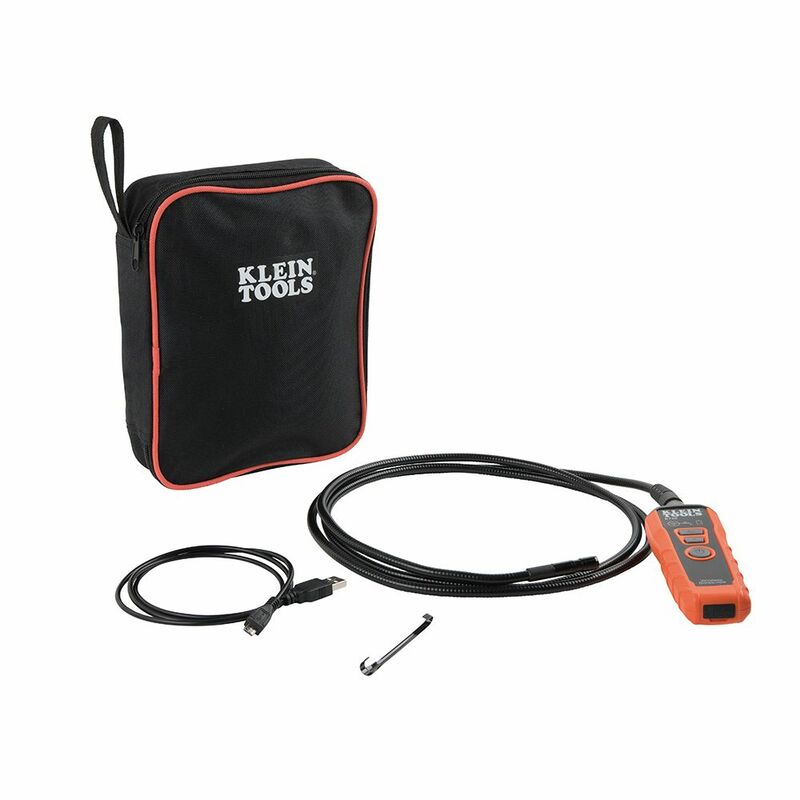 Klein Tools CL380 is an automatically ranging true root mean squared (TRMS) digital clamp meter that measures AC/DC current via the clamp, AC/DC voltage, DC microamps, resistance, continuity, frequency, capacitance, and diodes via test leads, and temperature via a thermocouple probe. 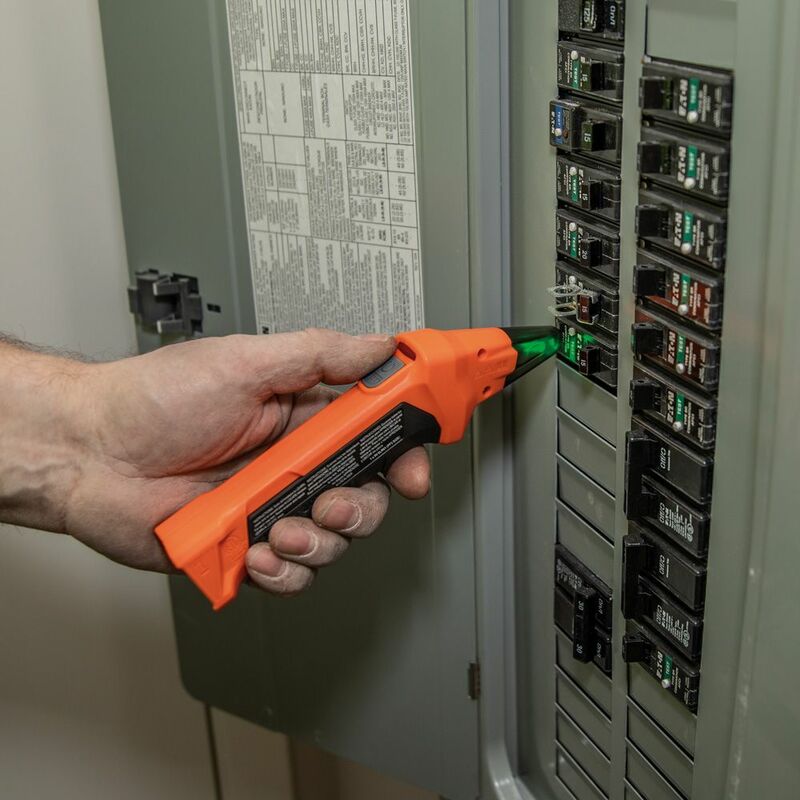 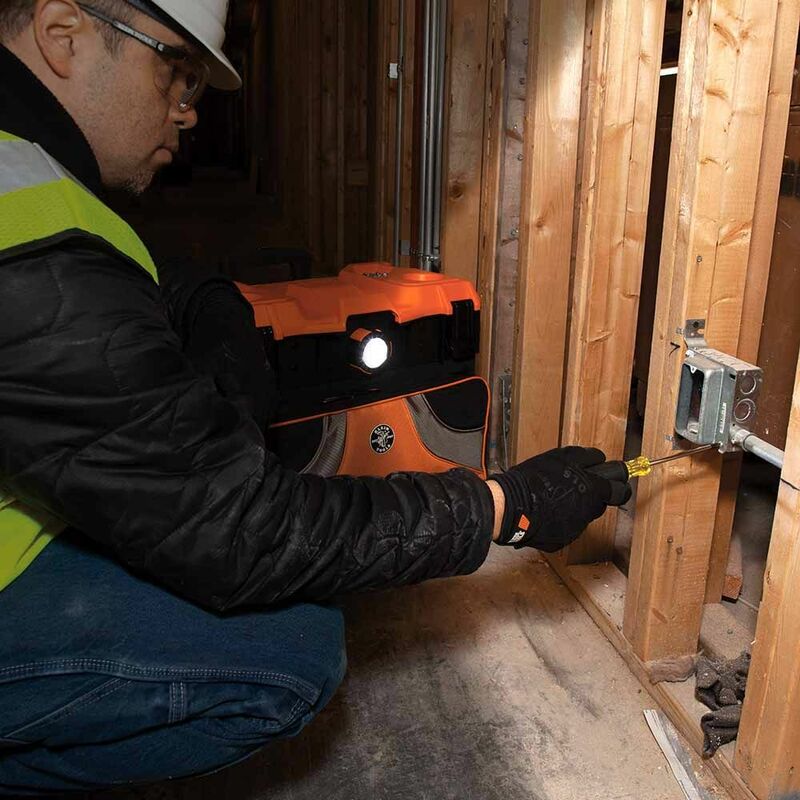 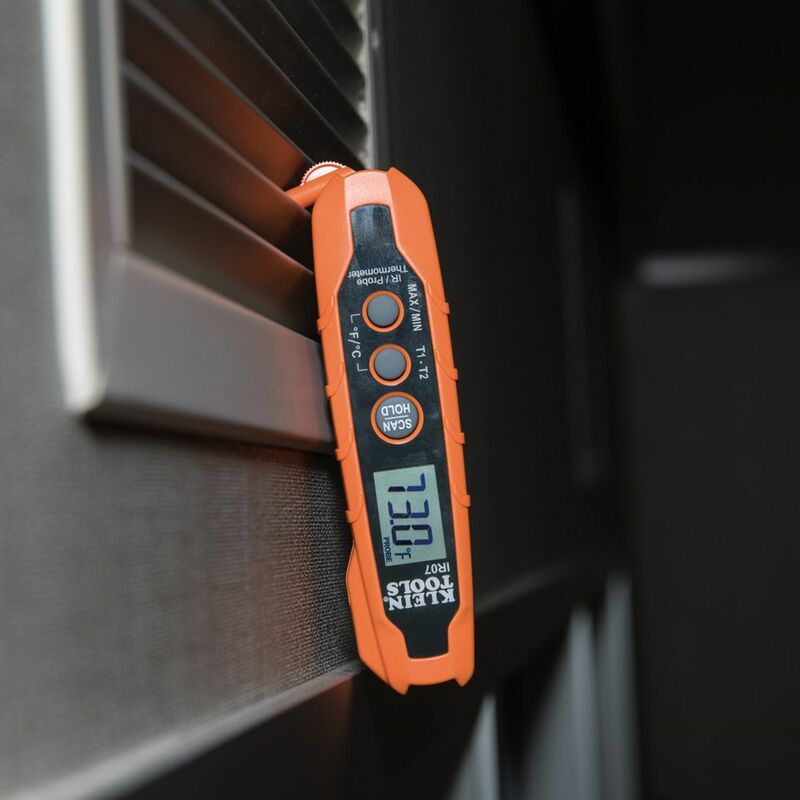 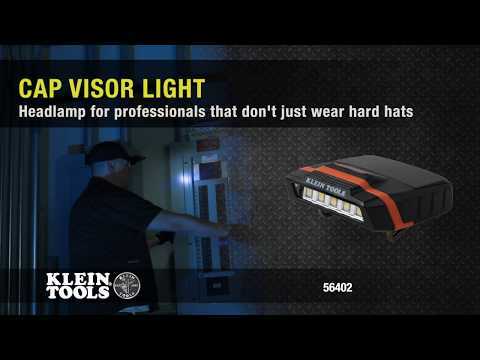 It includes a non-contact voltage tester integrated into the clamp, and features a high visibility, reverse contrast LCD display that optimizes viewability both in dark or bright ambient lighting. 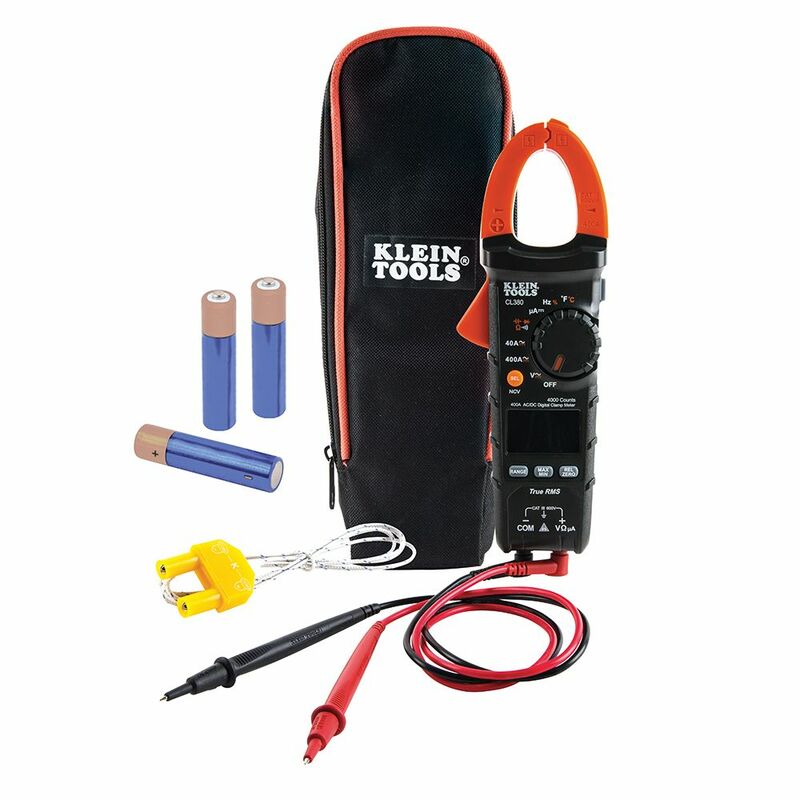 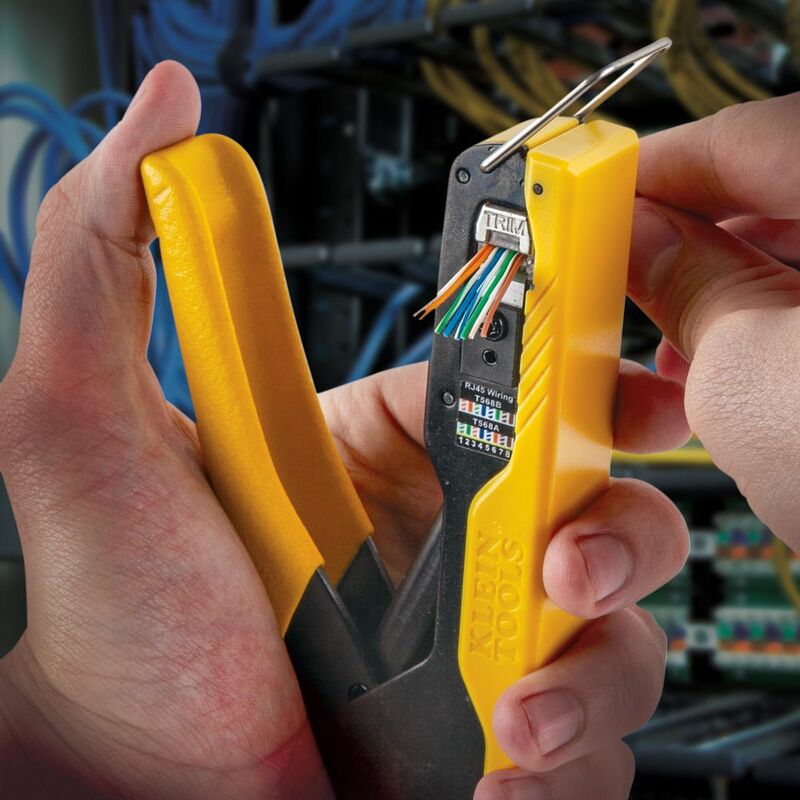 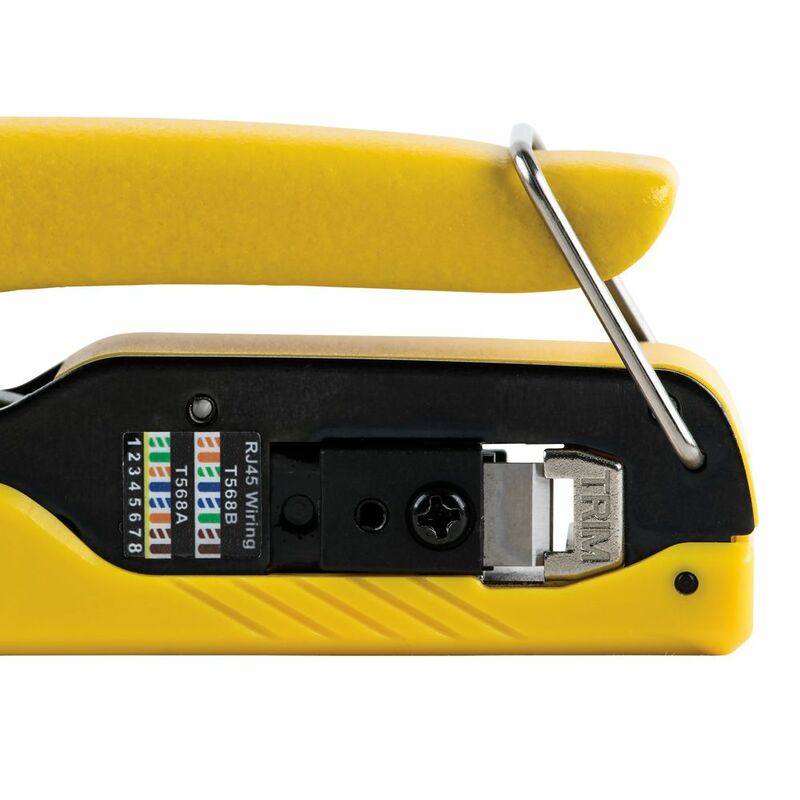 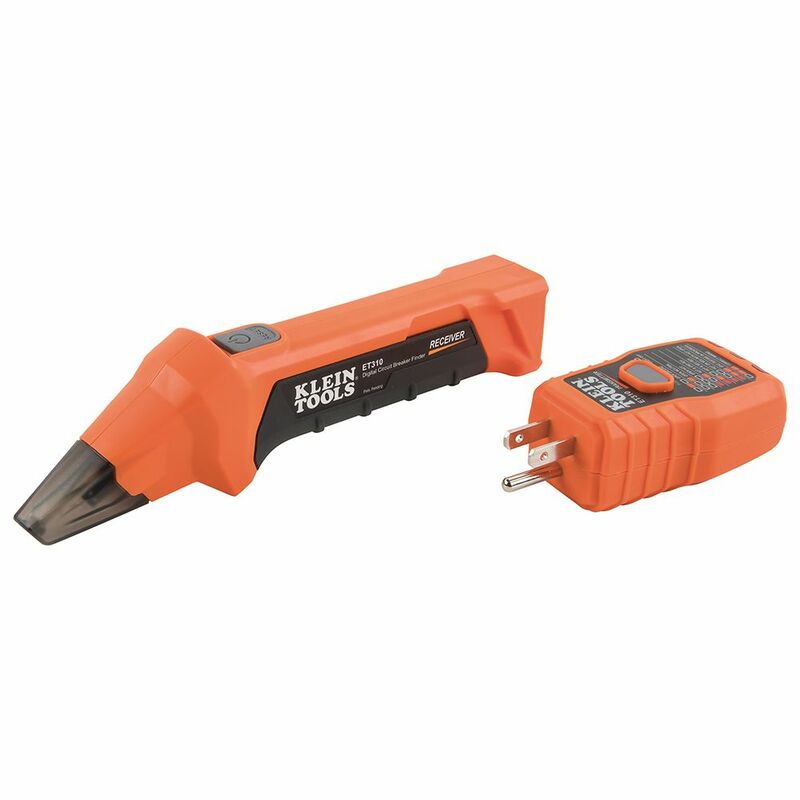 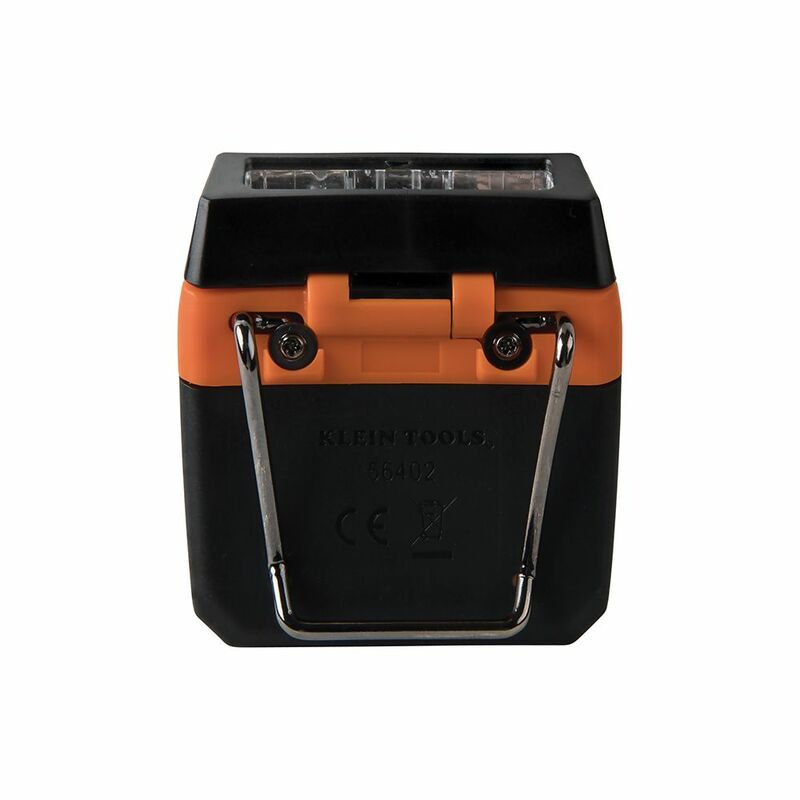 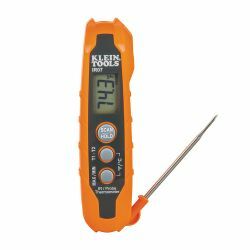 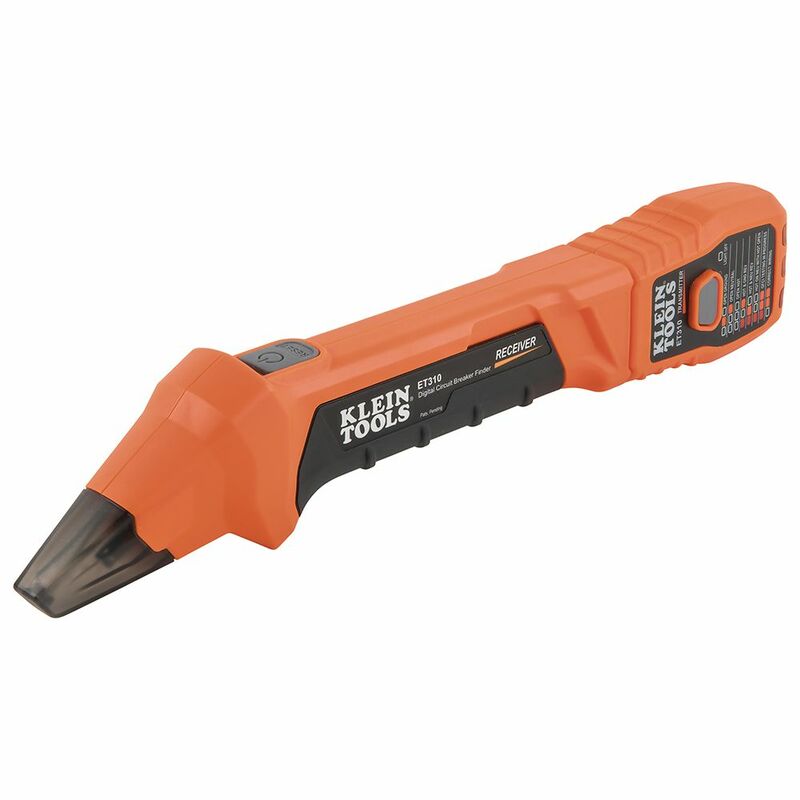 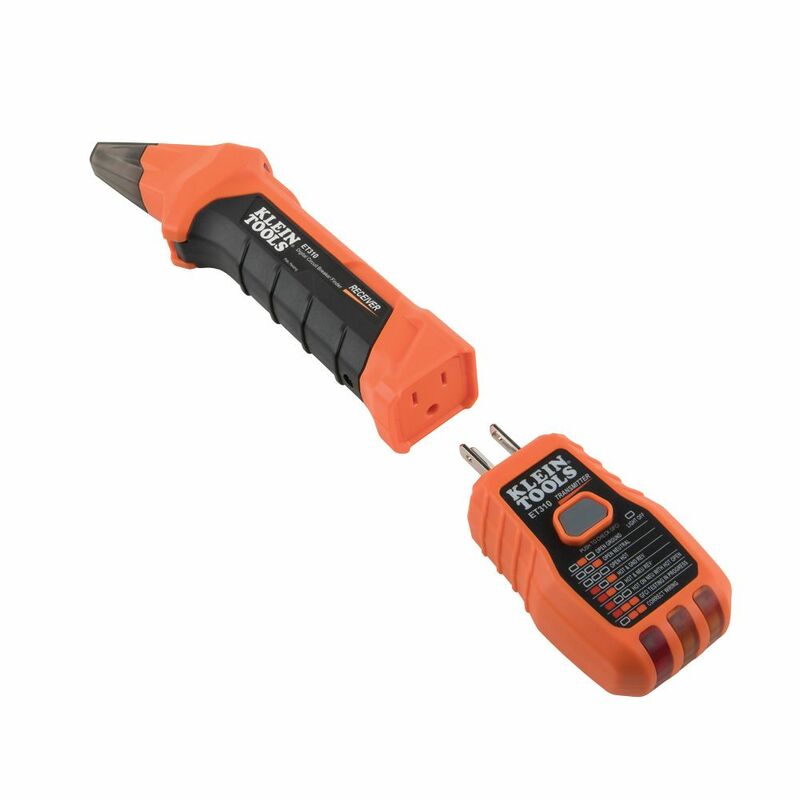 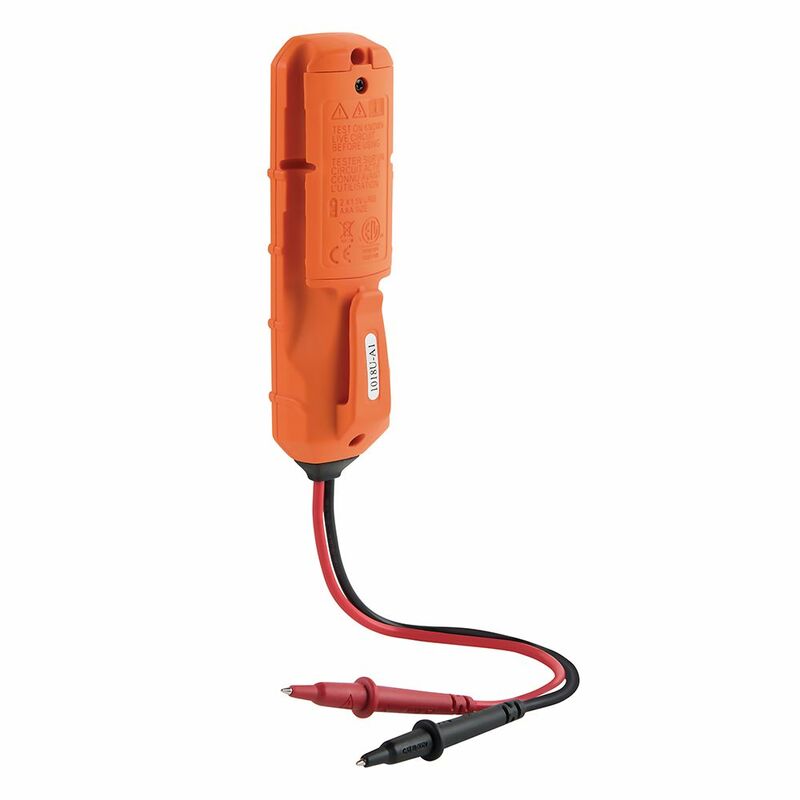 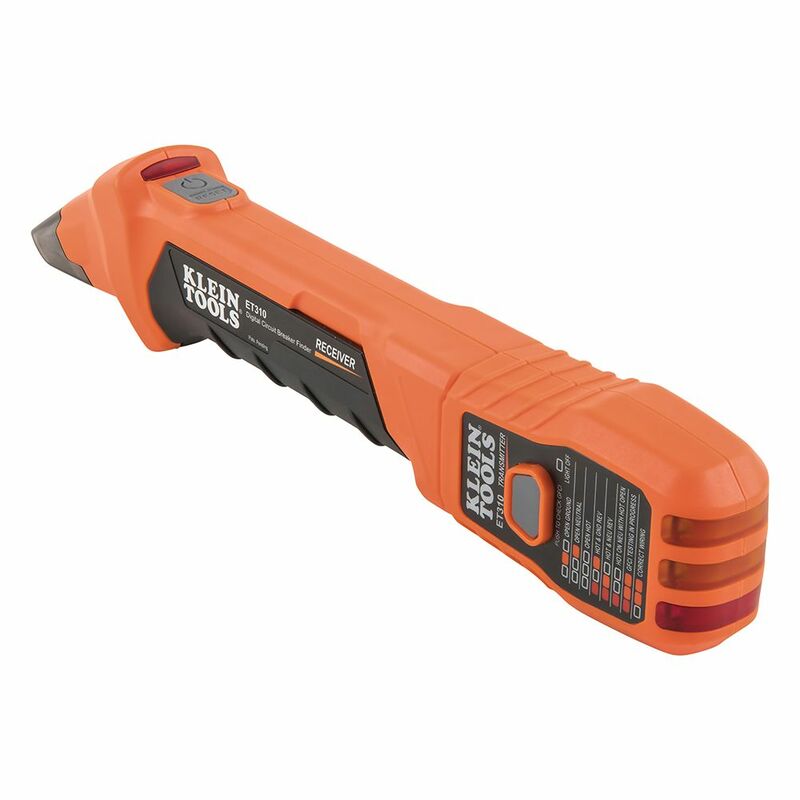 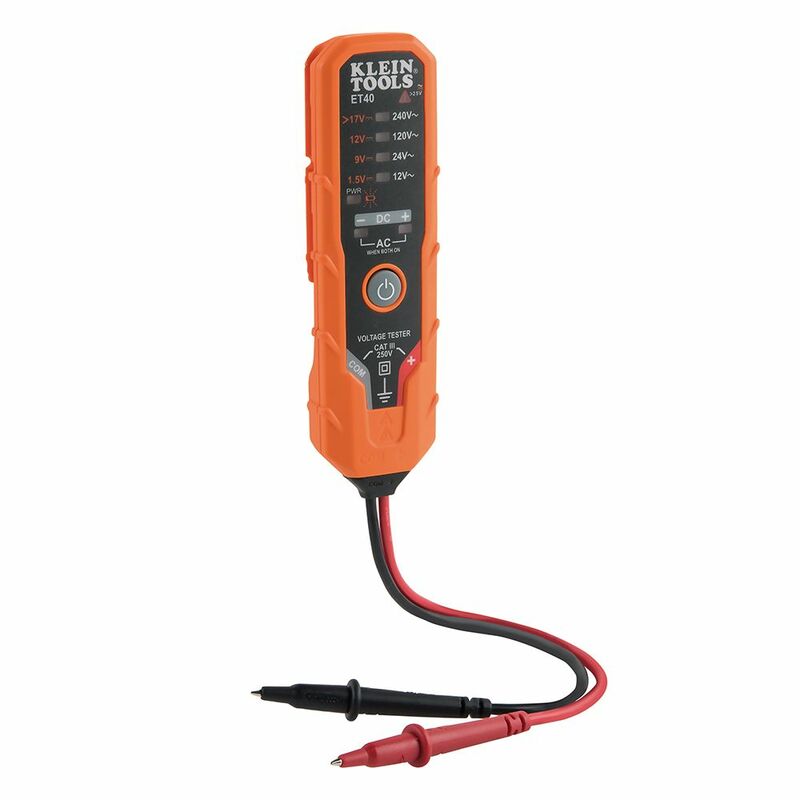 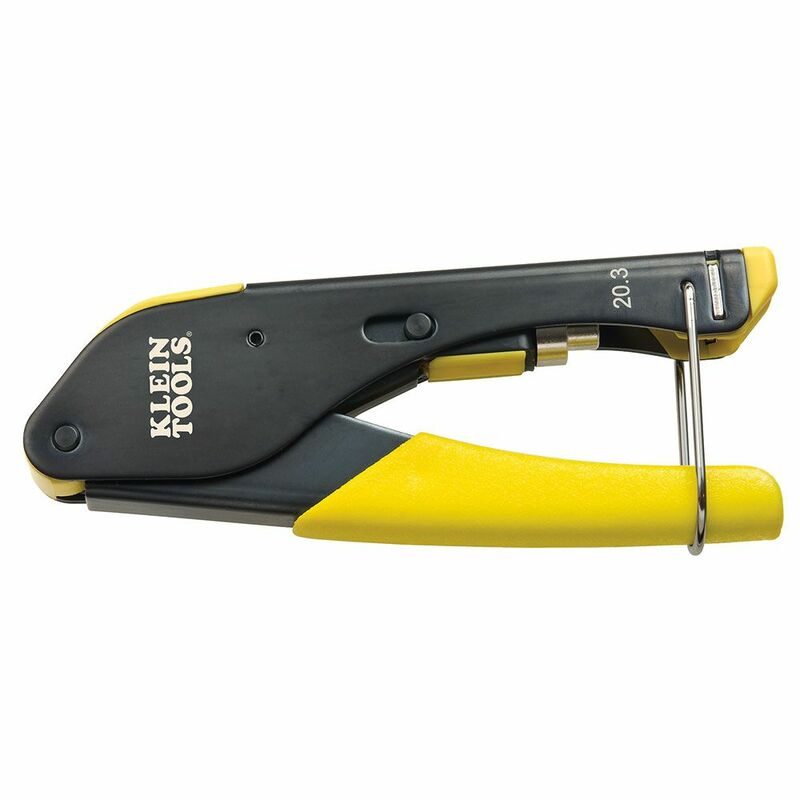 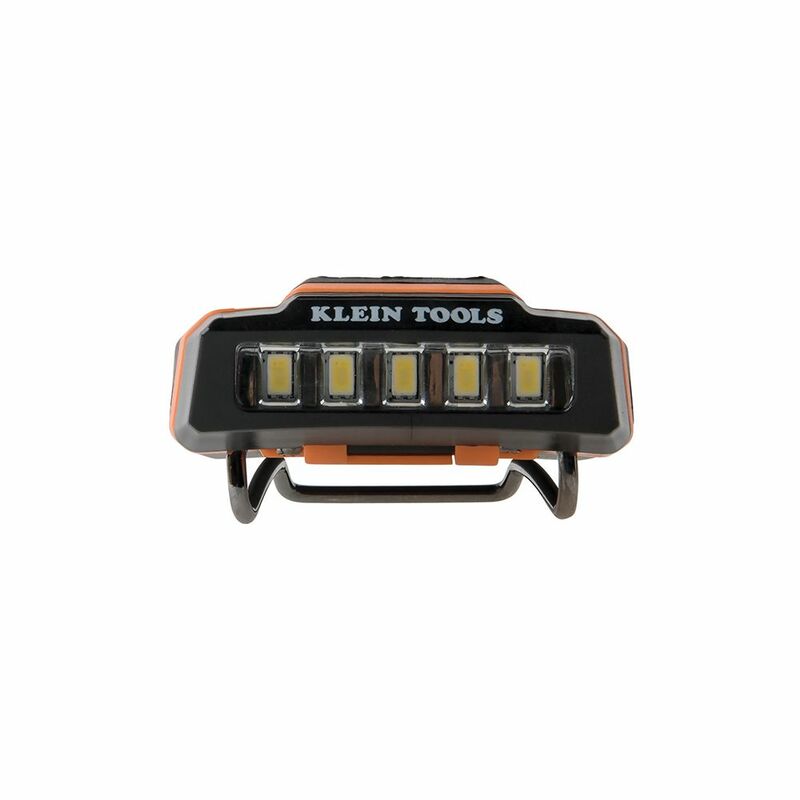 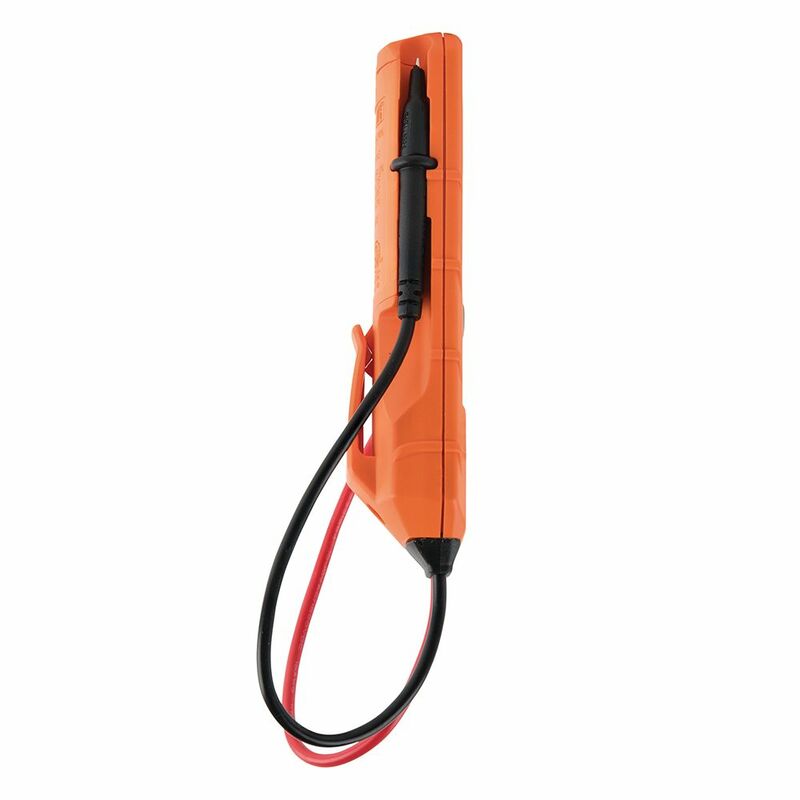 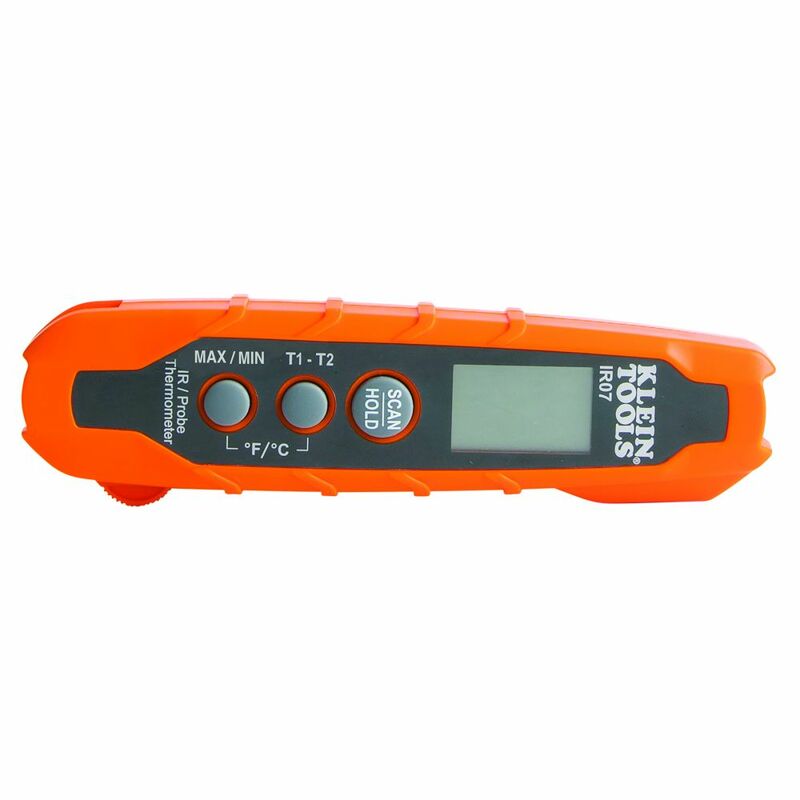 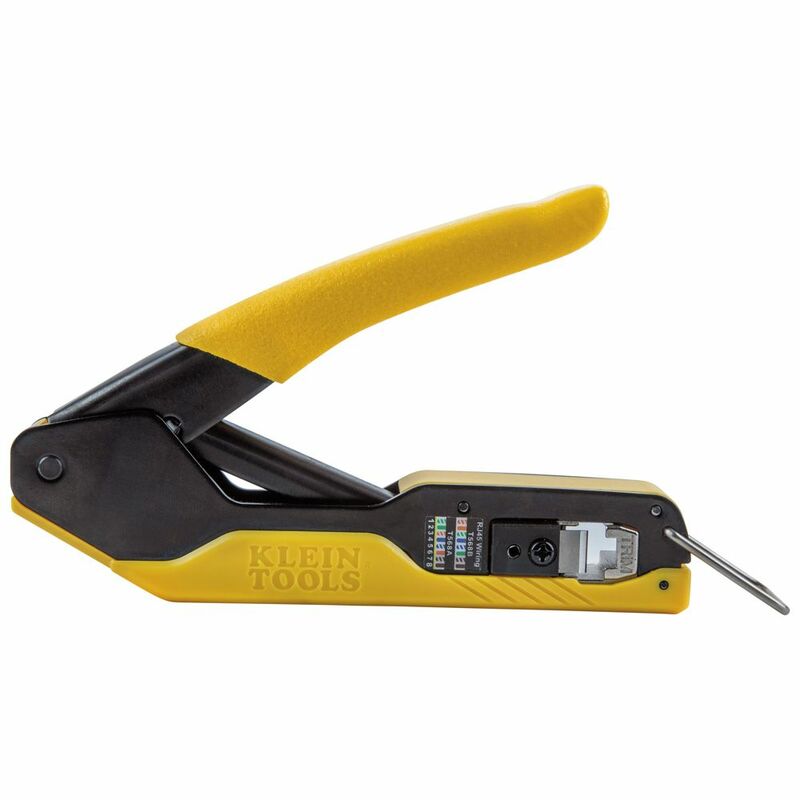 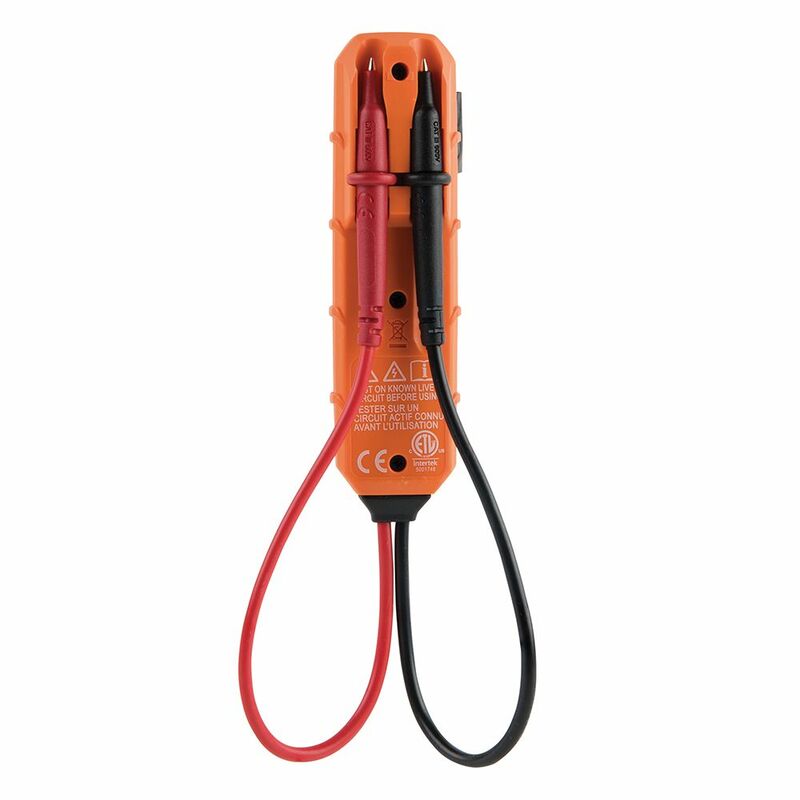 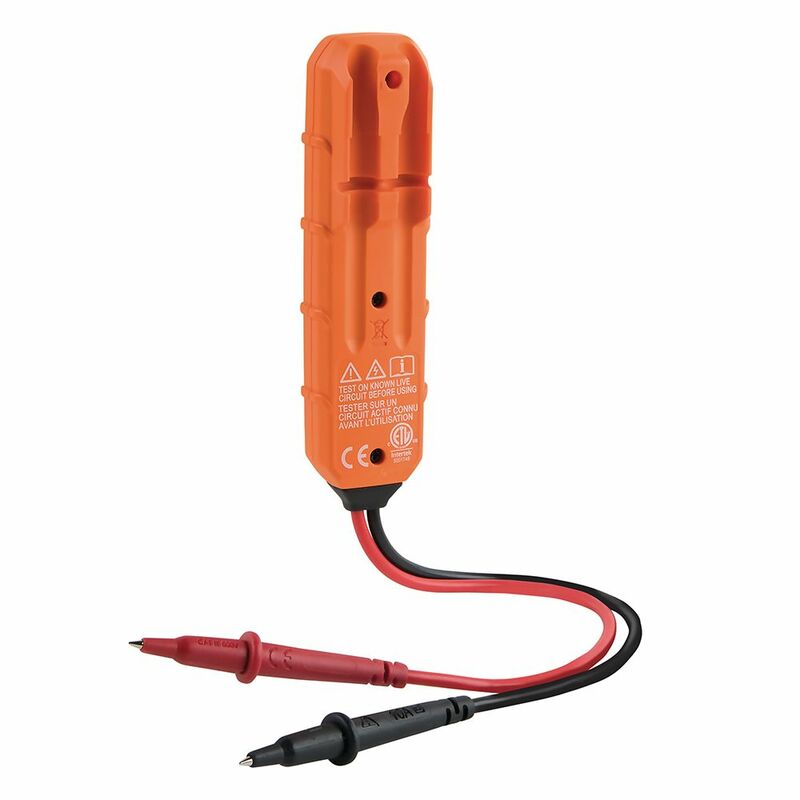 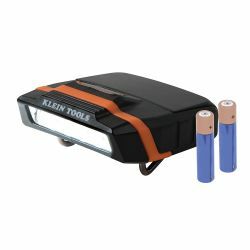 Klein Tools ET45 is an Electronic Voltage Tester. 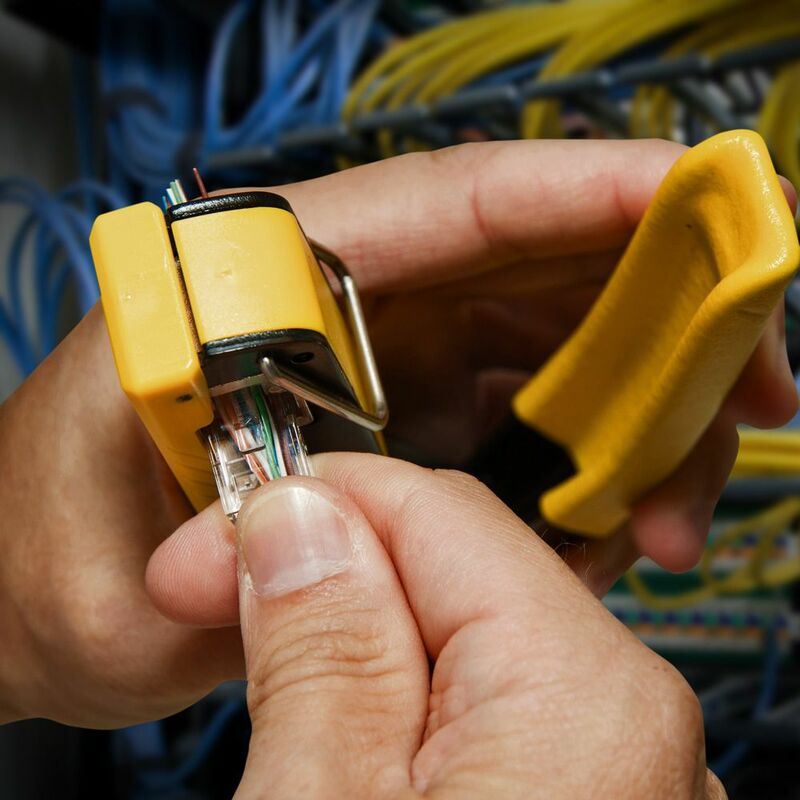 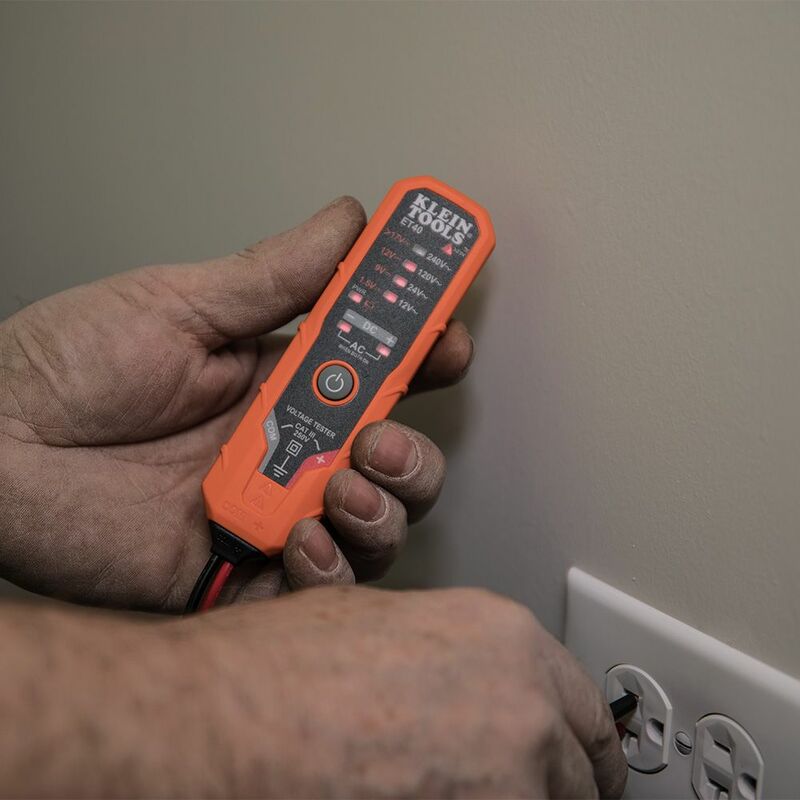 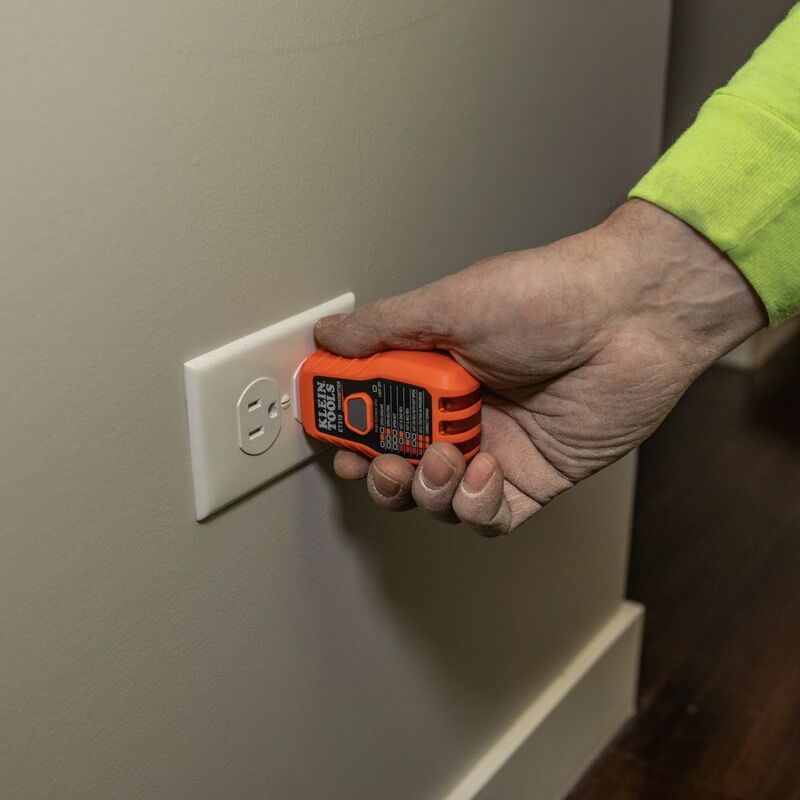 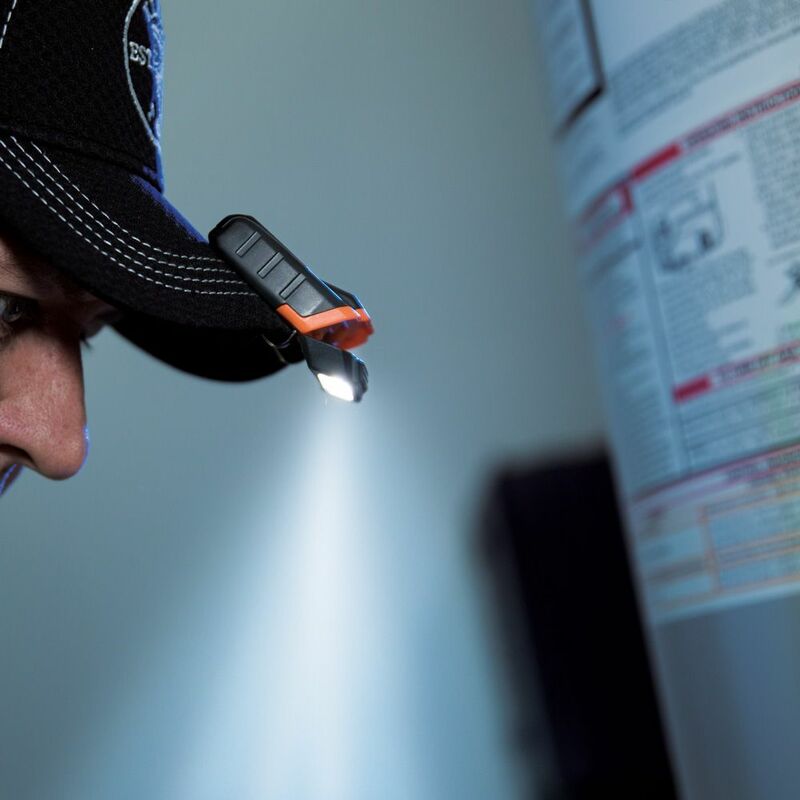 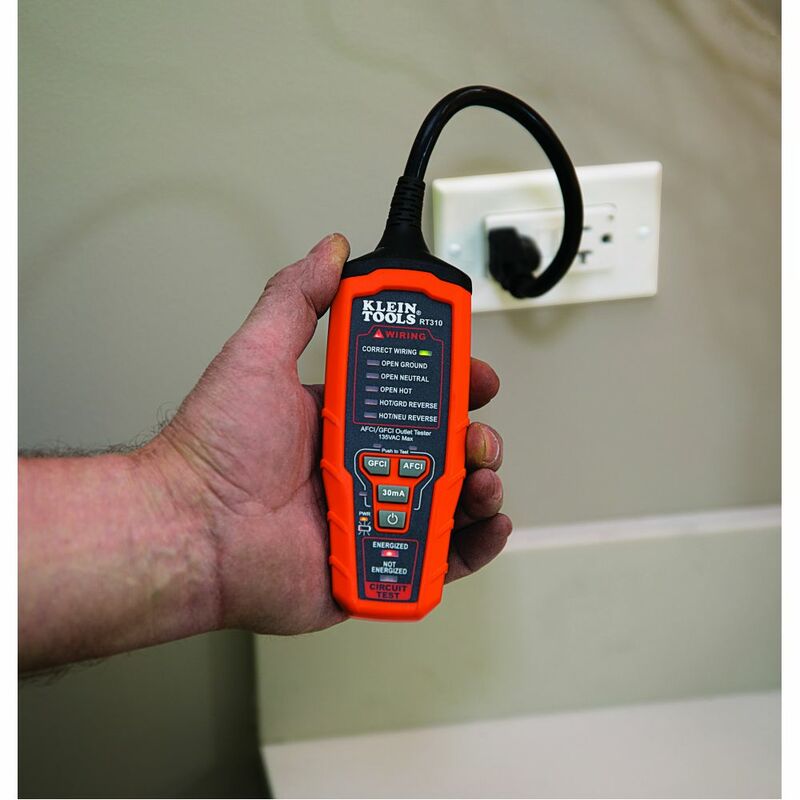 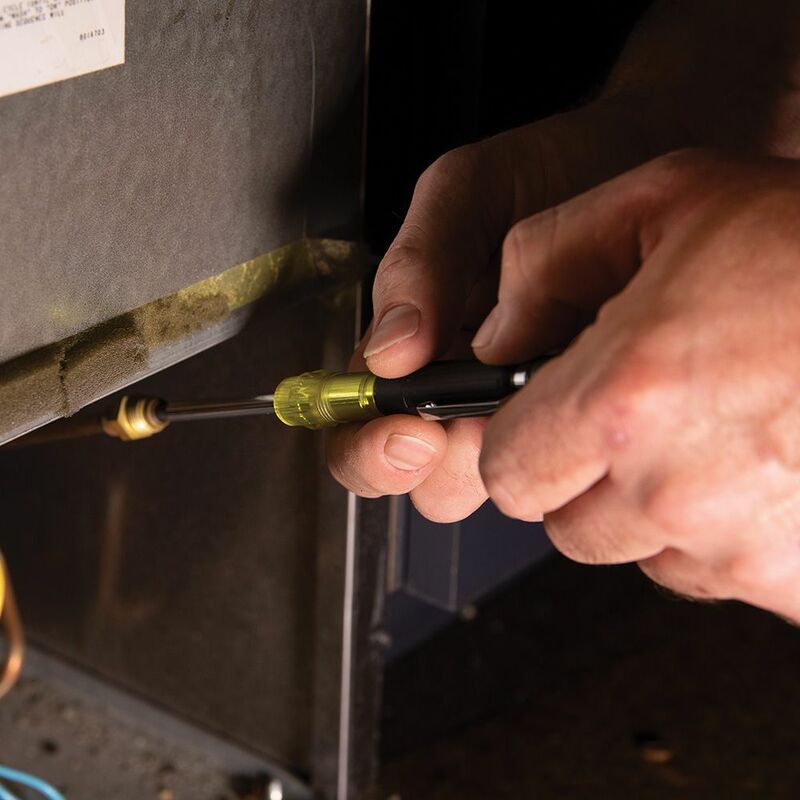 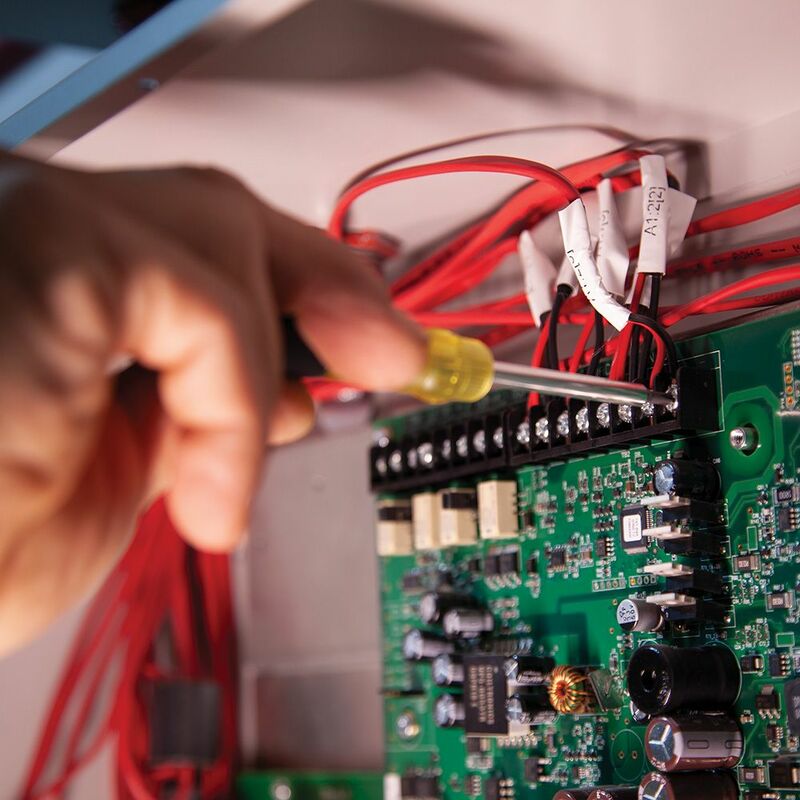 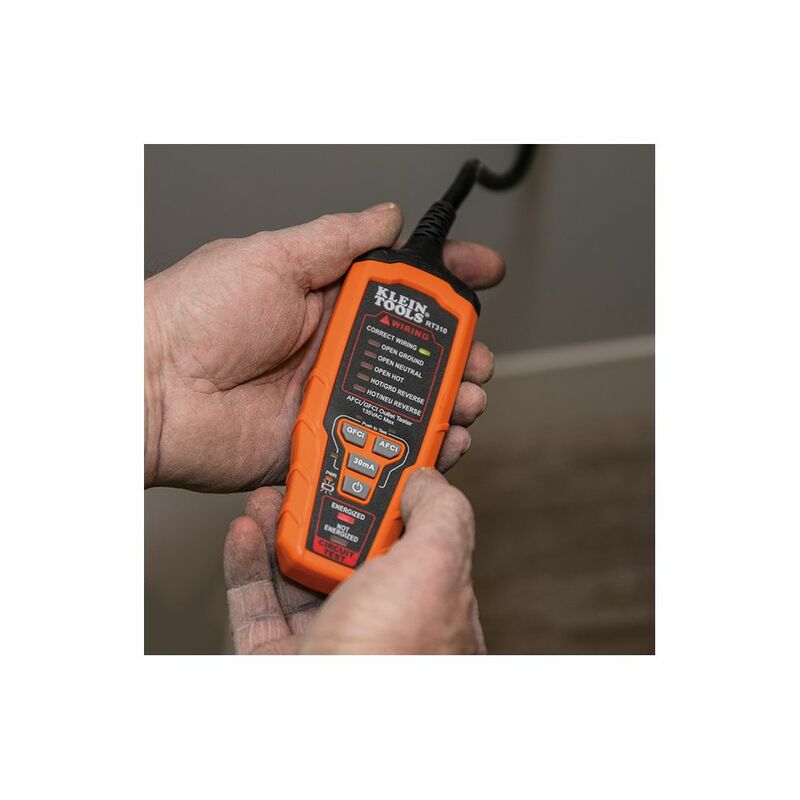 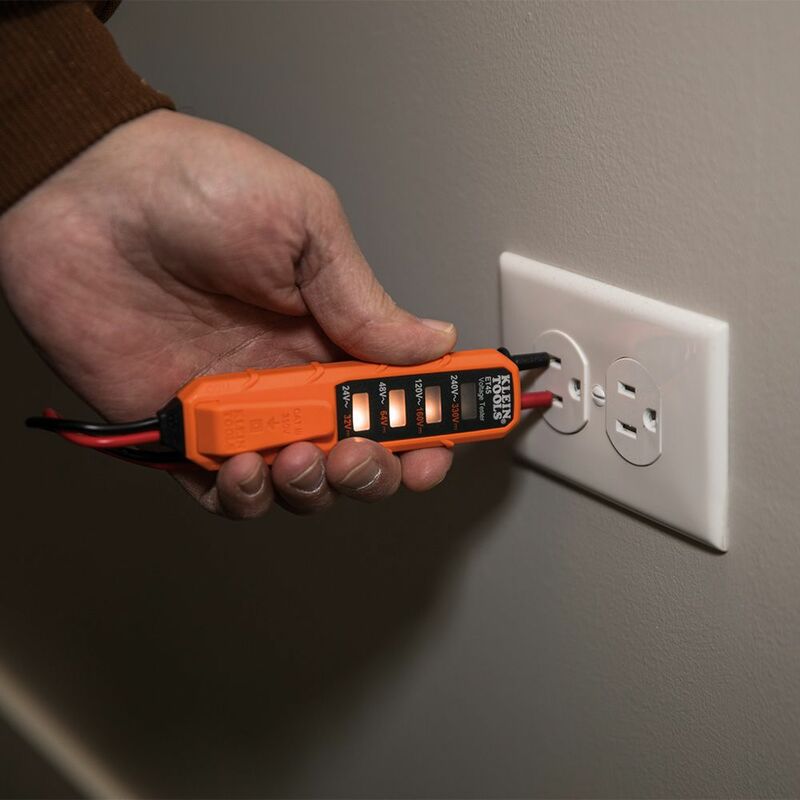 Designed as a simple, easy to use tester to check, verify or troubleshoot common residential electrical wiring in electrical outlets, light fixtures, doorbells and more. 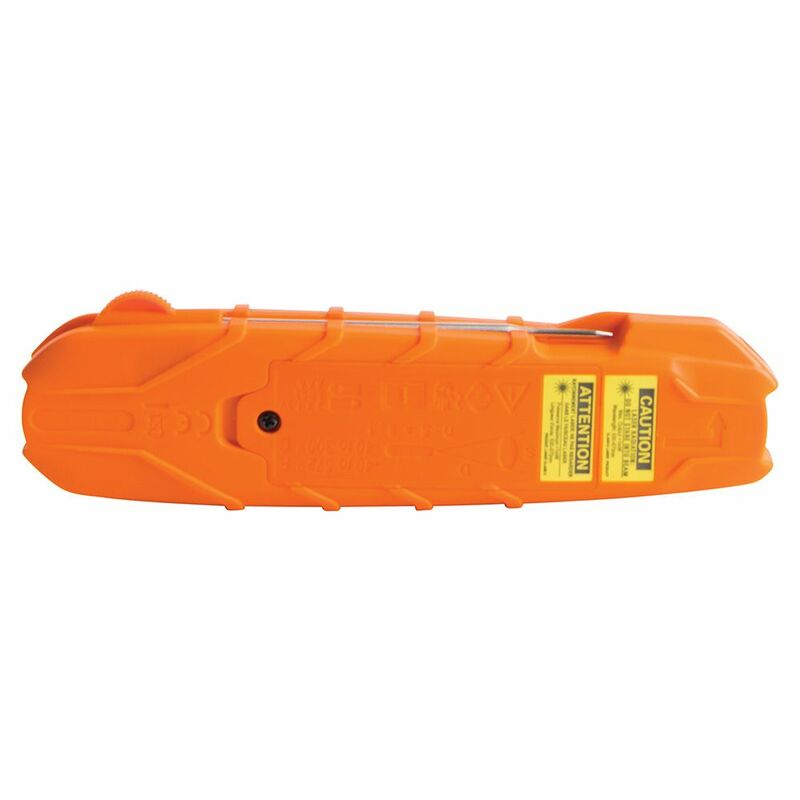 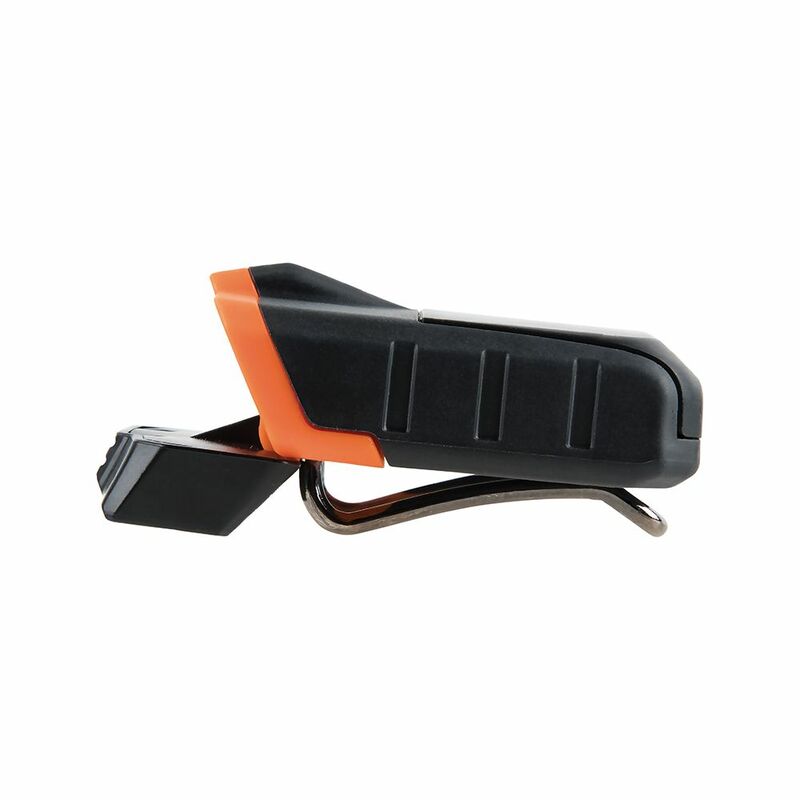 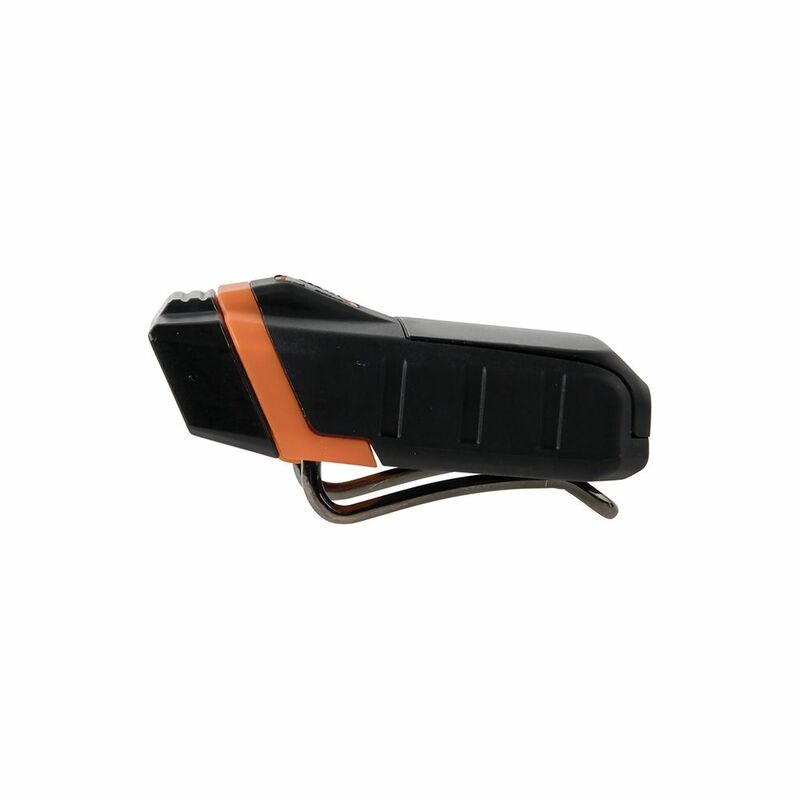 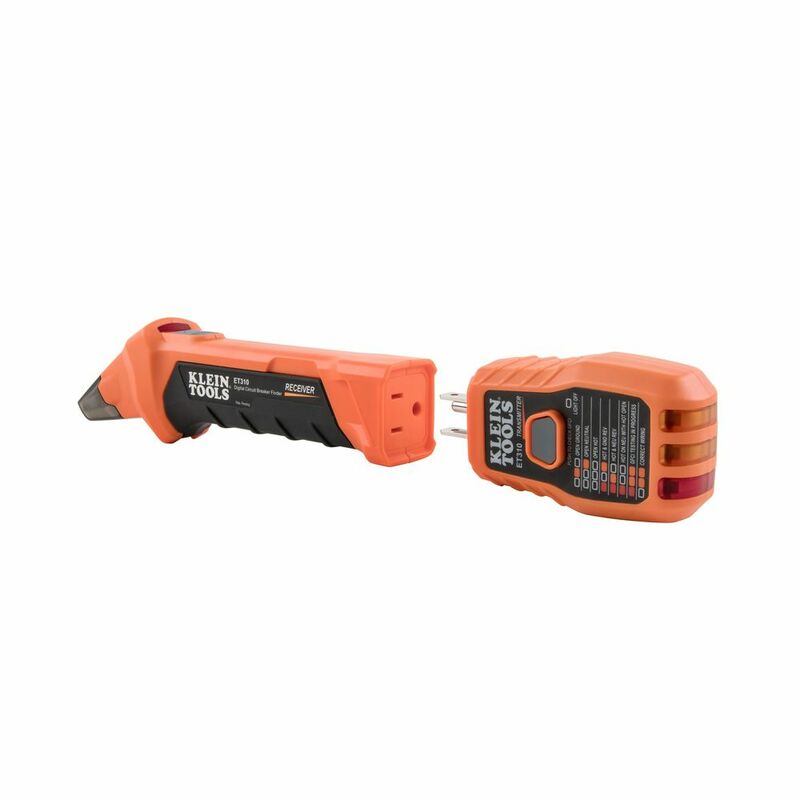 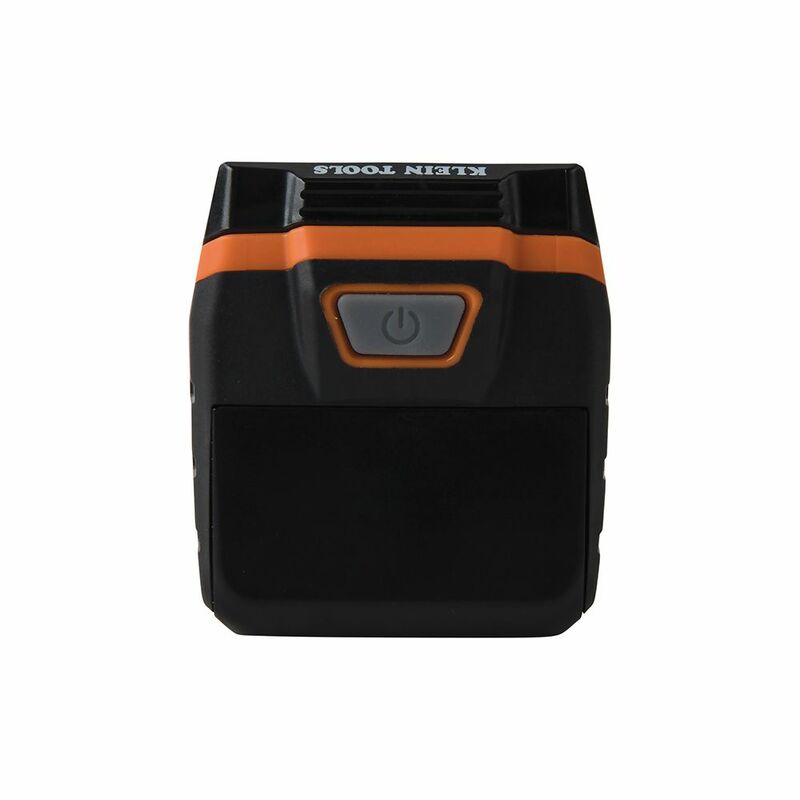 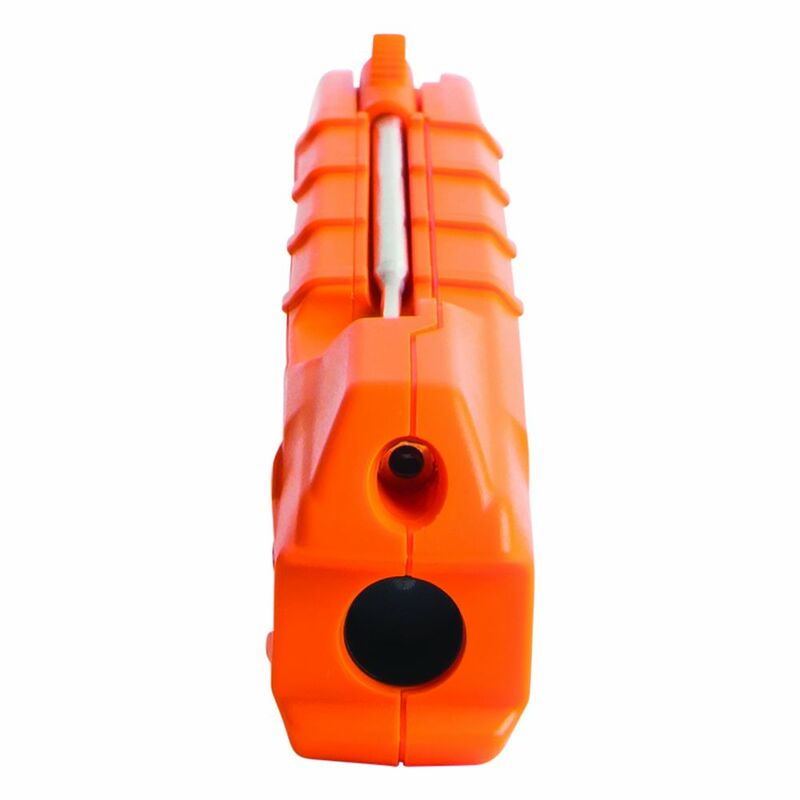 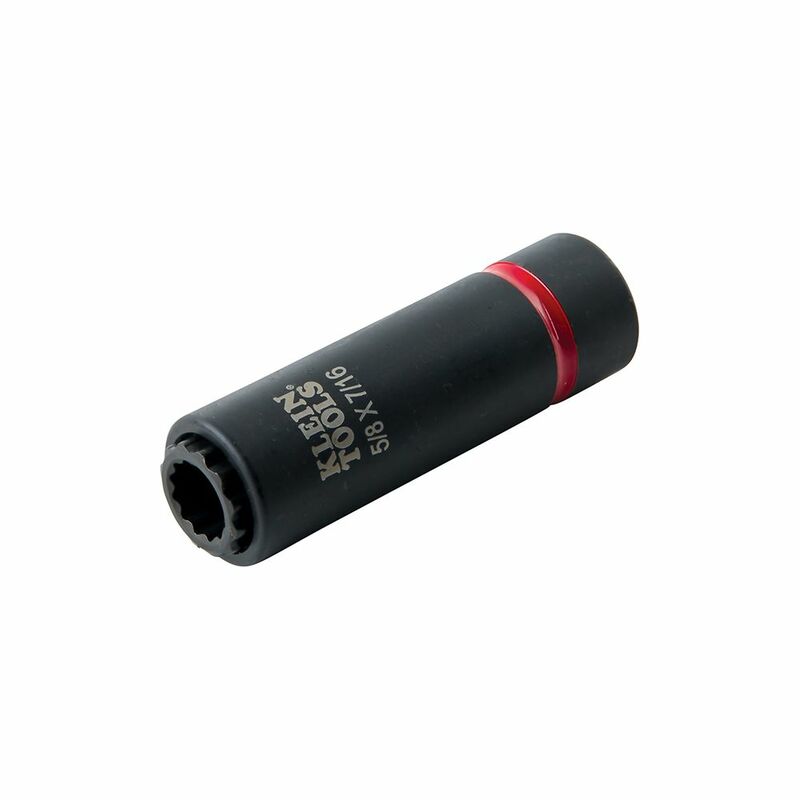 This tester does not require batteries, and features a pocket clip for convenient carrying. 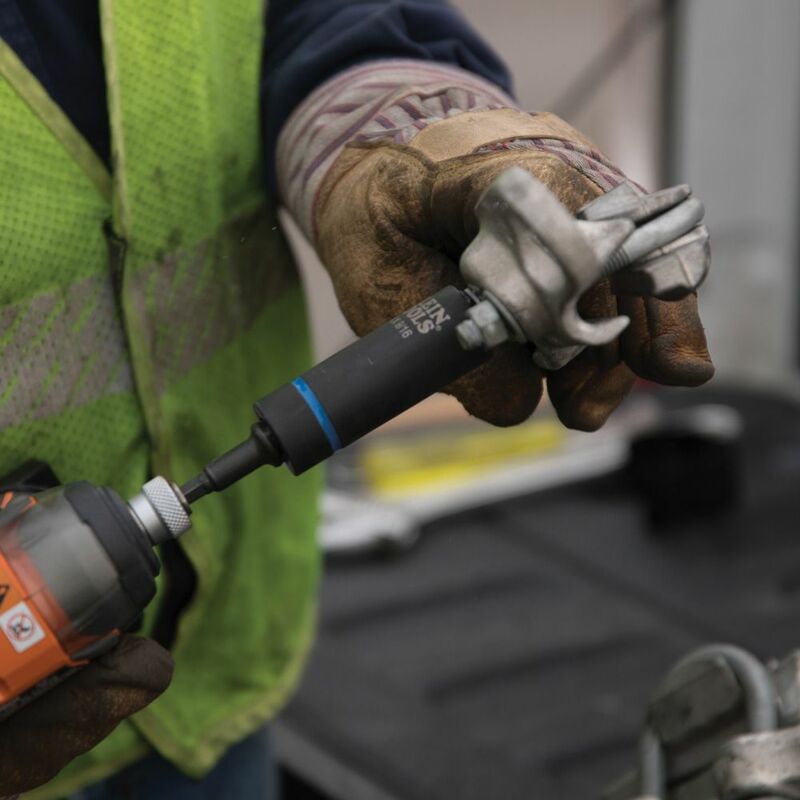 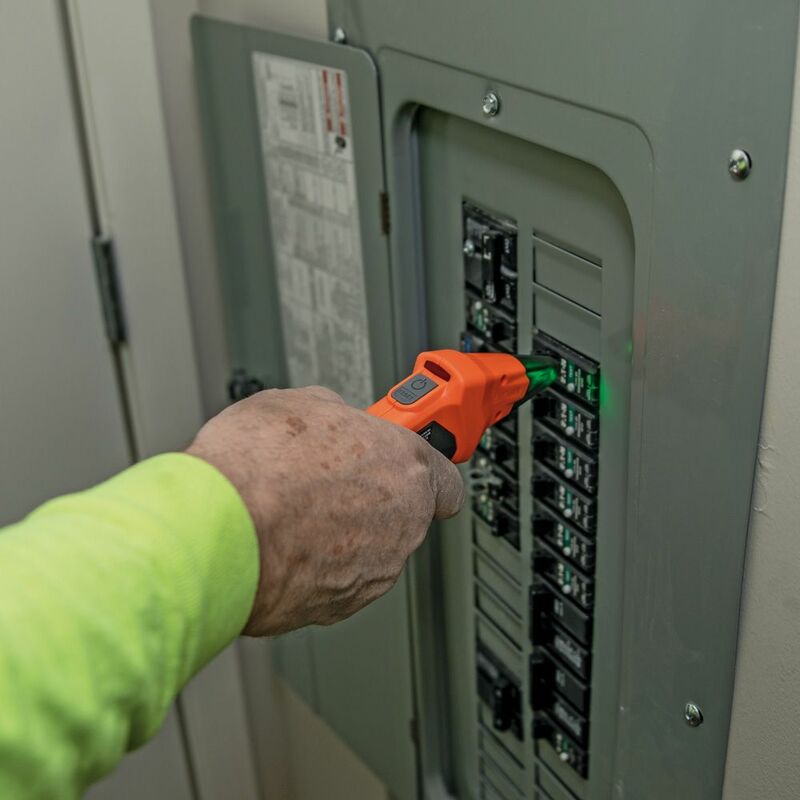 This Chicago Grip is designed specifically to work with coated guy strand and EHS cable. 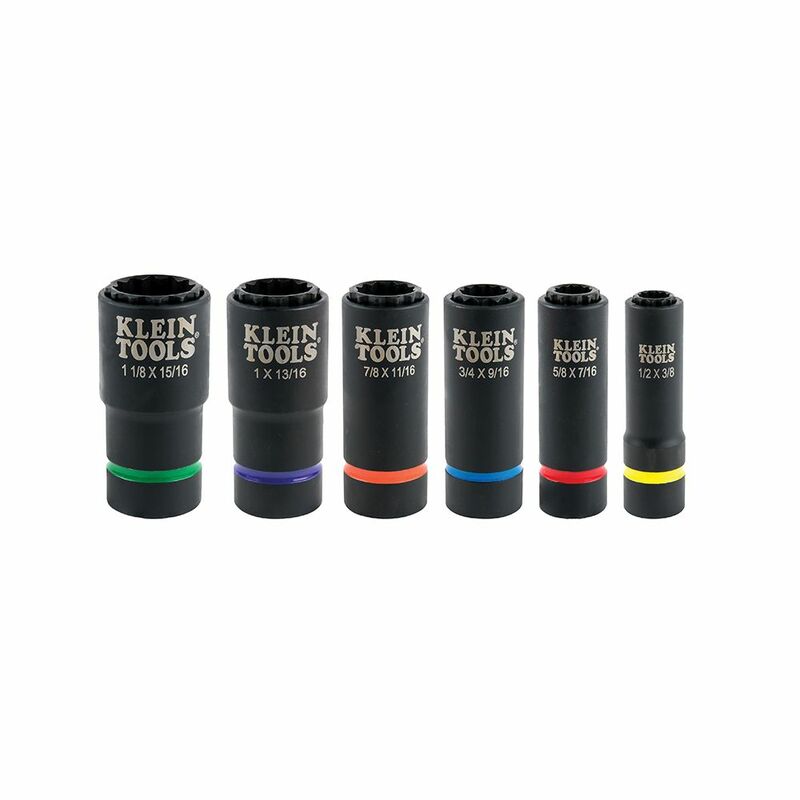 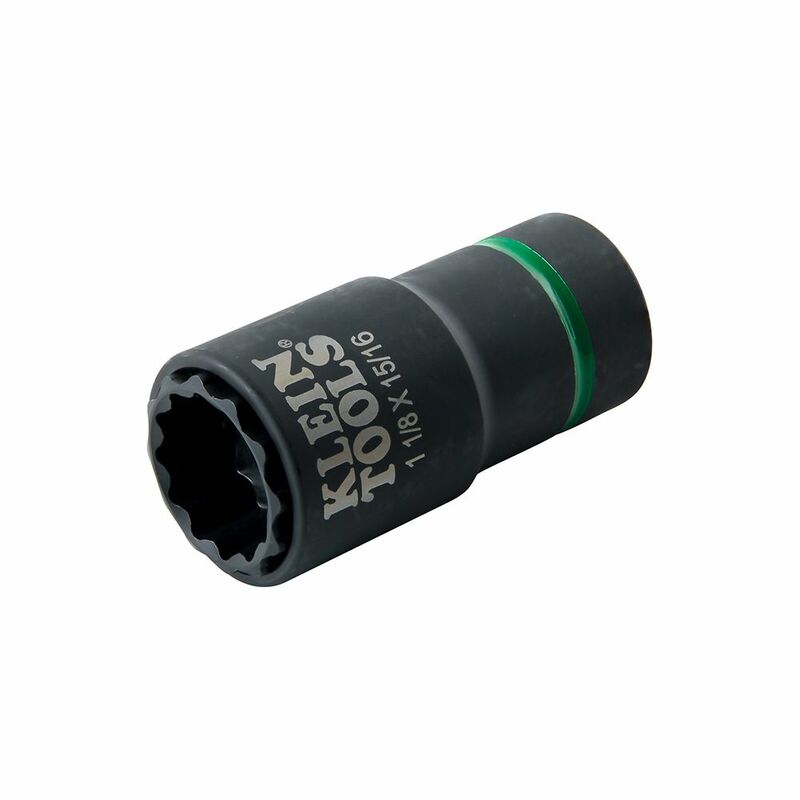 Klein grips are made of drop-forged, quality US steel and heat treated for strength and durability. 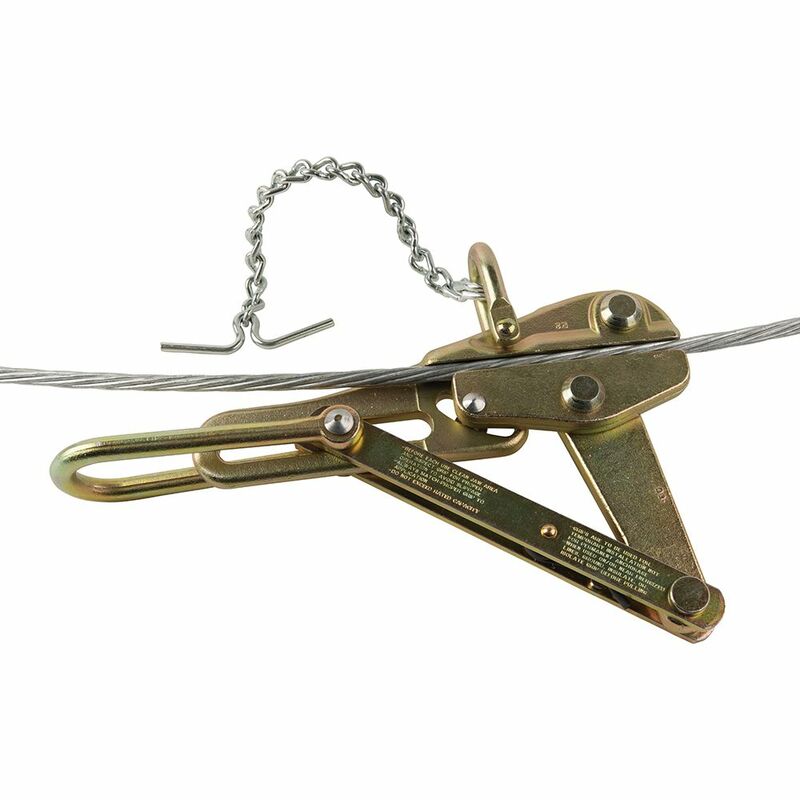 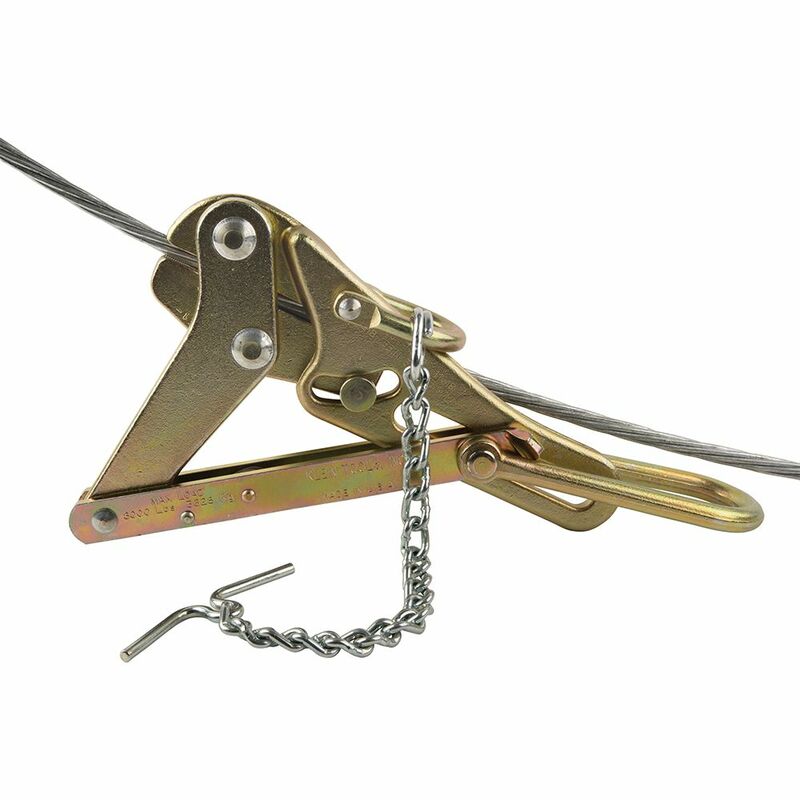 The chain, toggle and shackle keep the grip from falling off the cable. 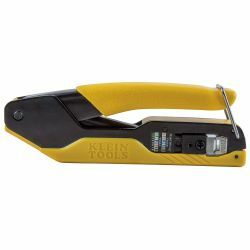 The 5-Inch jaw length increases the surface area contact with the cable minimizing cable damage. 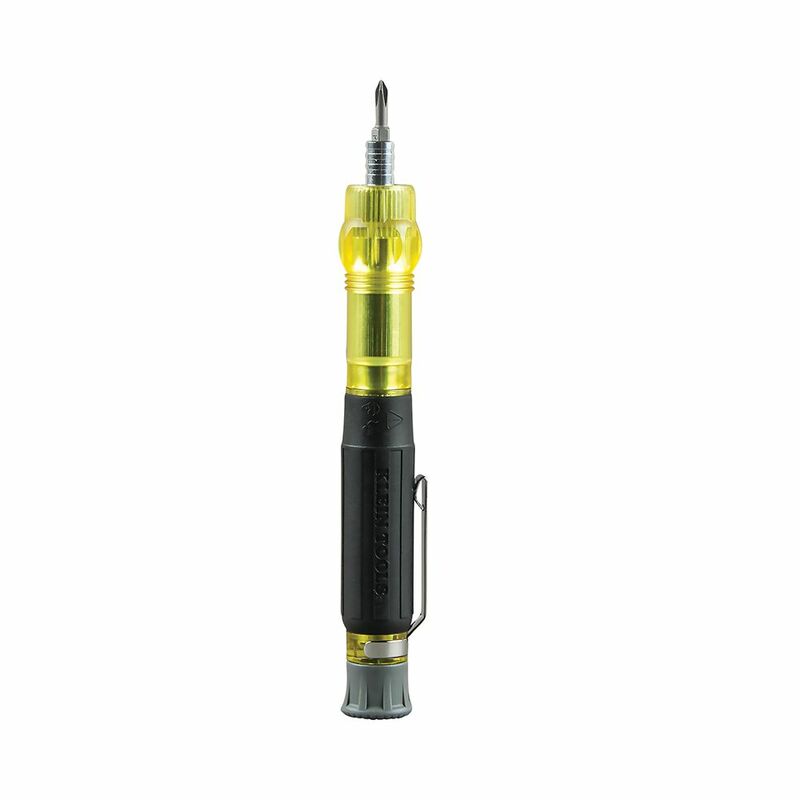 The sawtooth jaw profile resists galvanization build-up. 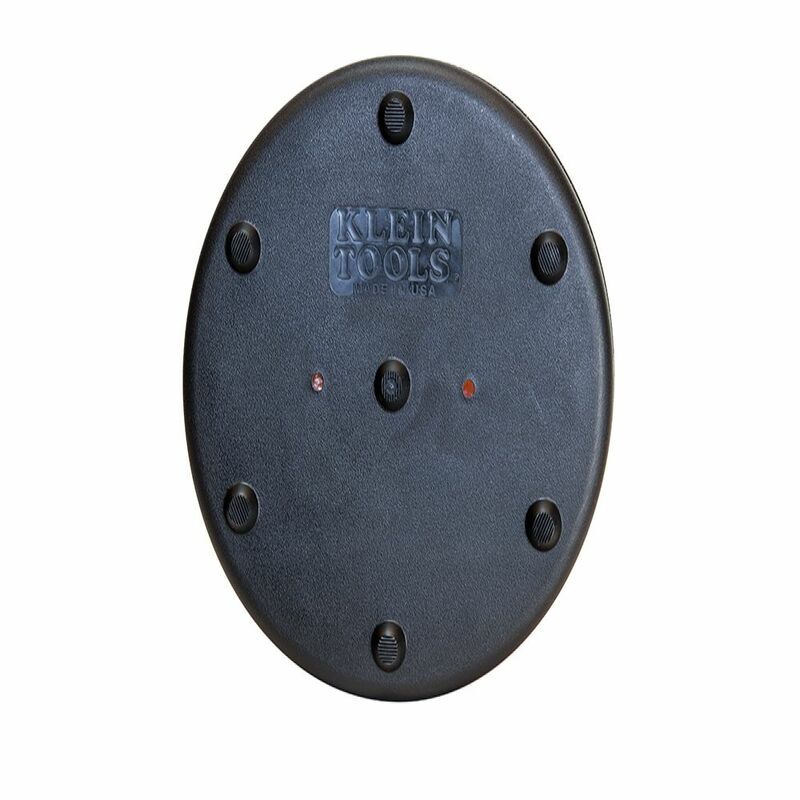 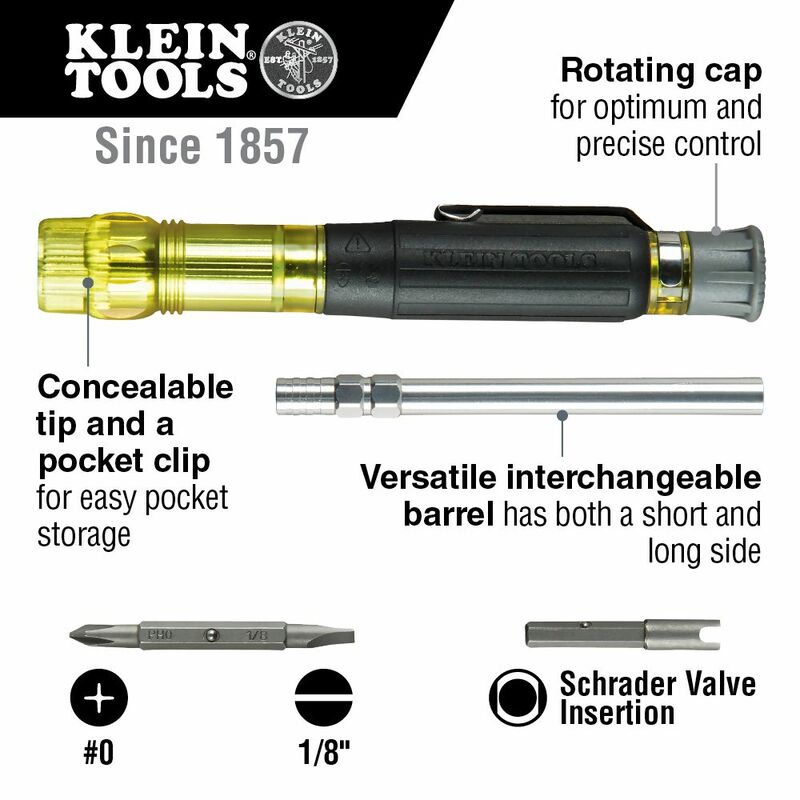 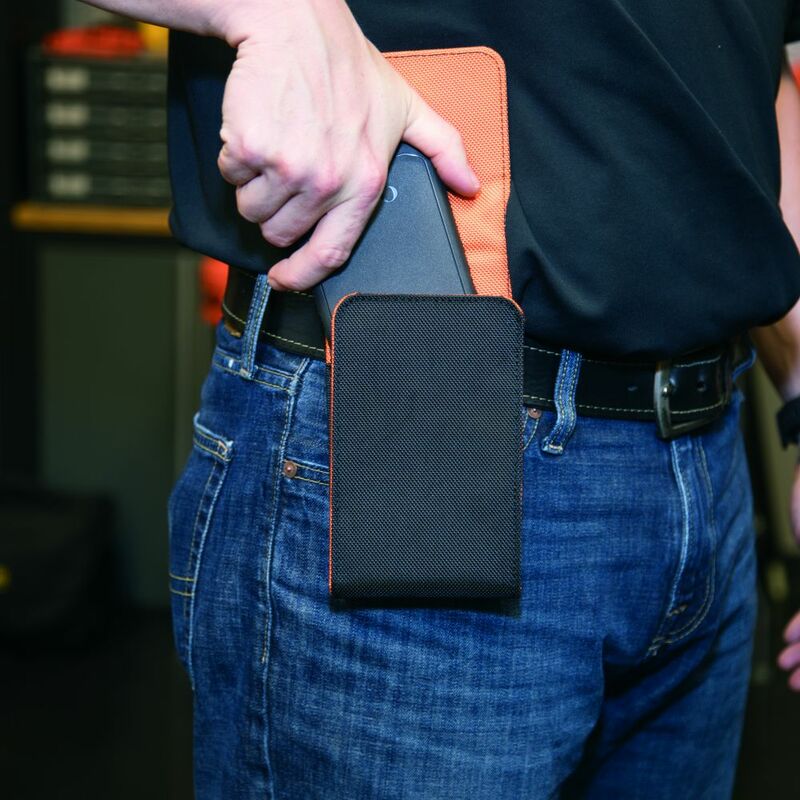 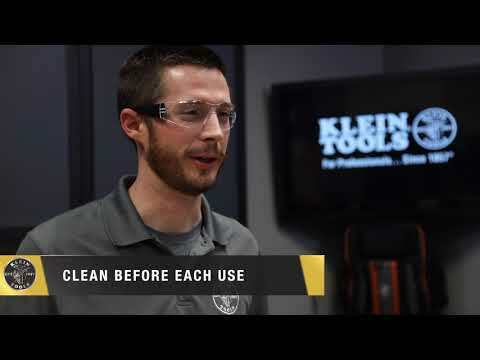 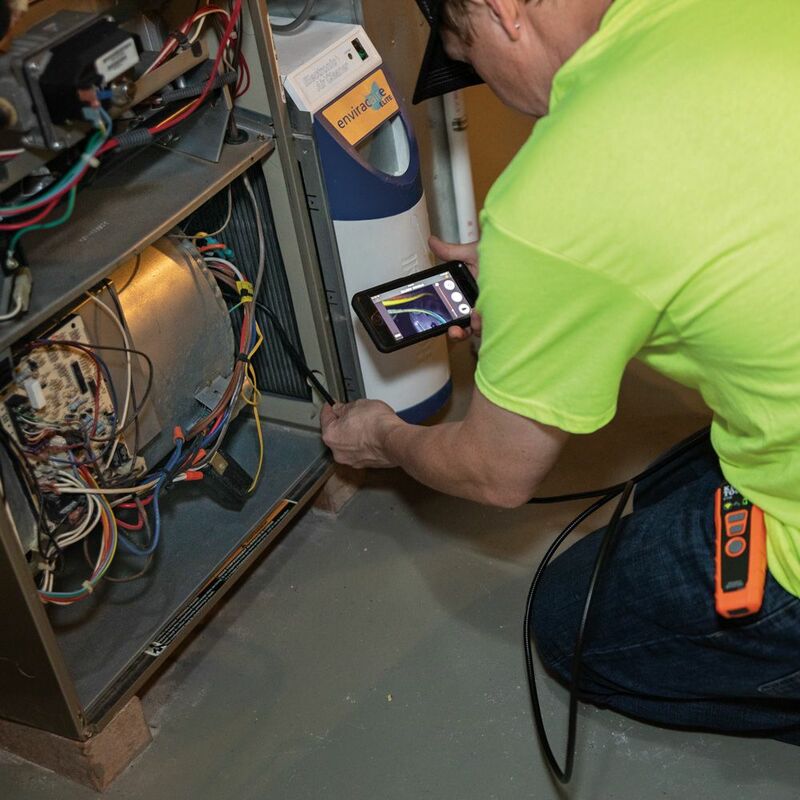 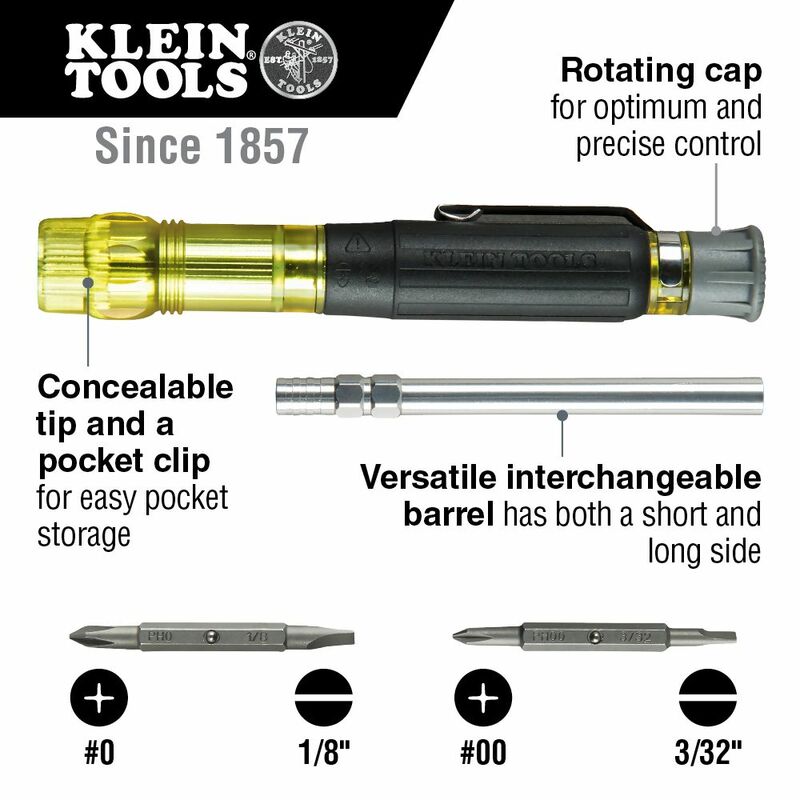 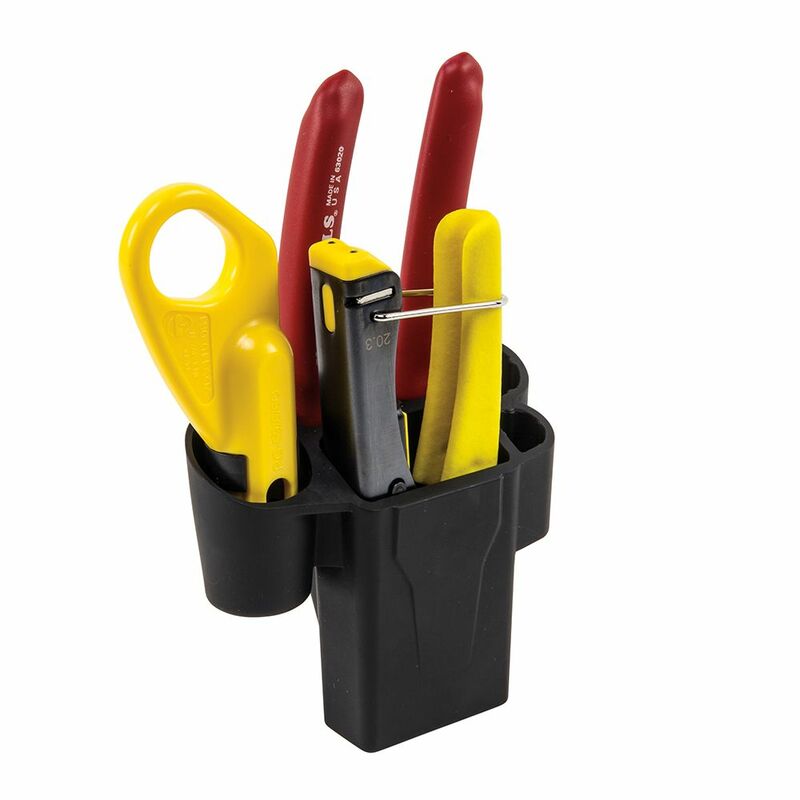 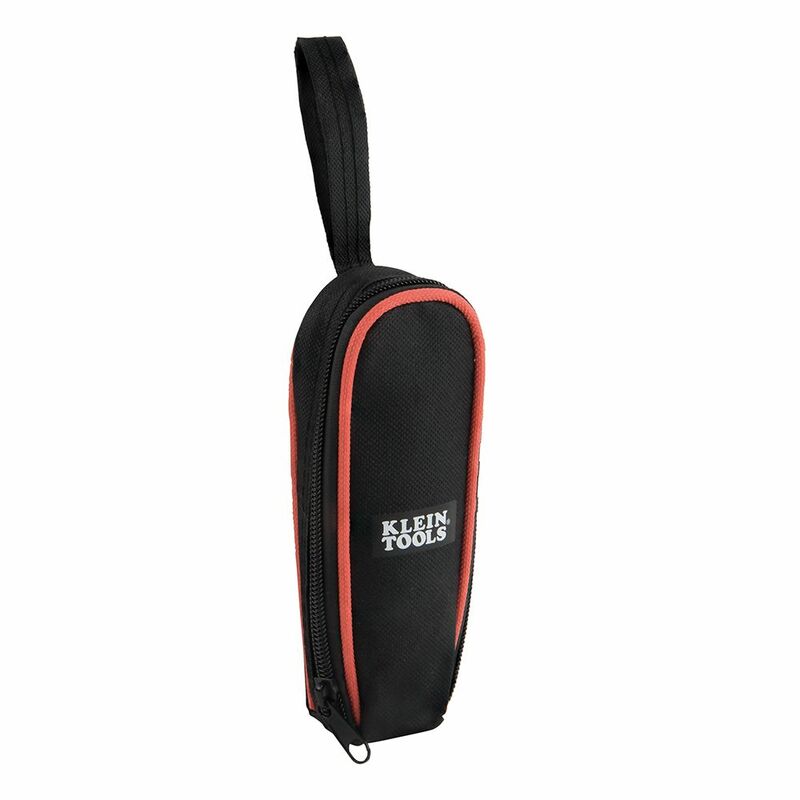 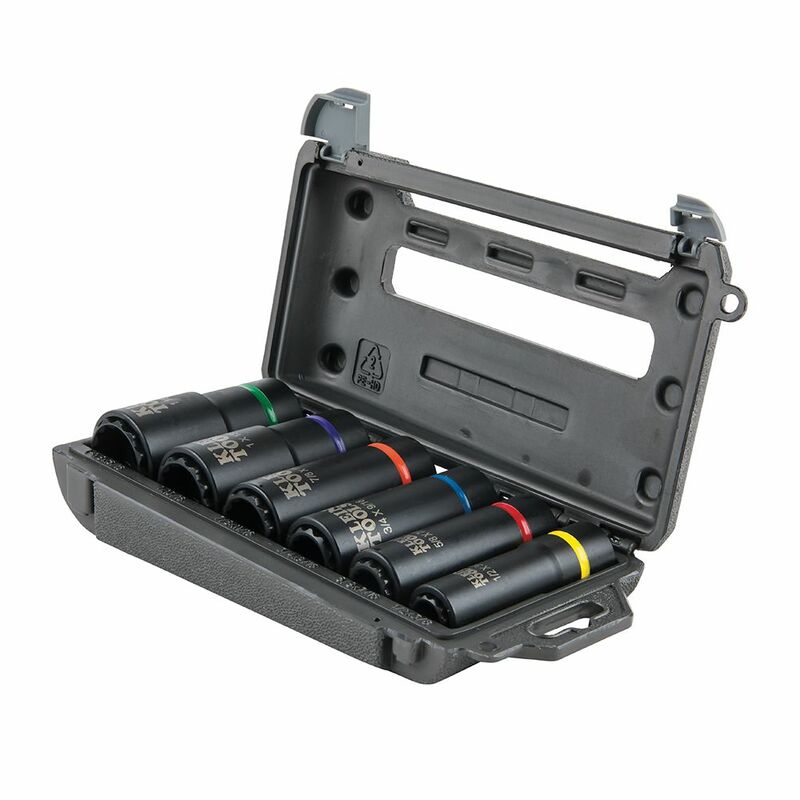 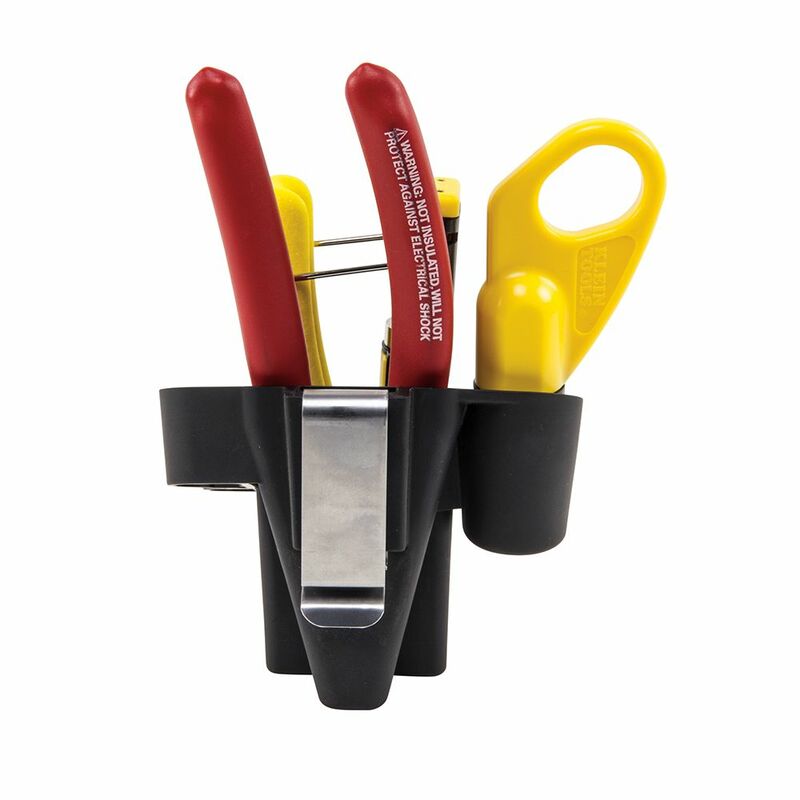 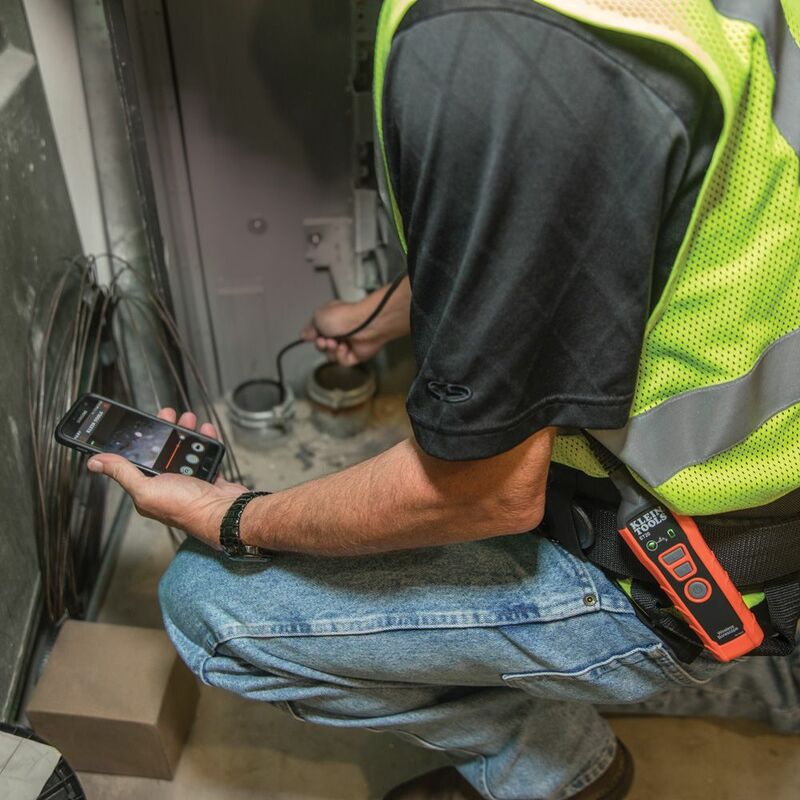 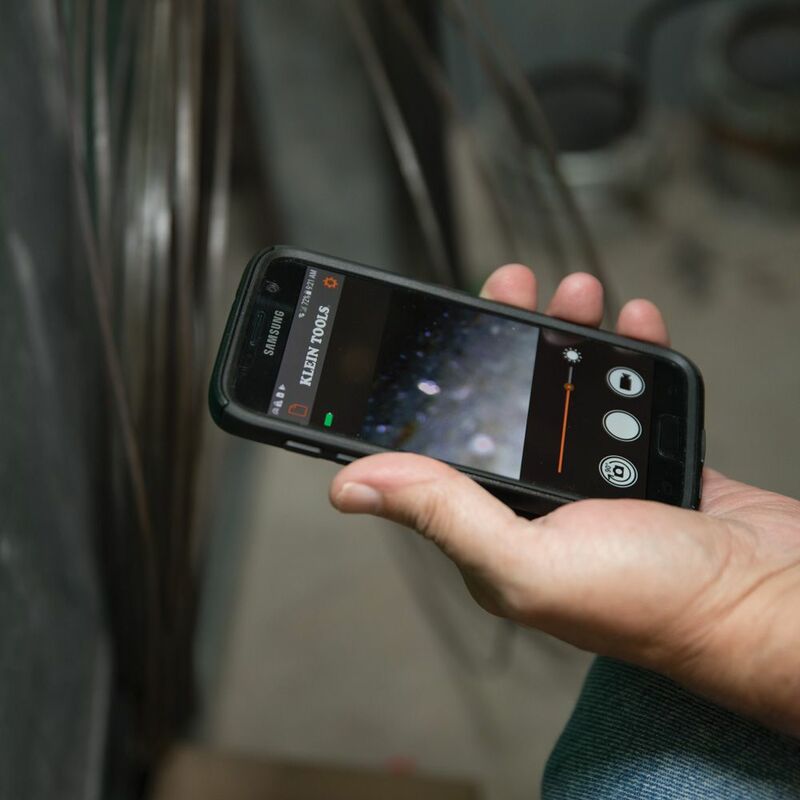 Keep your larger cell phone safely stored away in the Klein Tools Tradesman Pro™ Phone Holder. 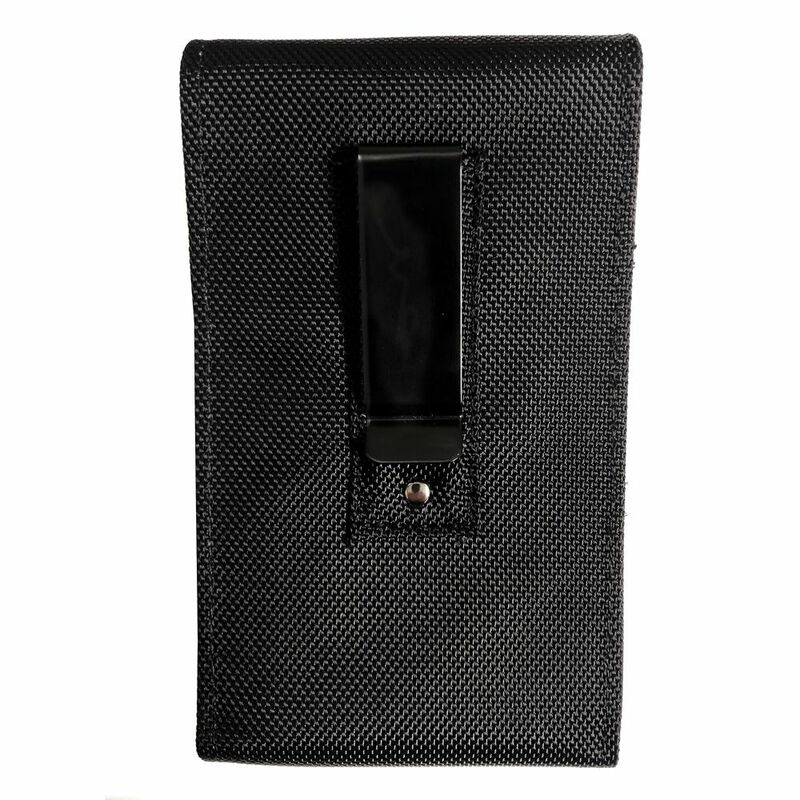 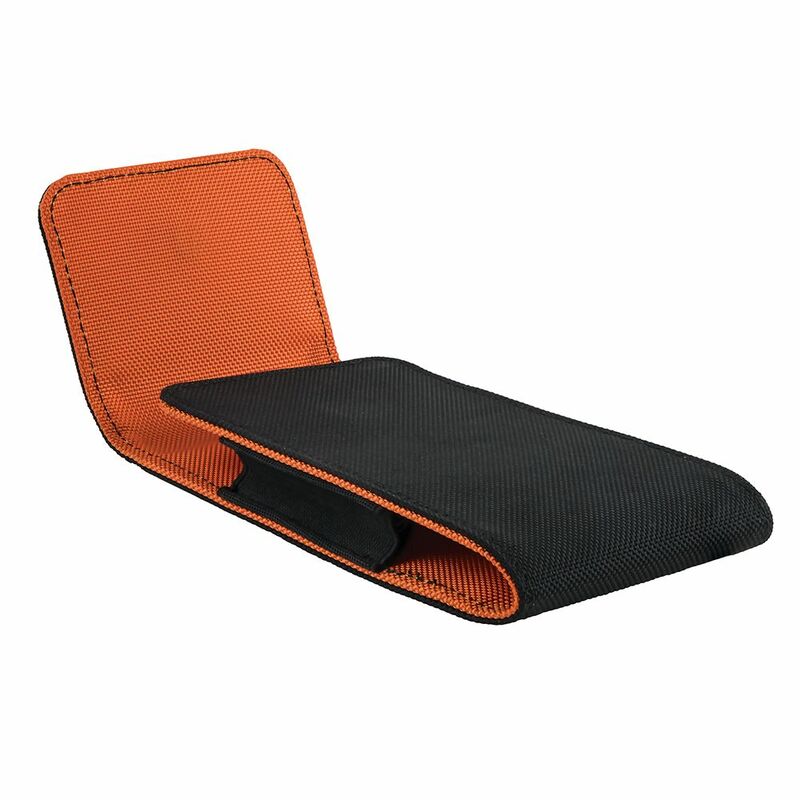 Even in their protective case, cell phones will easily fit in the phone holder. 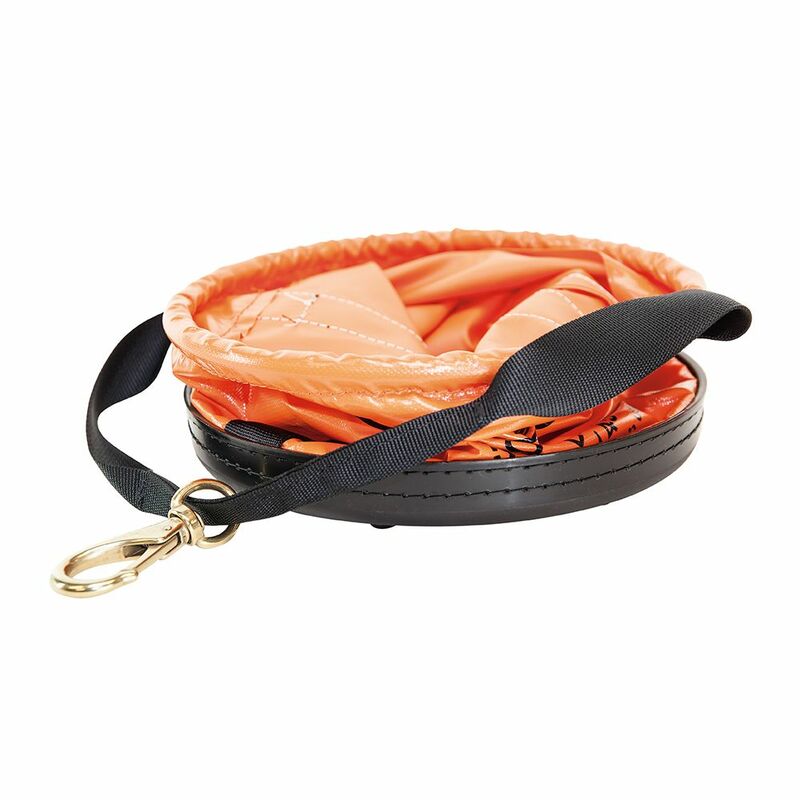 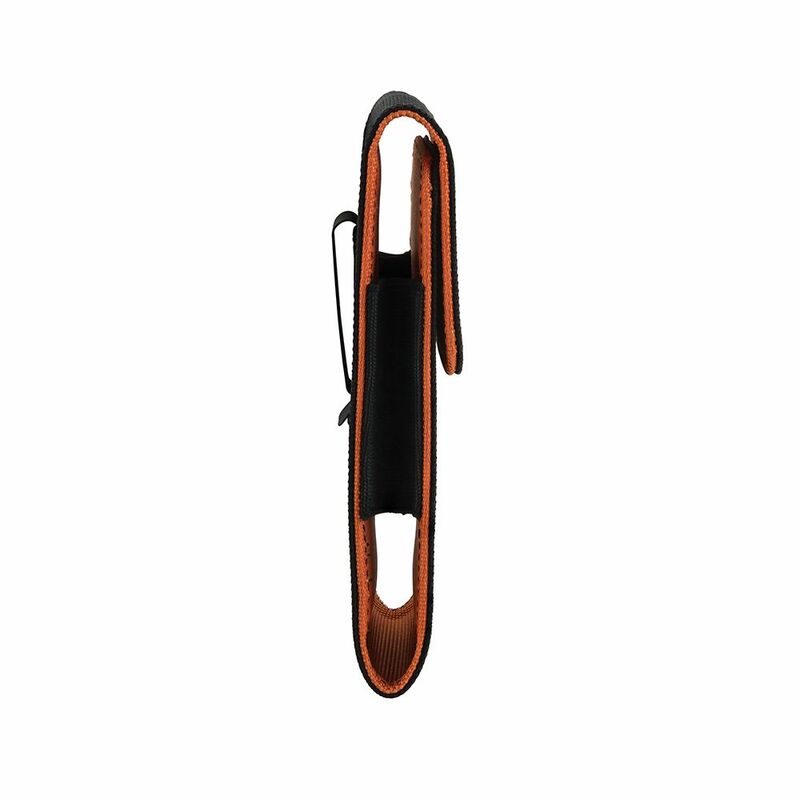 Constructed with durable 1680d ballistic weave, it has a durable metal clip that attaches to belts up to 2-Inch wide. 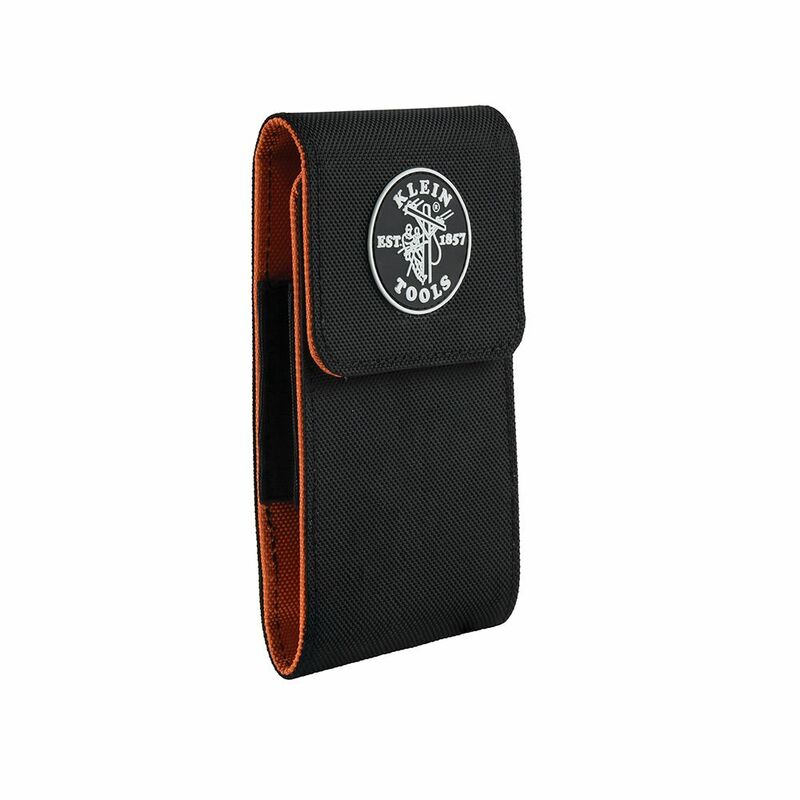 Designed to hold an iPhone 6 Plus, 7 Plus, 8 Plus, Samsung Galaxy® S7, S8, S8 Plus, S9, S9 Plus, Note® 7, Note® 8, Note® Edge, and similar sized phones. 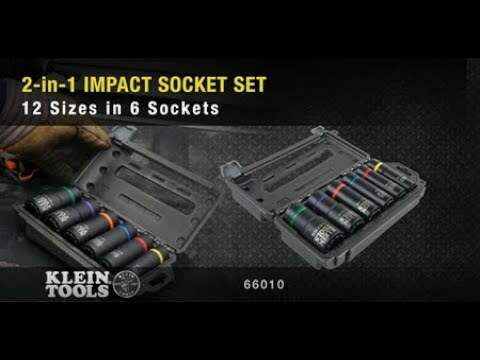 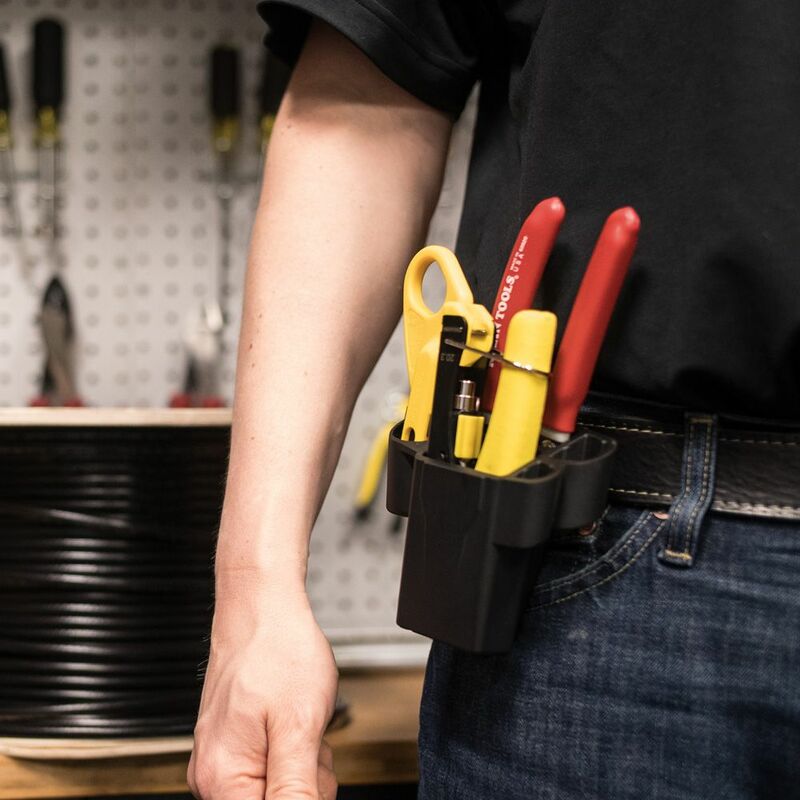 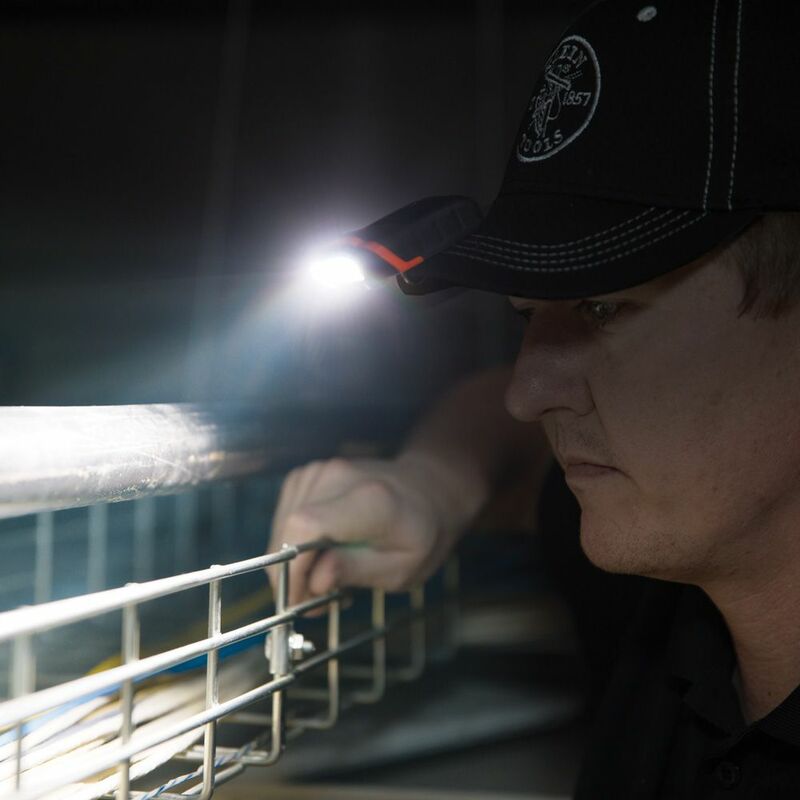 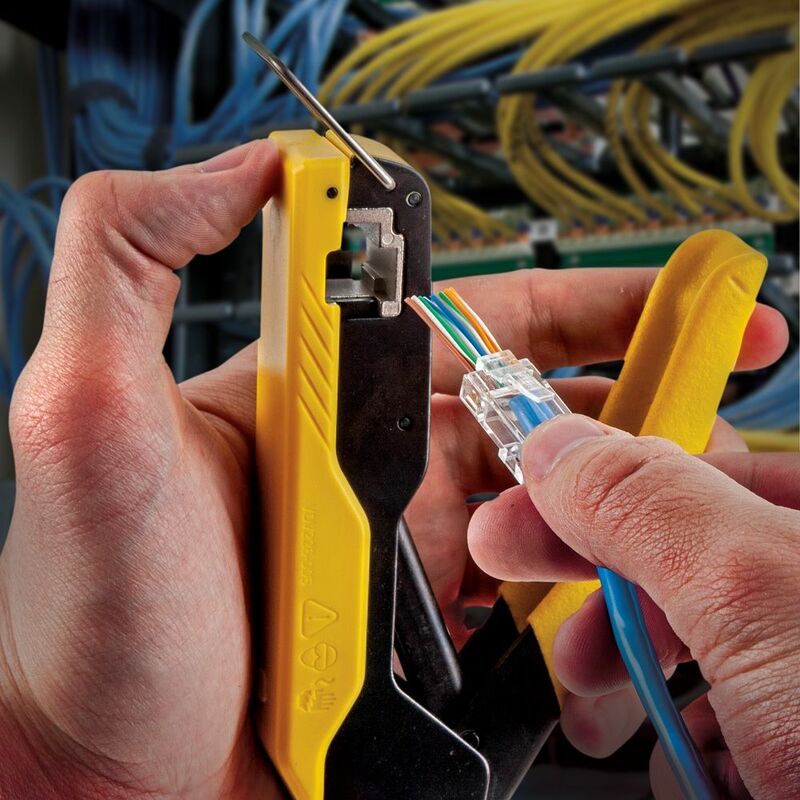 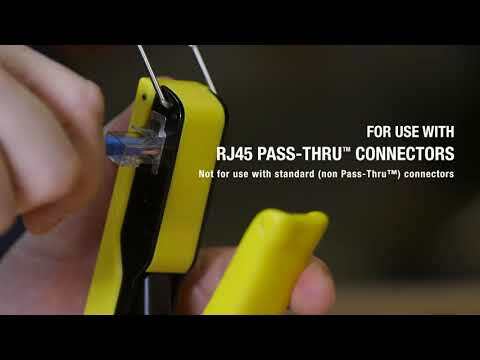 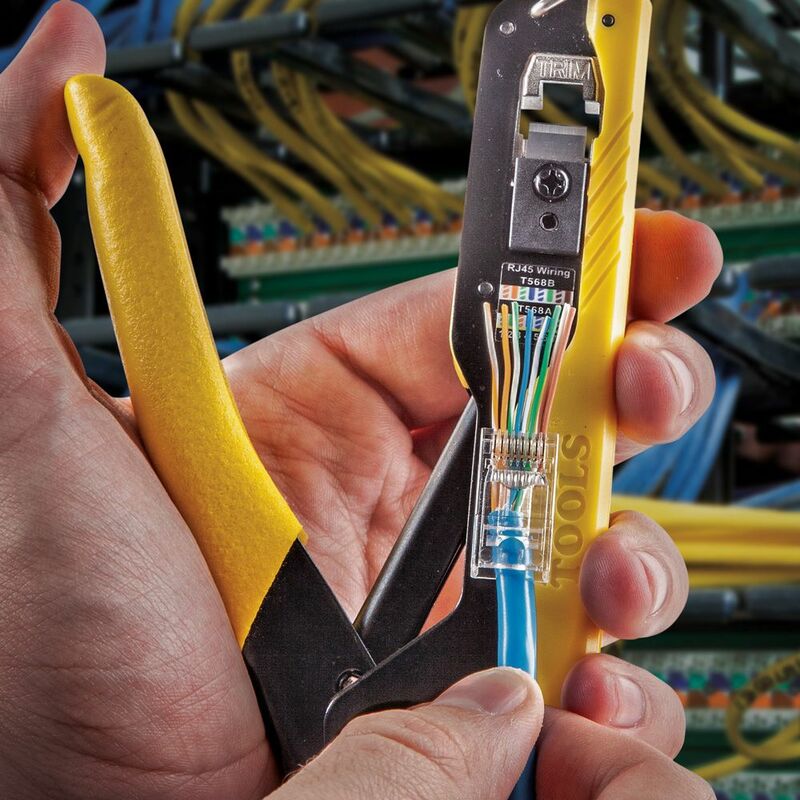 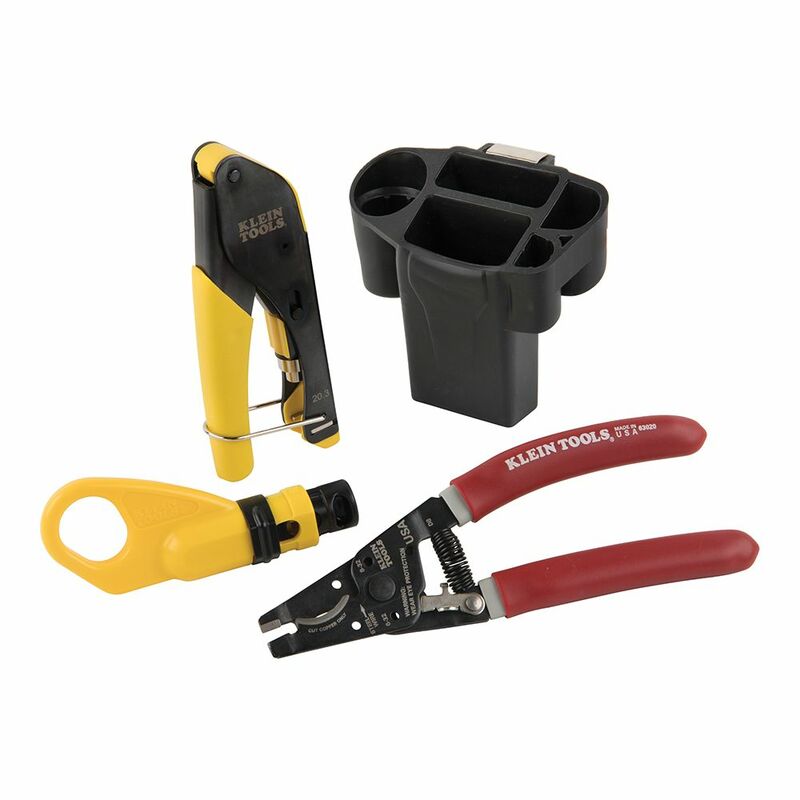 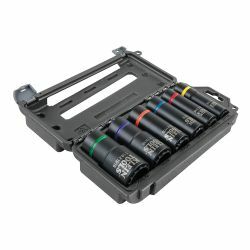 This Coax Installation Kit has all the tools needed to prepare and connect compression F-connectors to RG59/RG6/6Q cables. 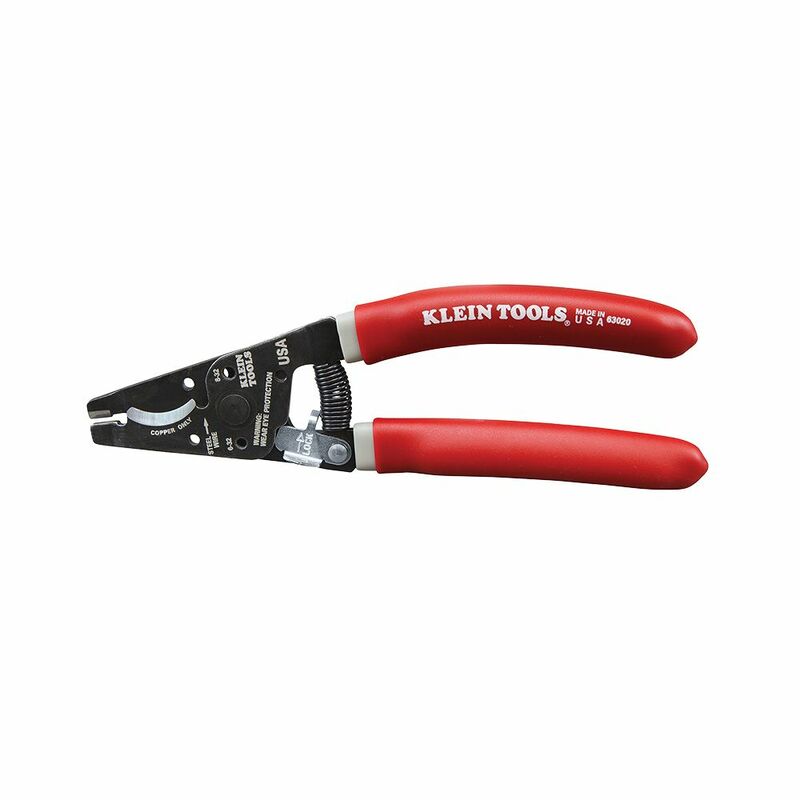 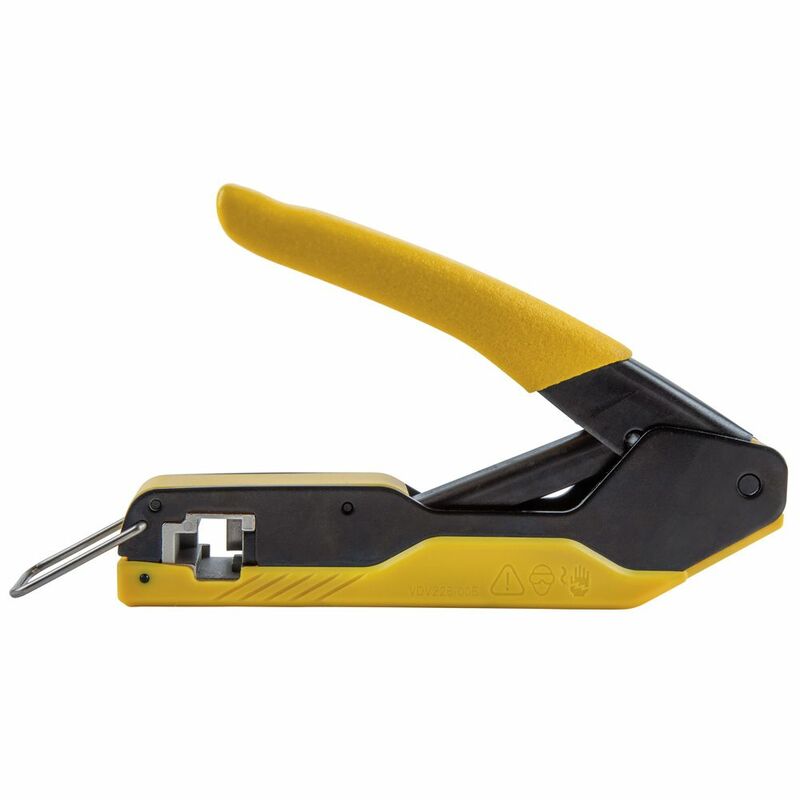 The kit includes a Radial Stripper (VDV110-061), Multi-Cable Cutter (63020) and Compression Crimper (VDV212-008). 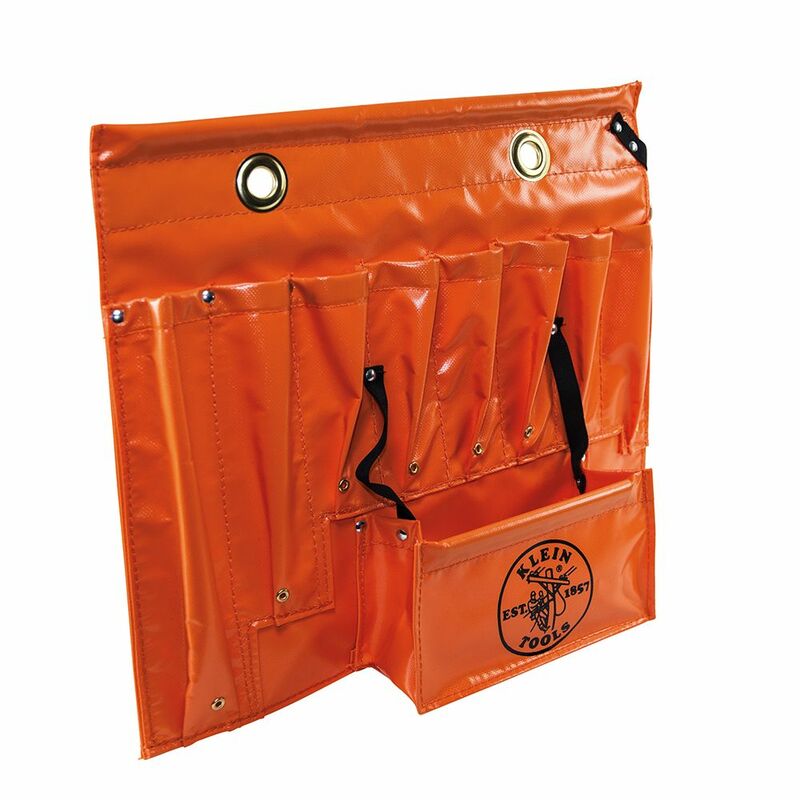 The convenient molded hip pouch features a flat bottom to stand on its own as a tool caddy or use the durable metal clip to attach to a belt. 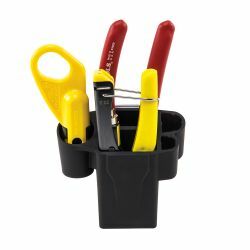 Extra loops on the pouch hold additional tools. 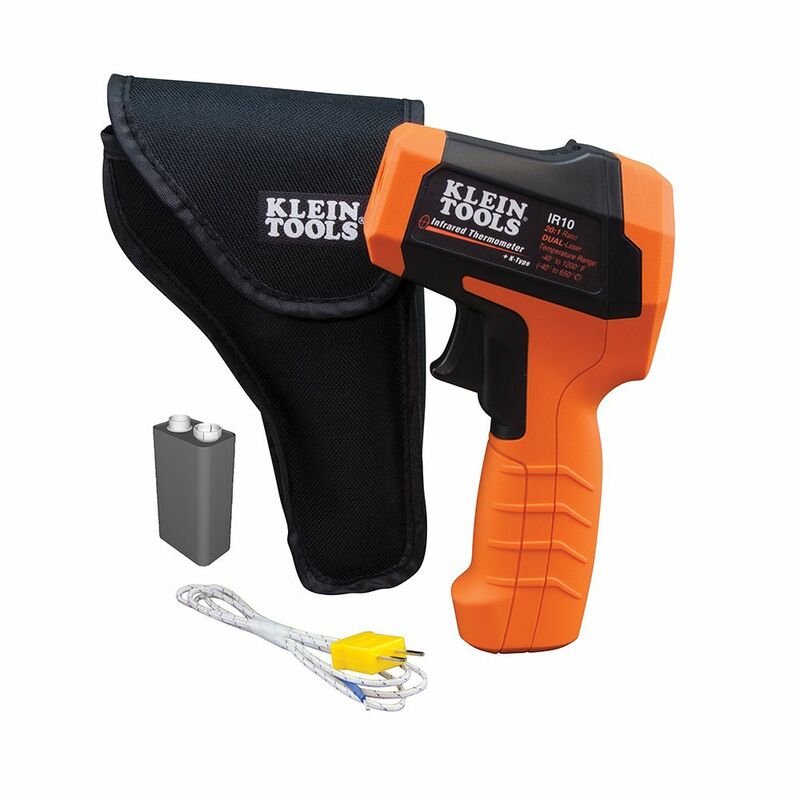 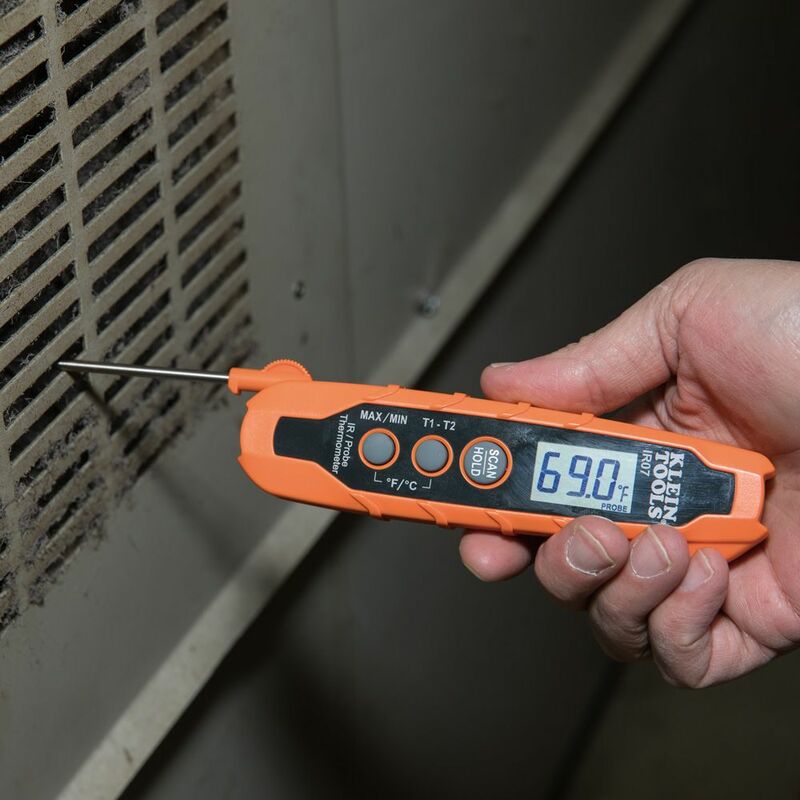 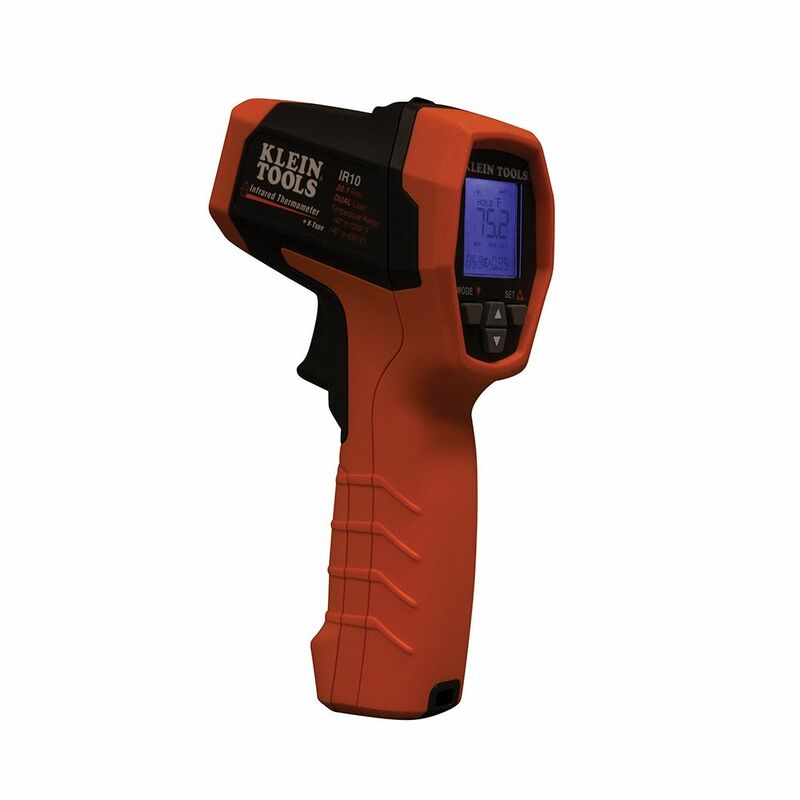 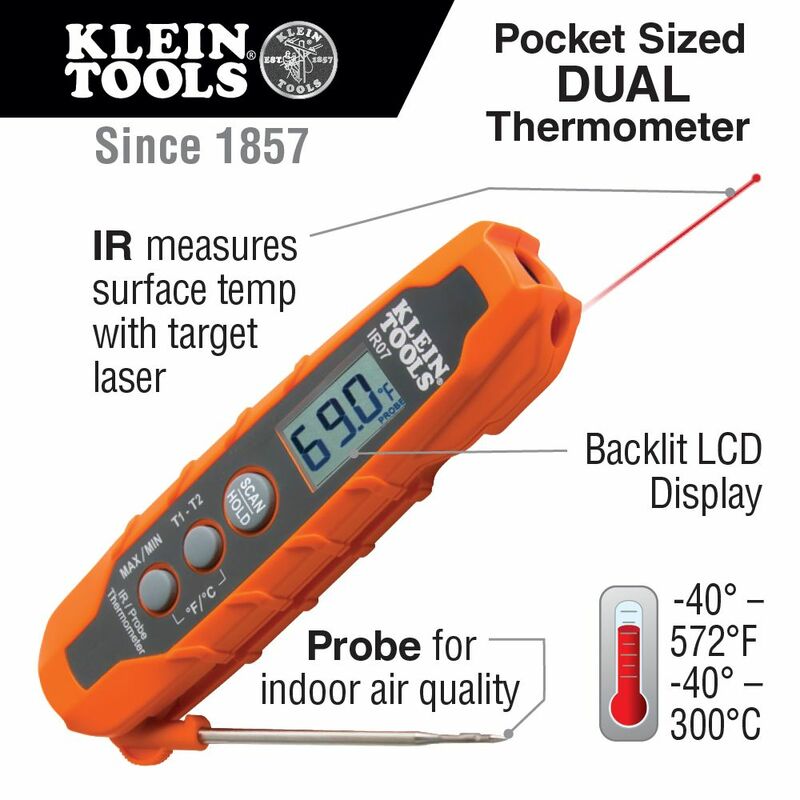 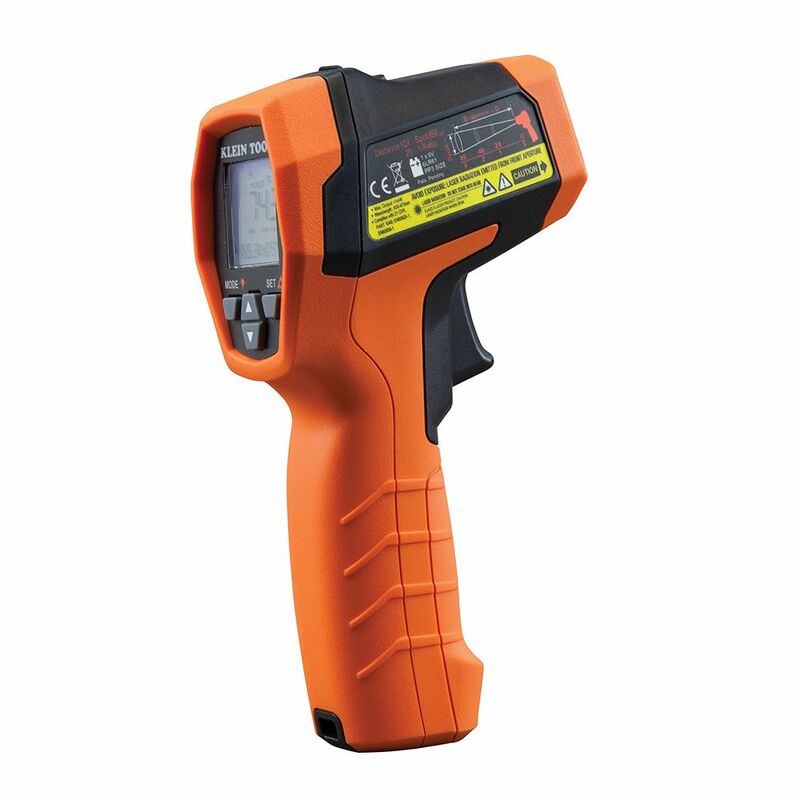 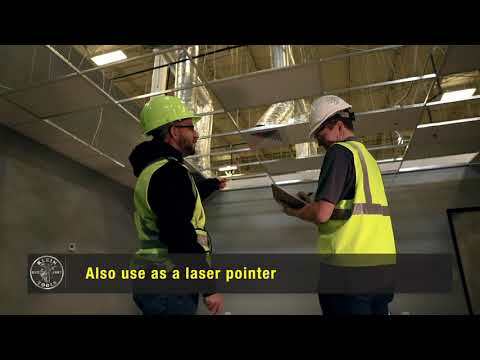 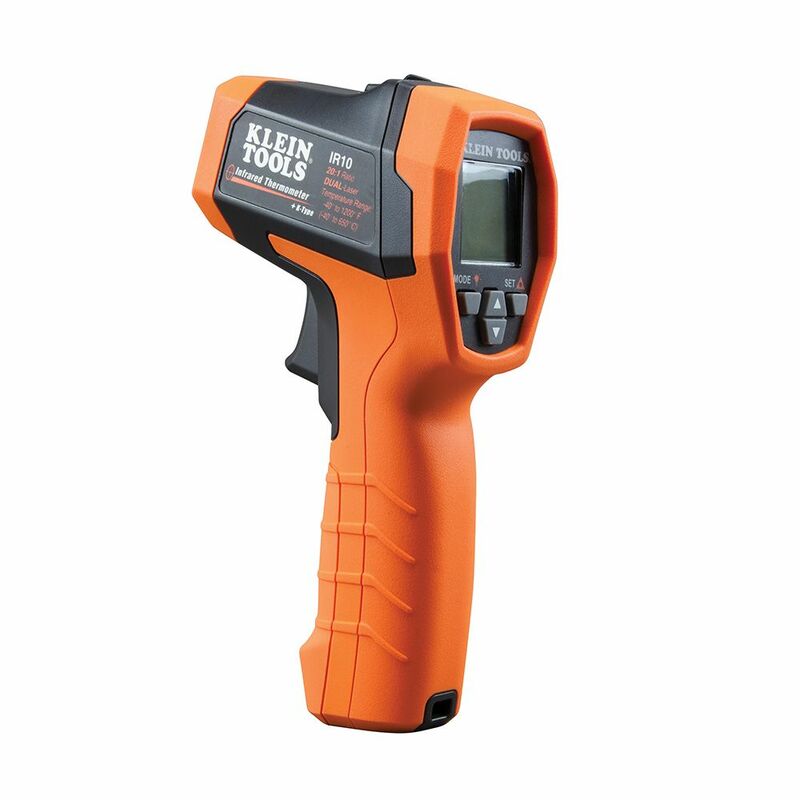 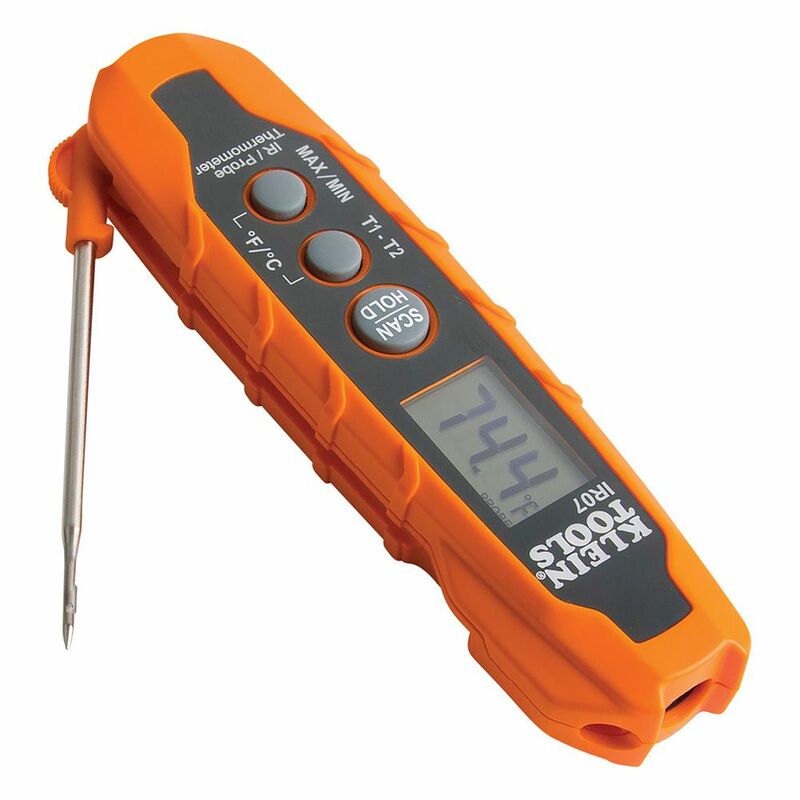 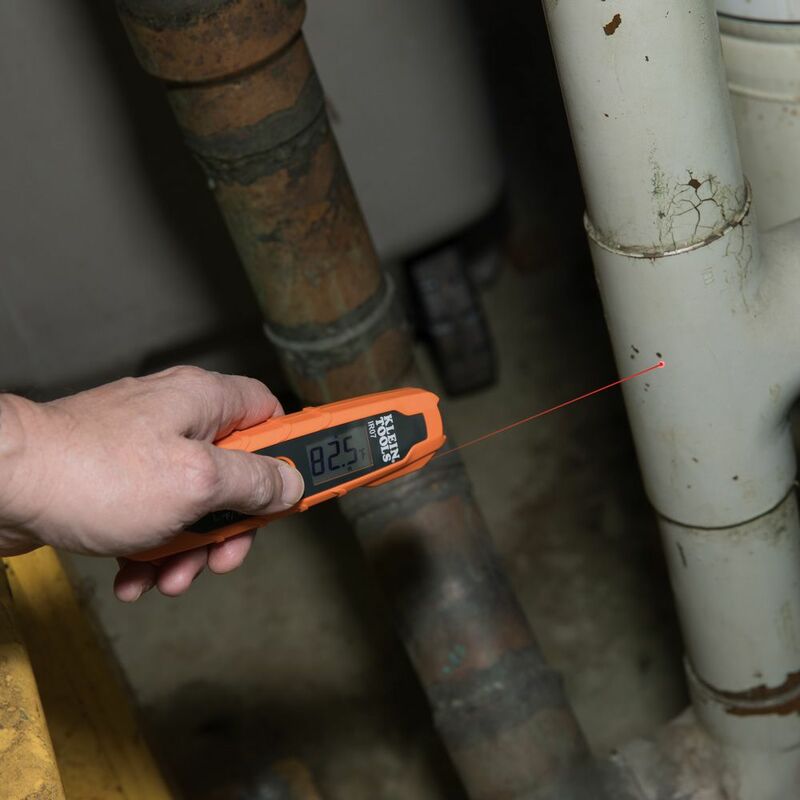 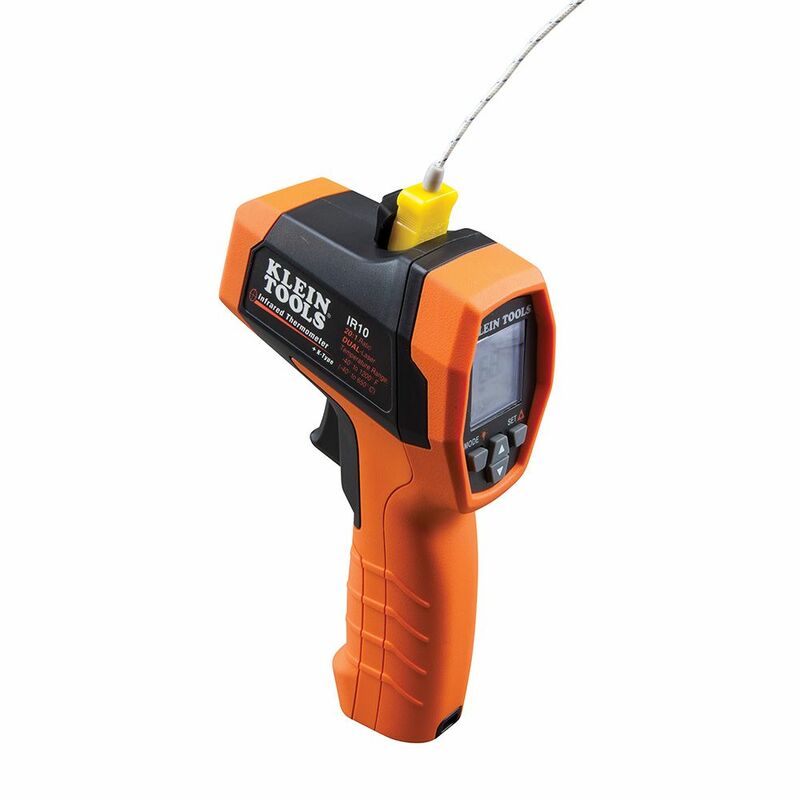 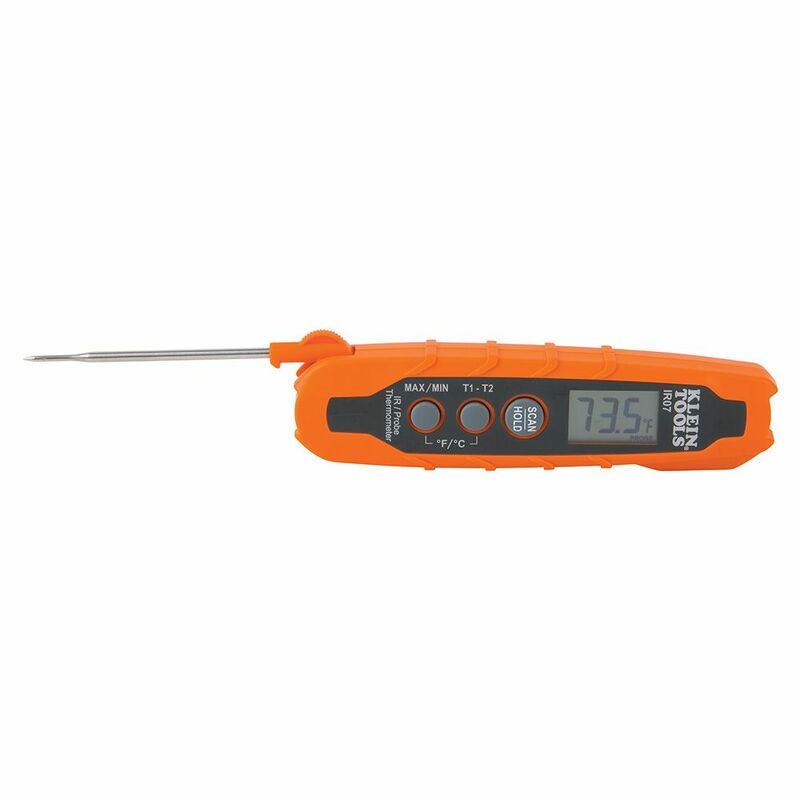 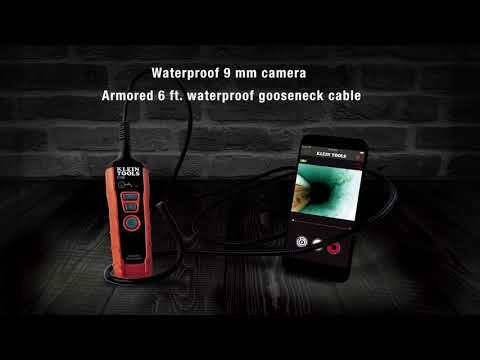 Klein Tools IR10 is a professional dual targeting laser infrared (IR) thermometer. 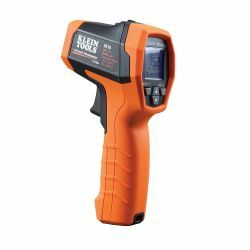 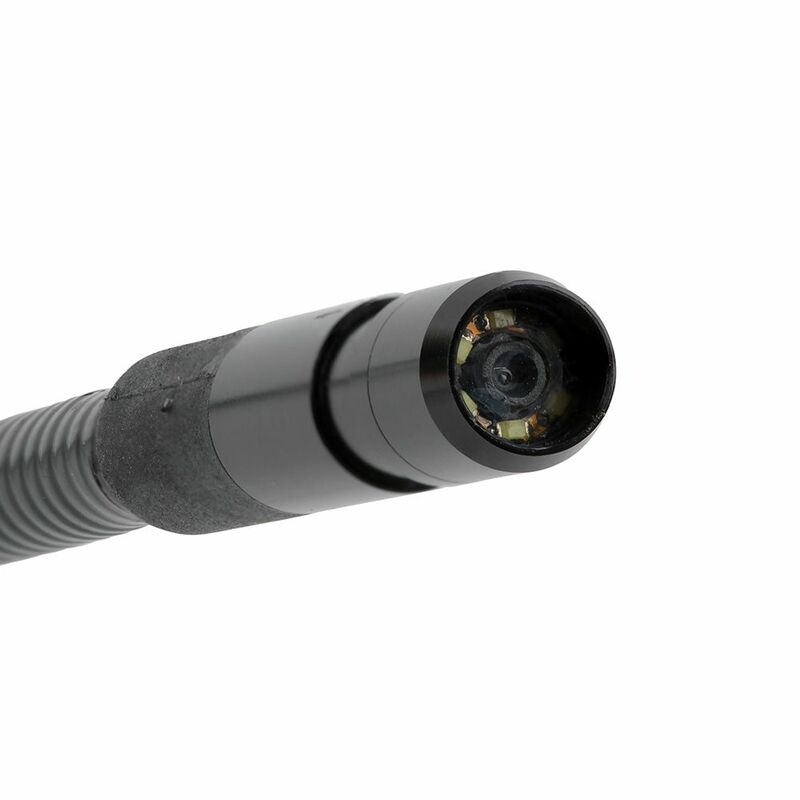 It offers a wide measurement range, a tight 20:1 distance-to-spot ratio, dual targeting lasers, and several calculation modes to facilitate different temperature measurement applications. 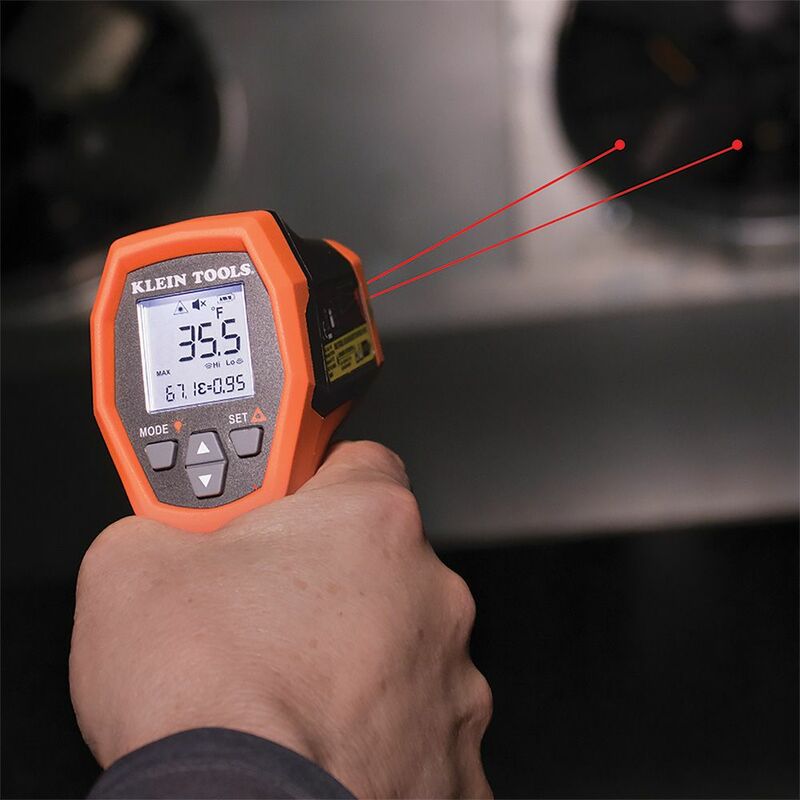 In addition to measuring temperature using IR emission, it can also measure temperature using a standard K-type probe. 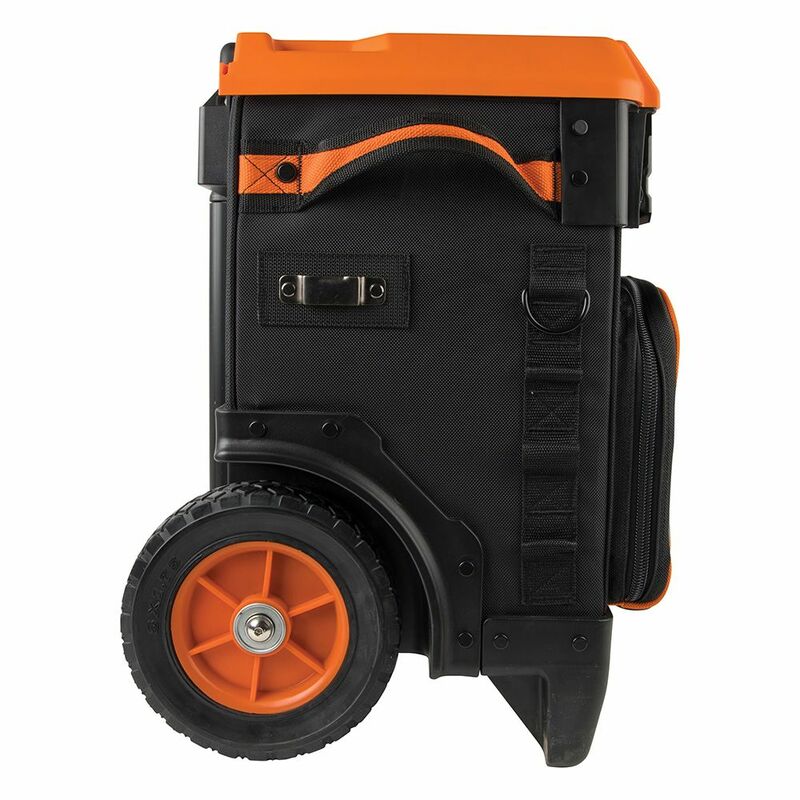 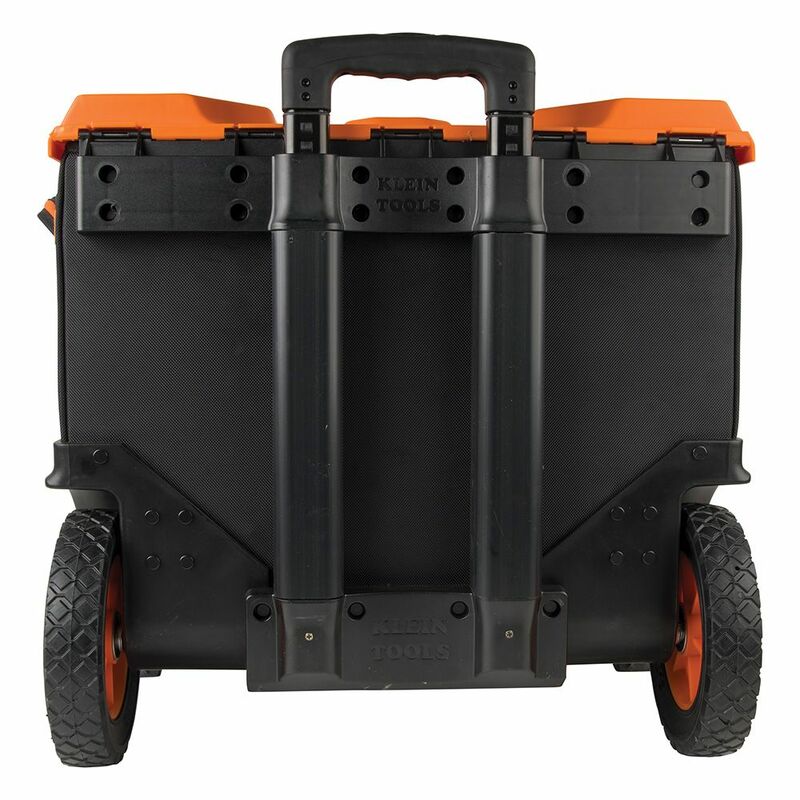 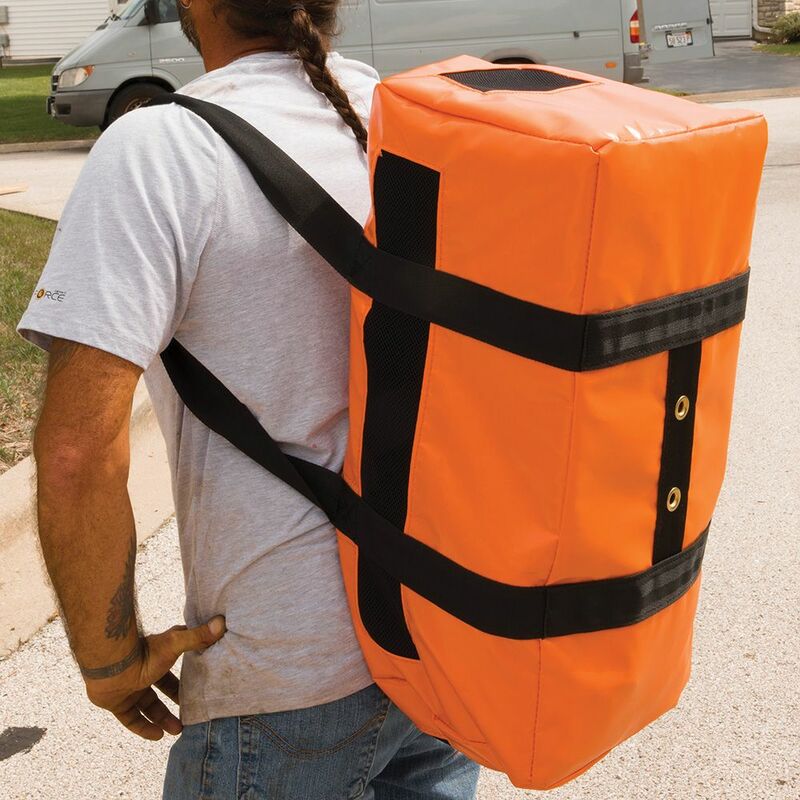 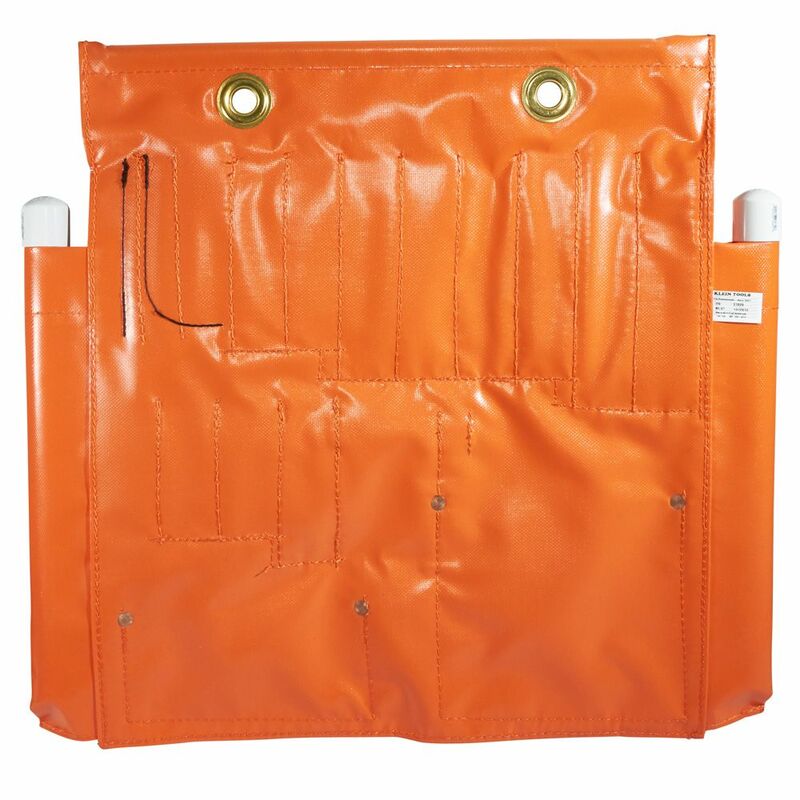 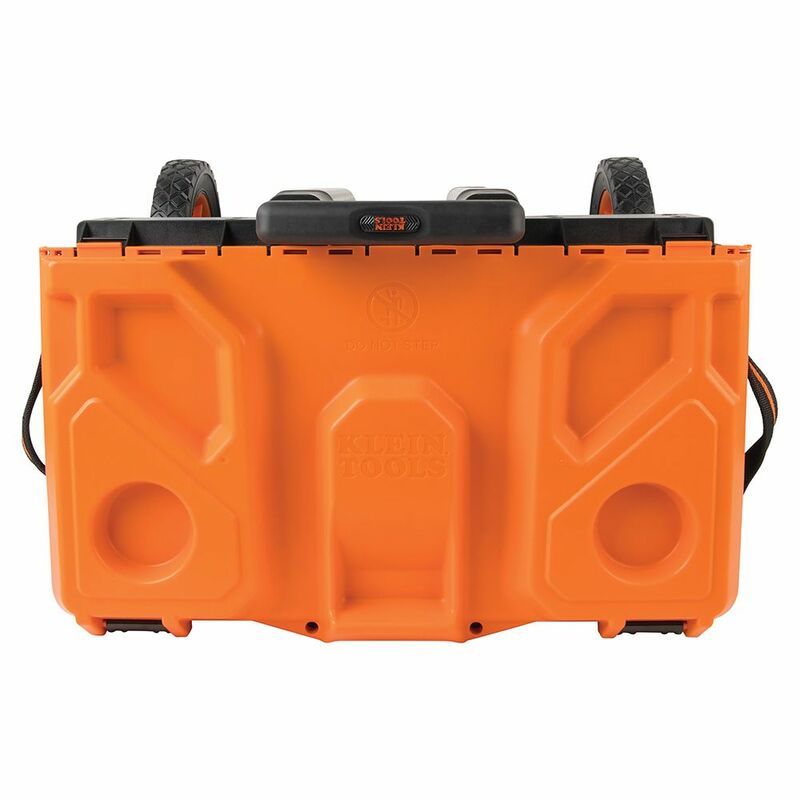 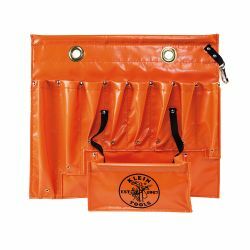 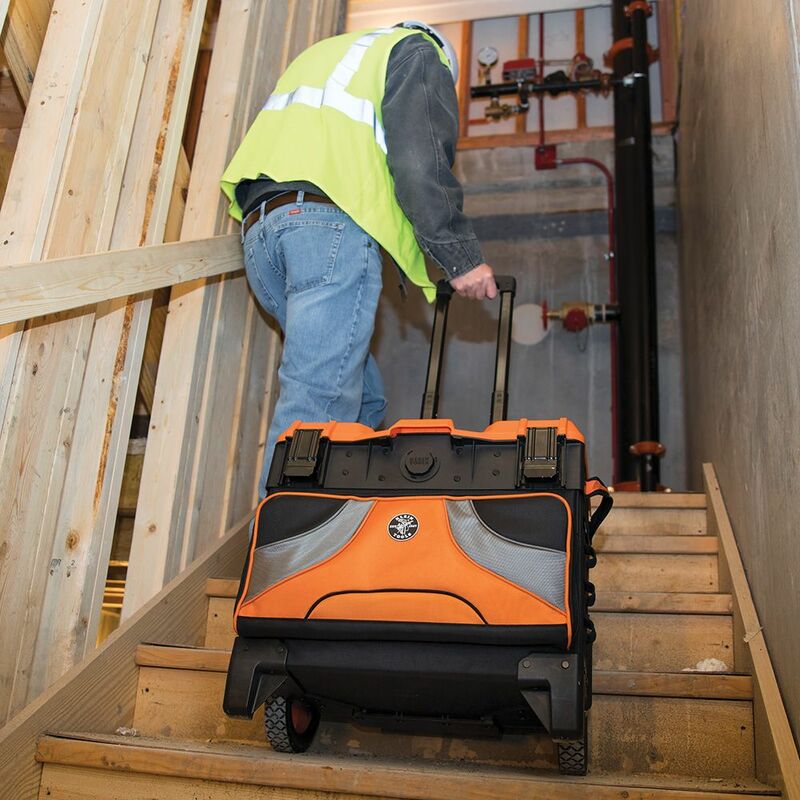 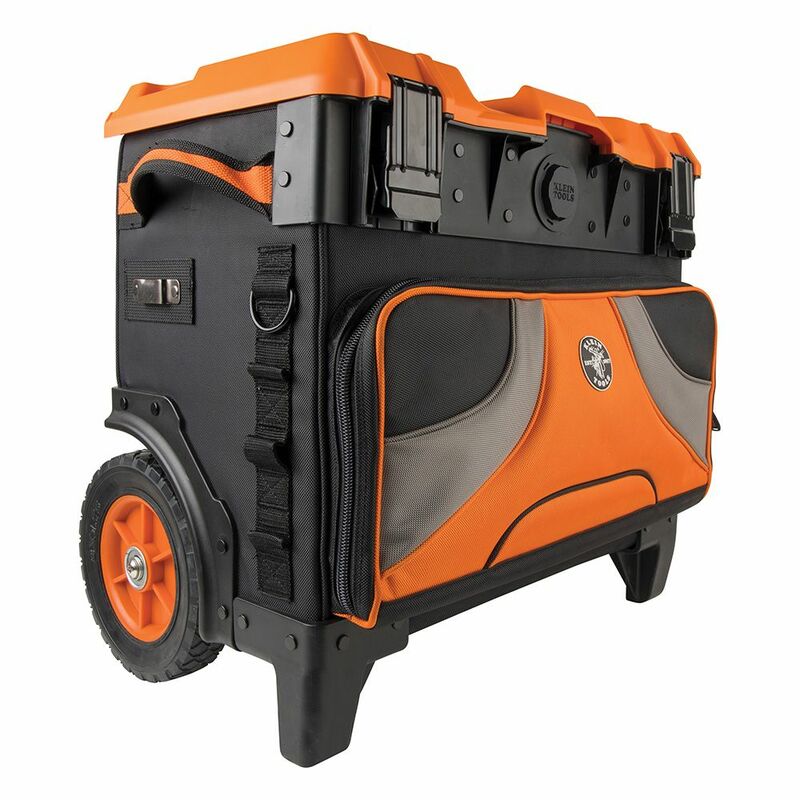 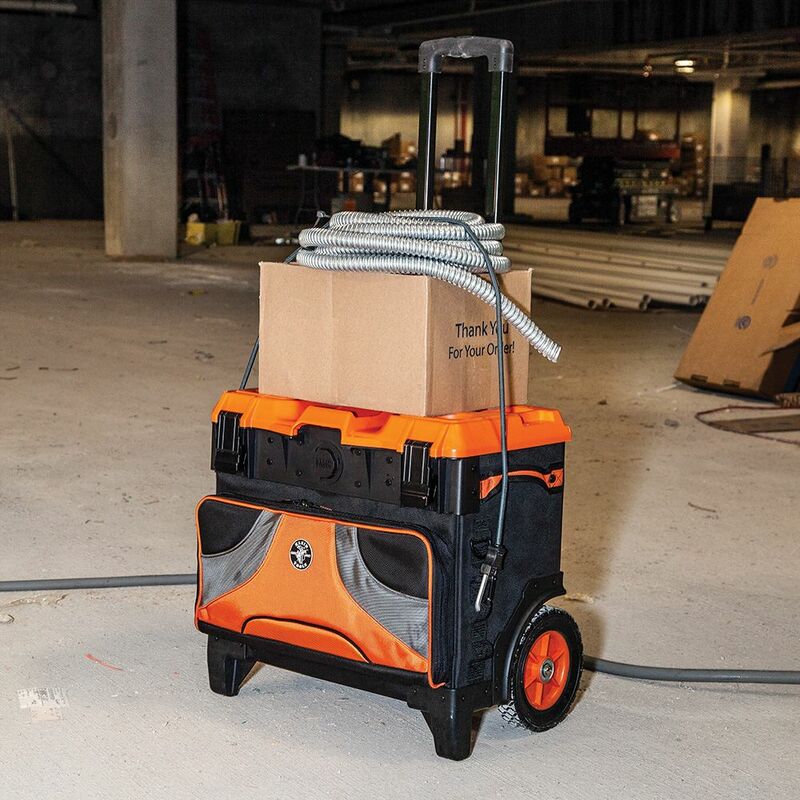 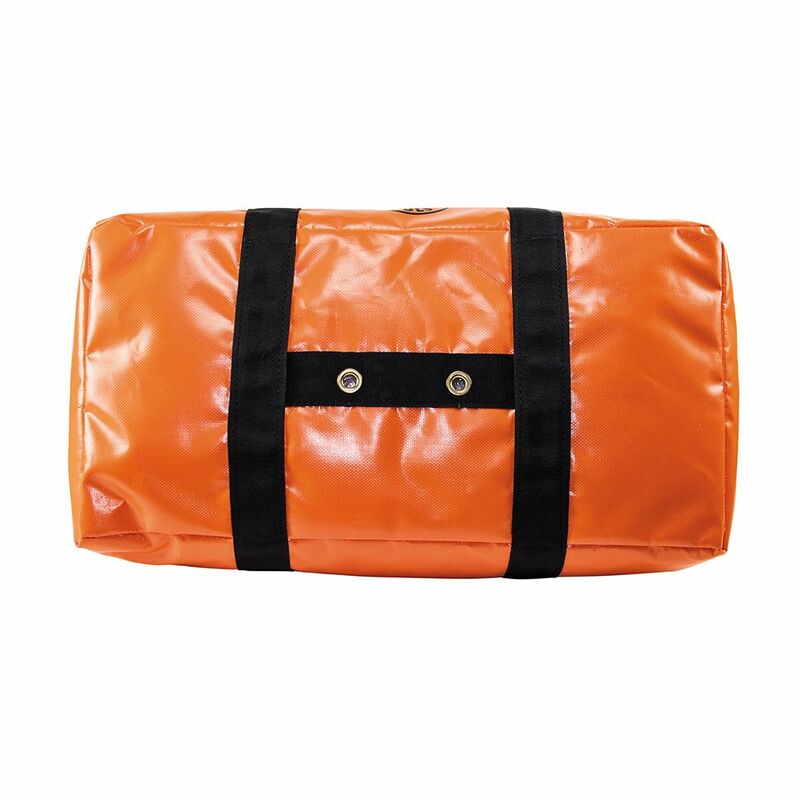 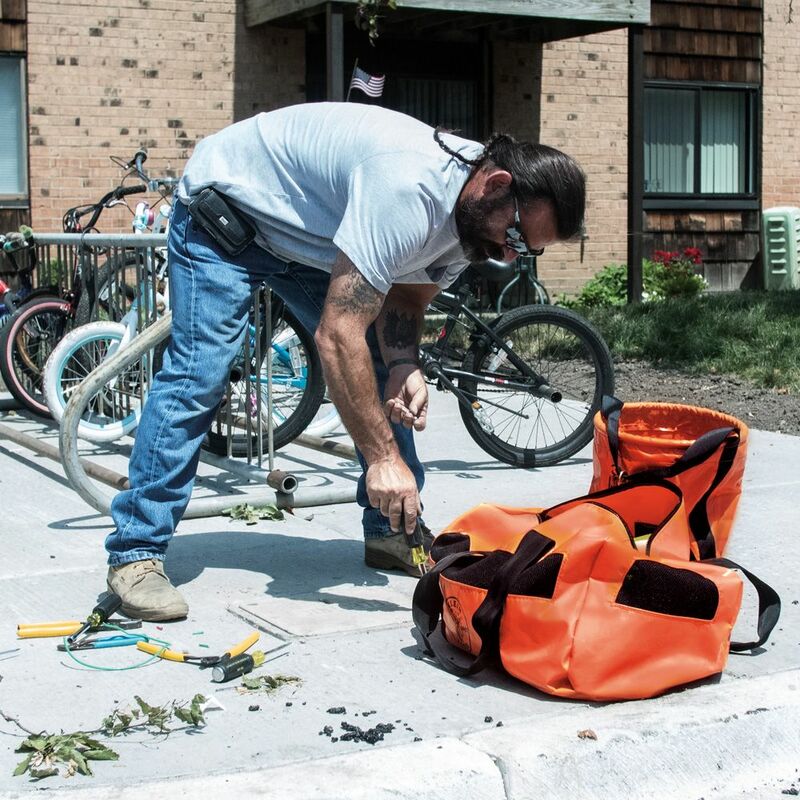 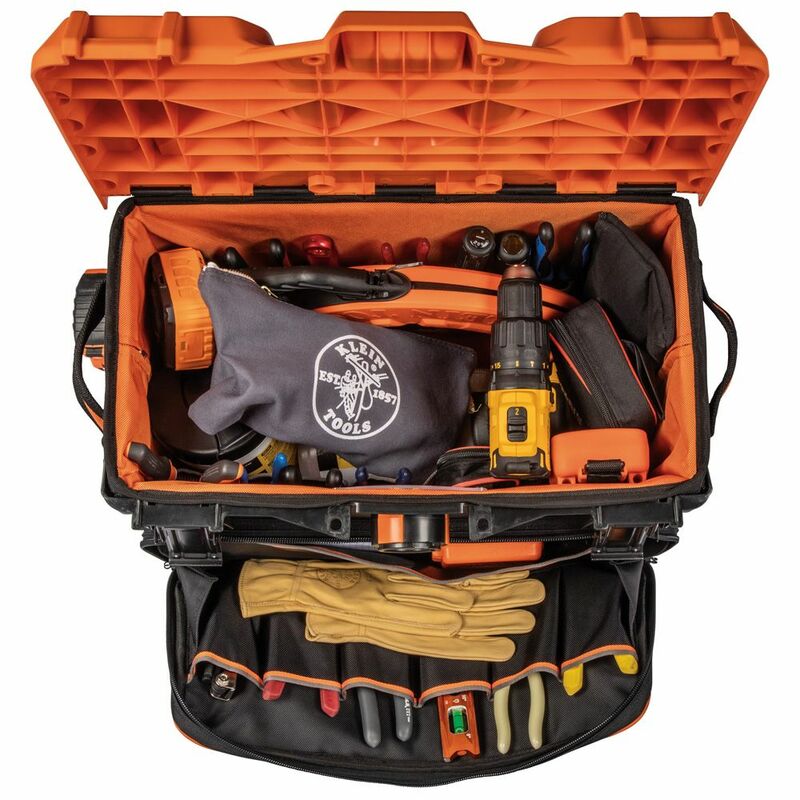 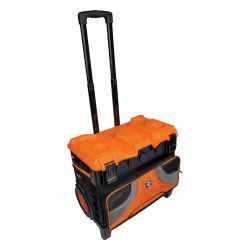 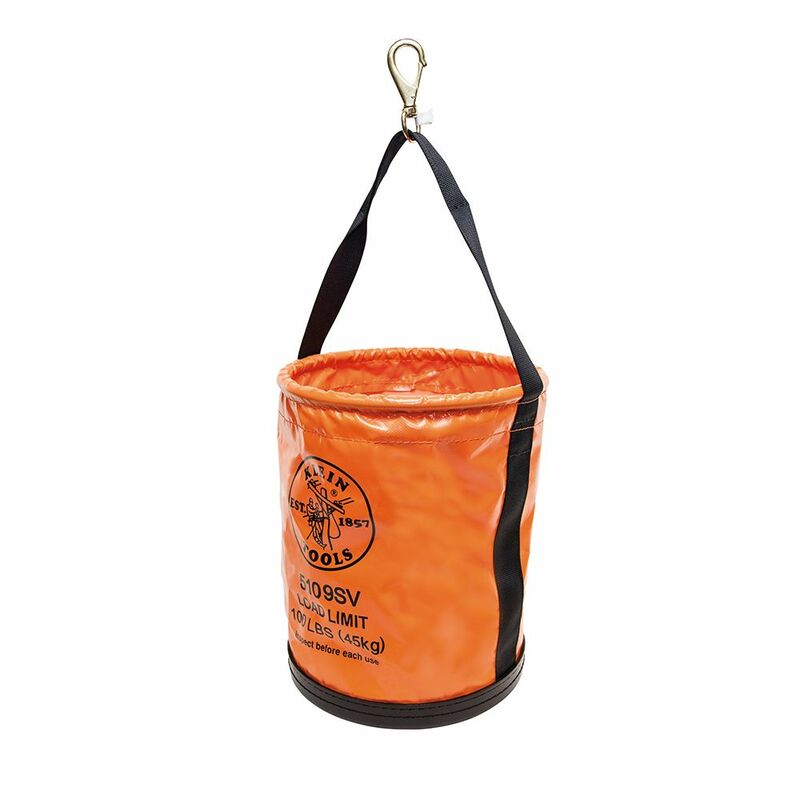 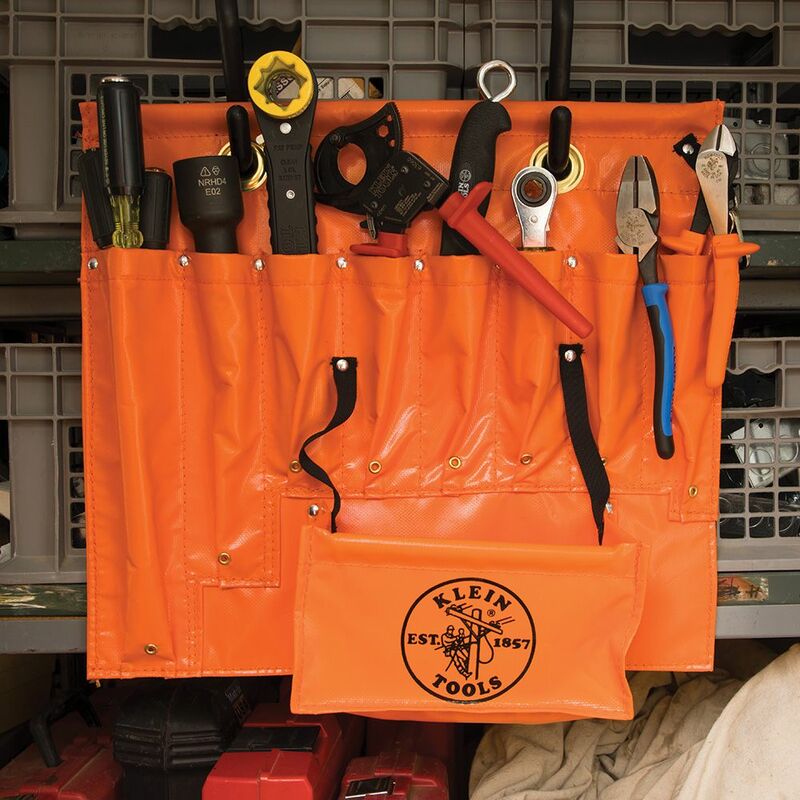 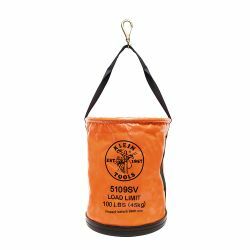 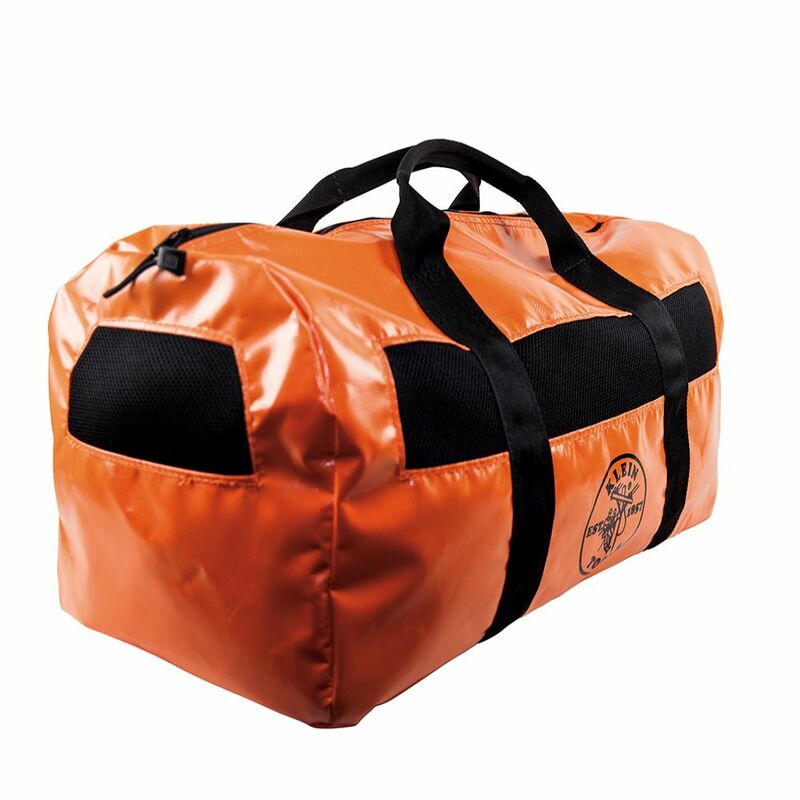 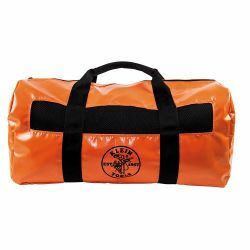 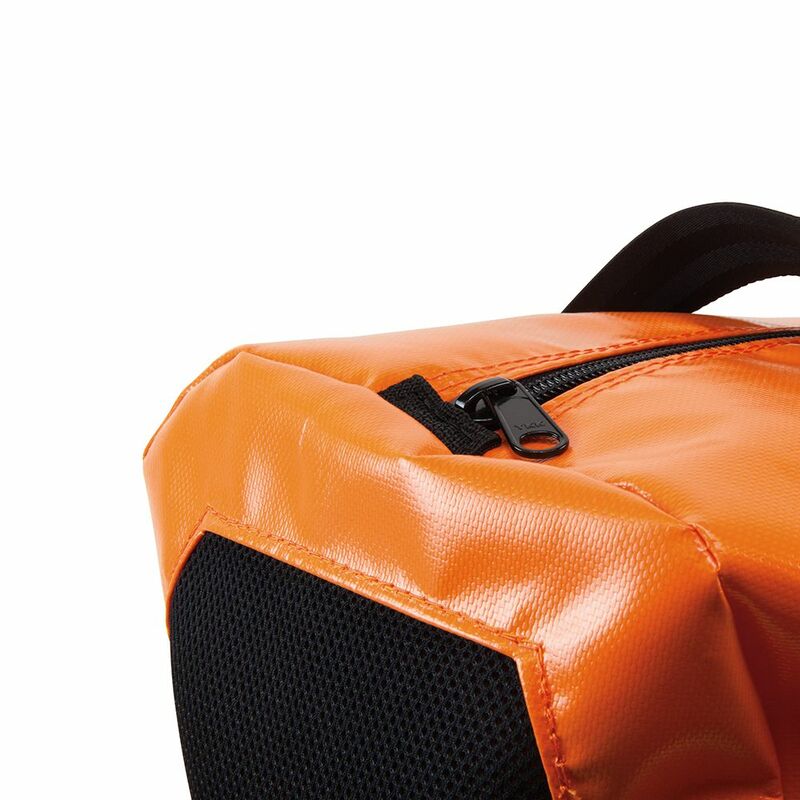 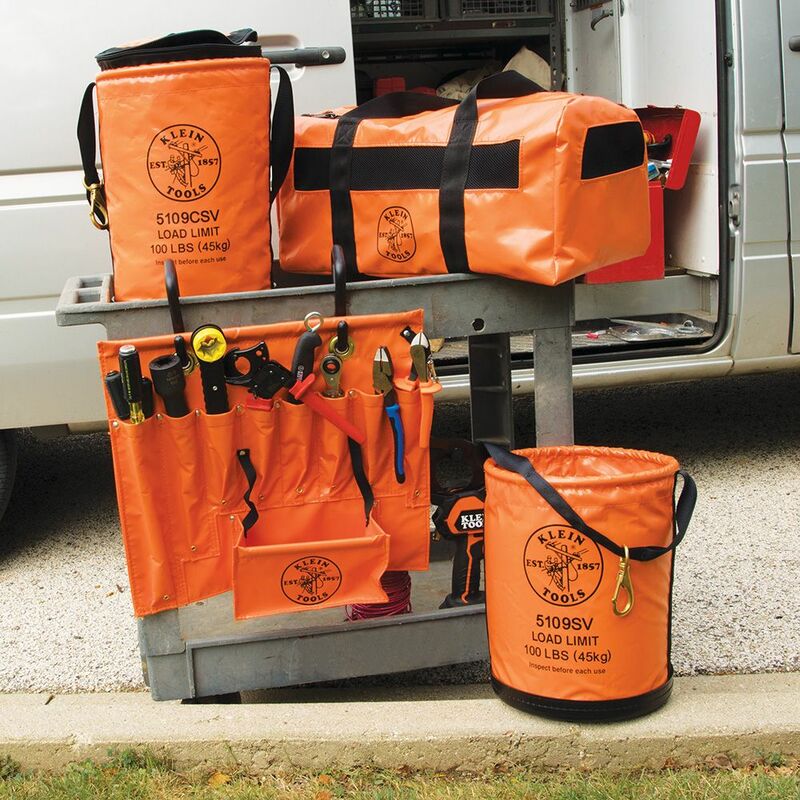 This lightweight duffel bag makes it easy to transport your gear to and from the jobsite.Constructed of orange vinyl with web handles that extend around the bag for extra support. 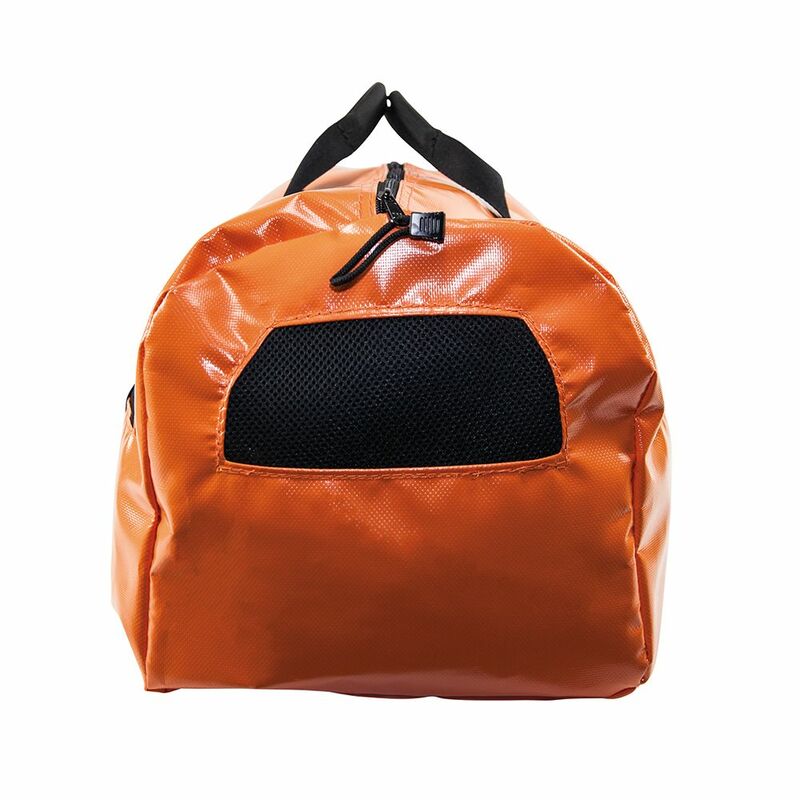 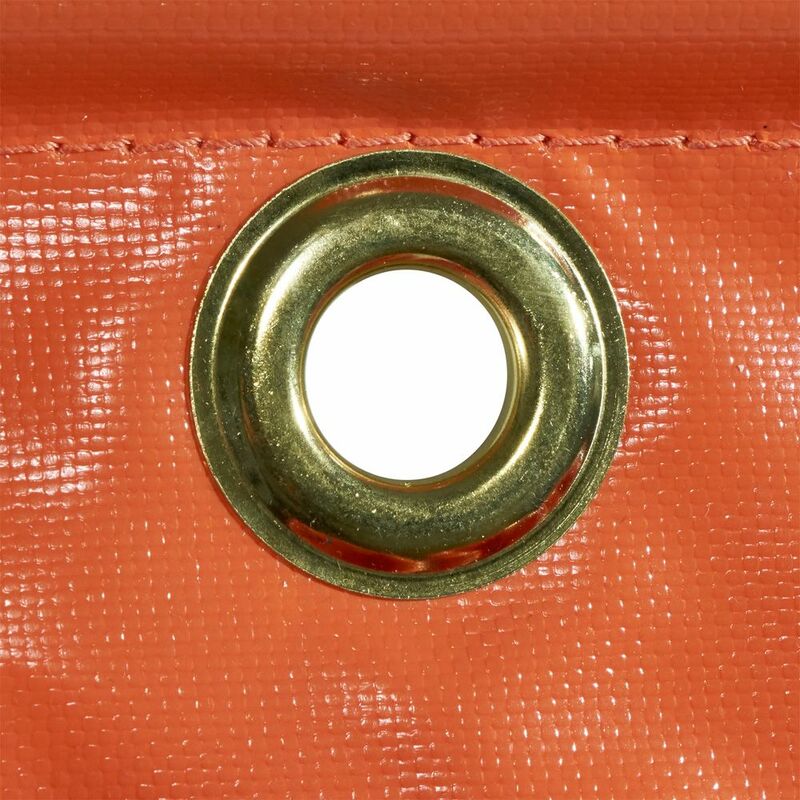 Bag also offers mesh panels and drain holes in the bottom. 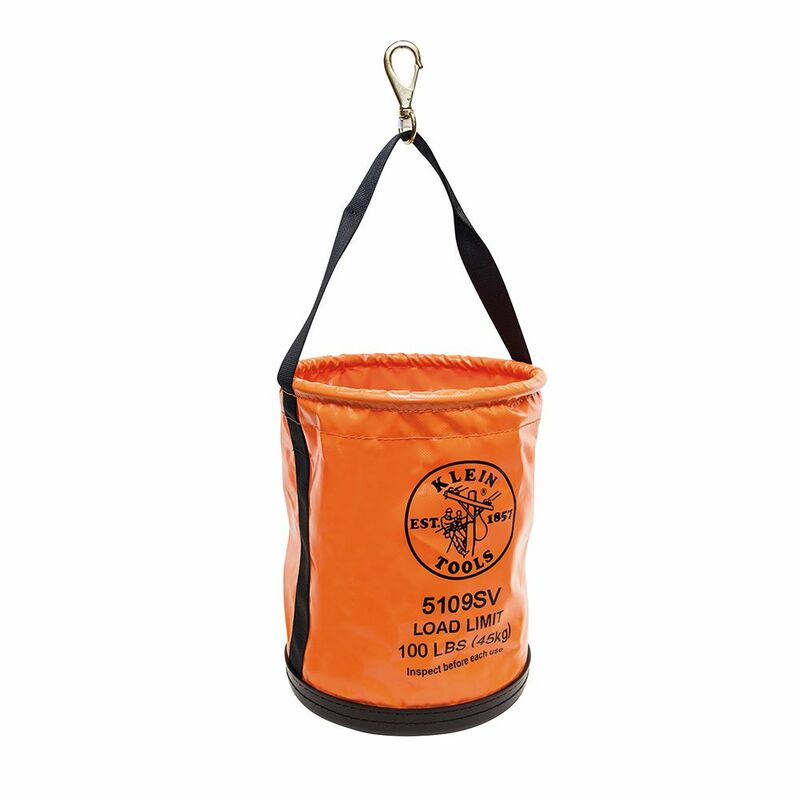 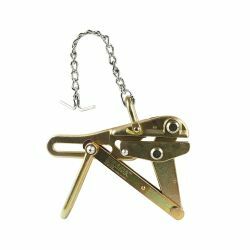 With this aerial apron, you can stay focused on finishing the job, not finding your tools. 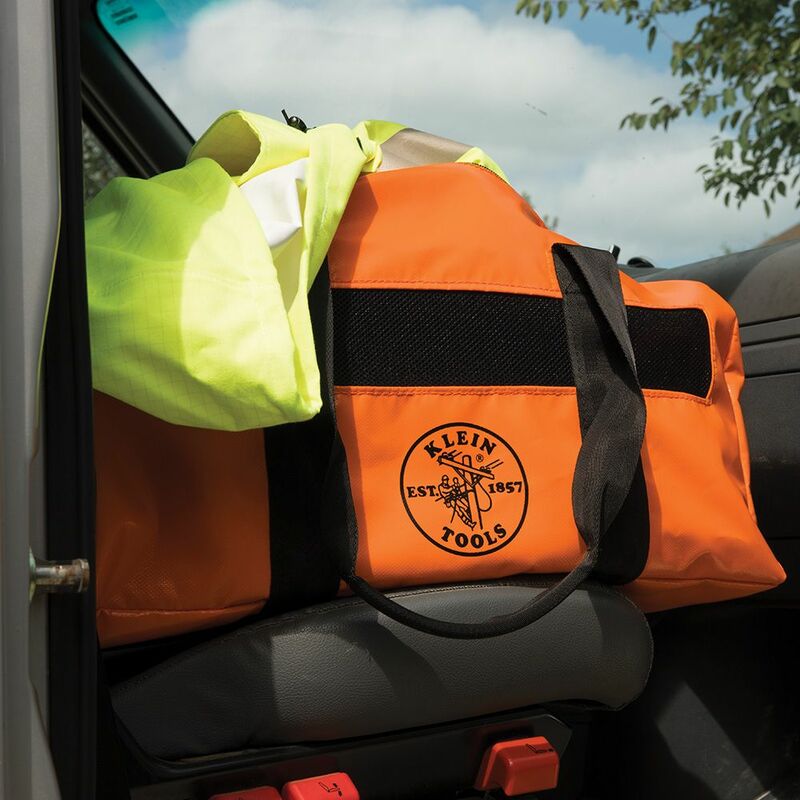 High-viz orange for easy visibility. 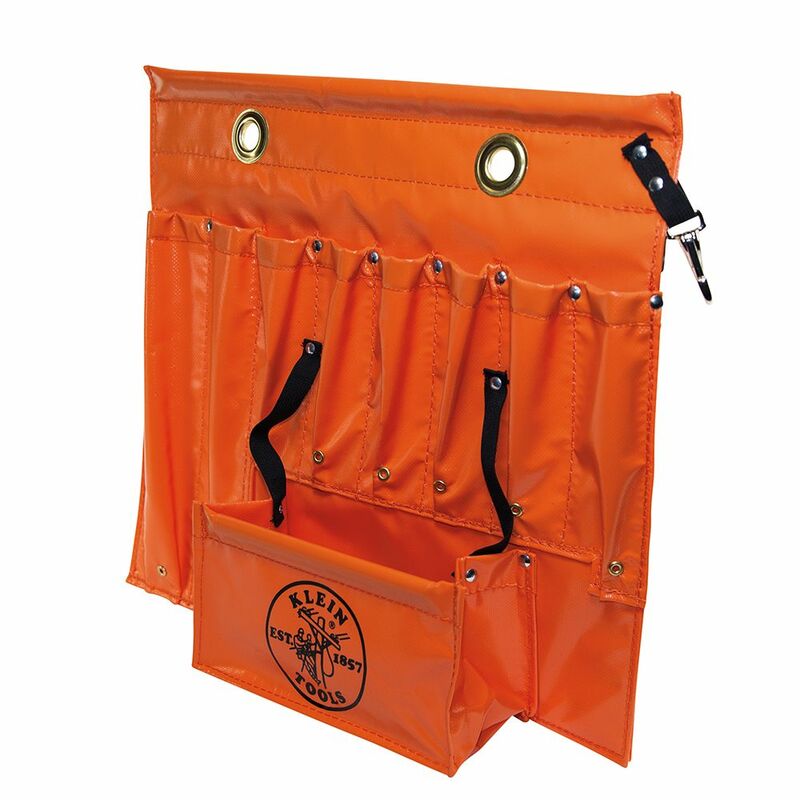 This versatile apron features multiple pockets, pouches, holders, loops and hooks to organize your tools. 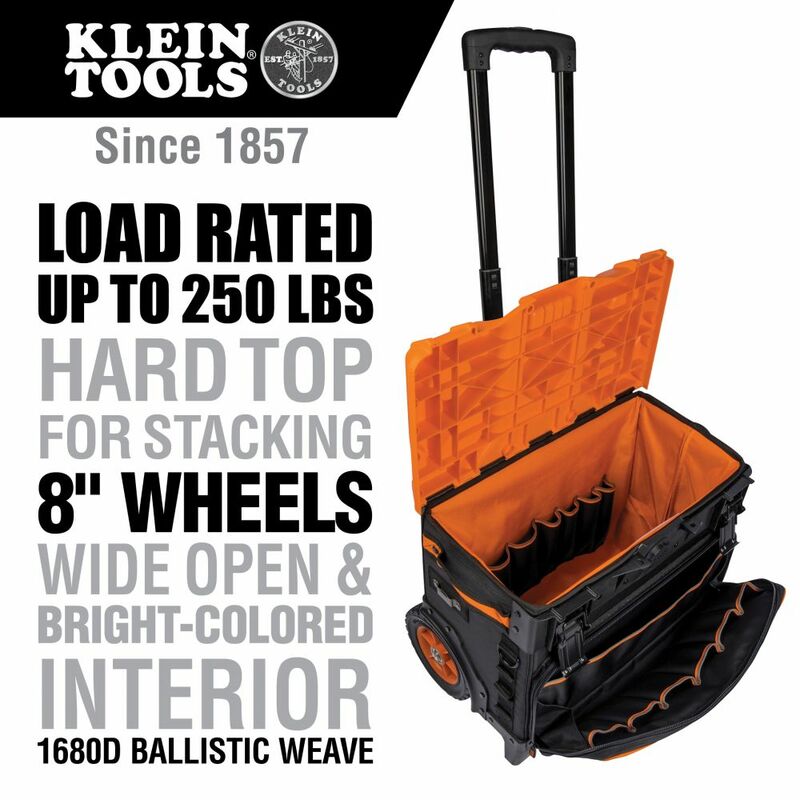 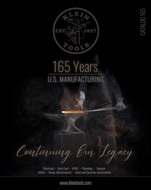 Durably constructed for long life.